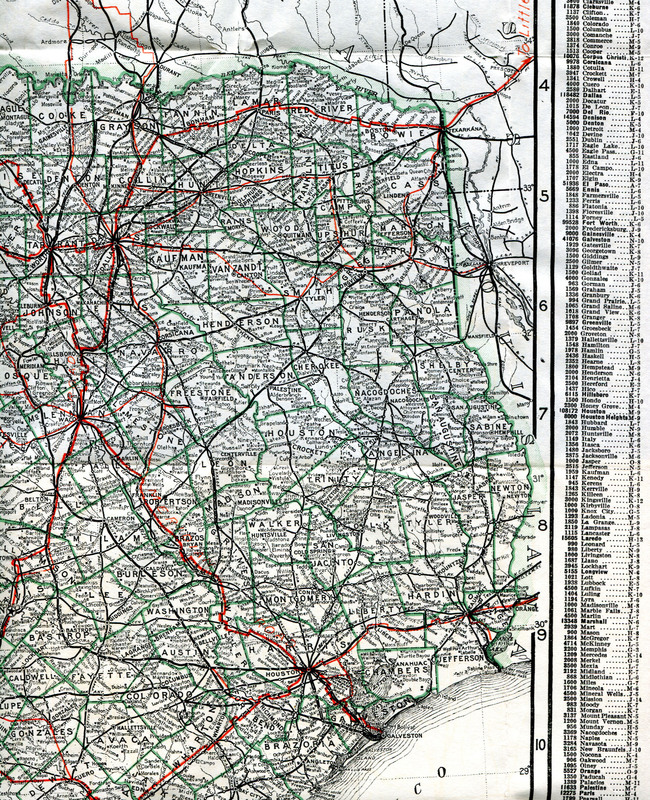 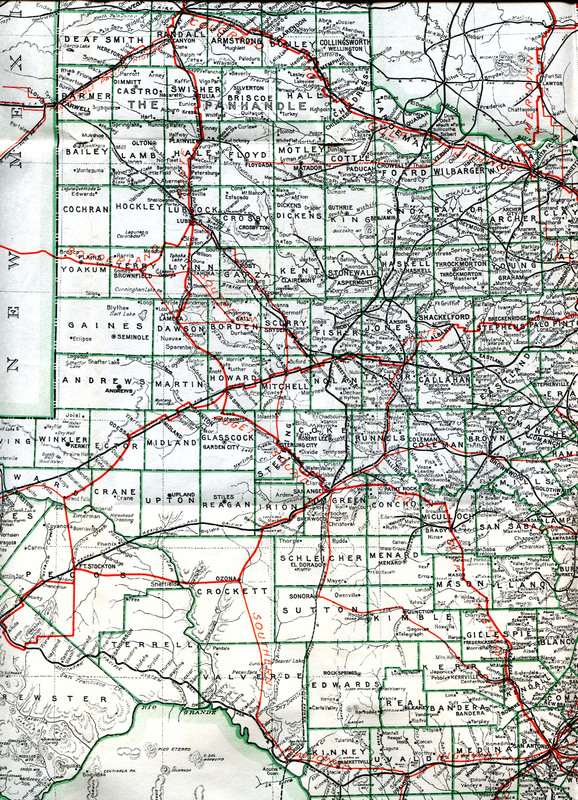 This map shows that there were very few roads in rural areas in 1917 and most rural towns relied on railroads for transportation. 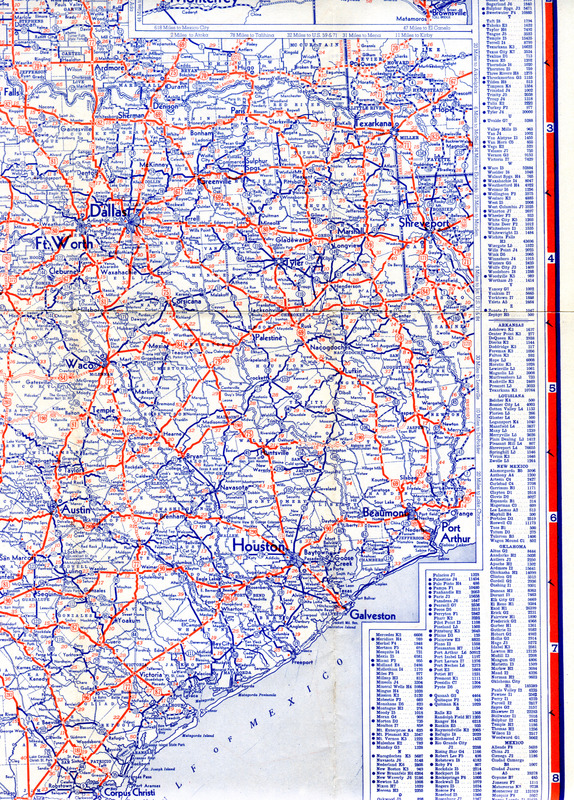 Automobile roads are shown in red. 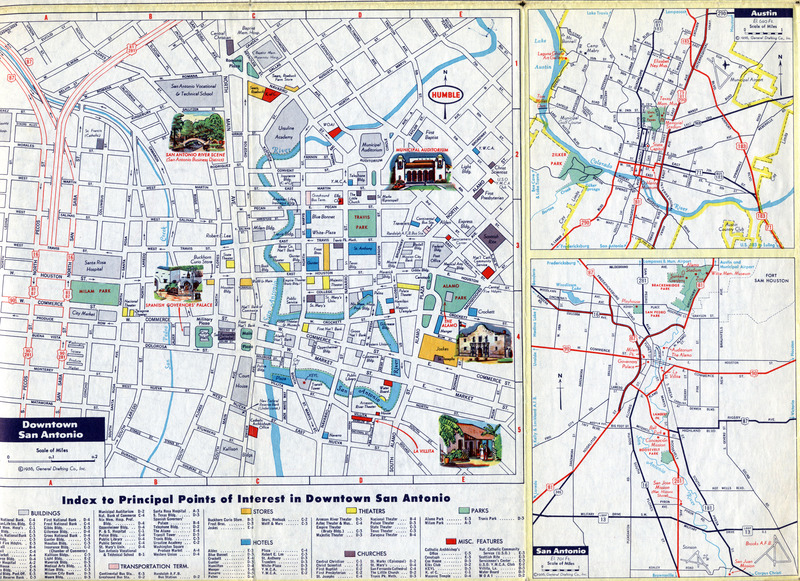 Map scans courtesy of Terry Palmer. 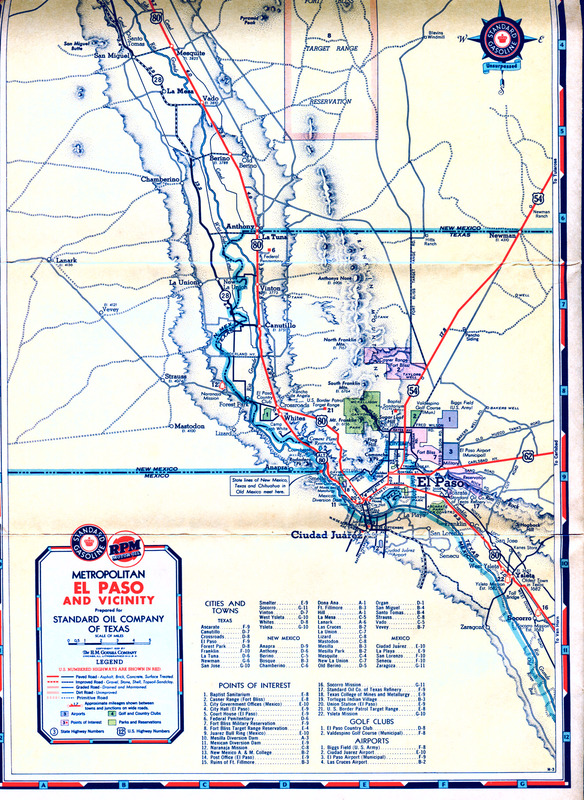 This map includes a directory of the trail and highway markings that were used prior to the adoption of the highway numbering system. 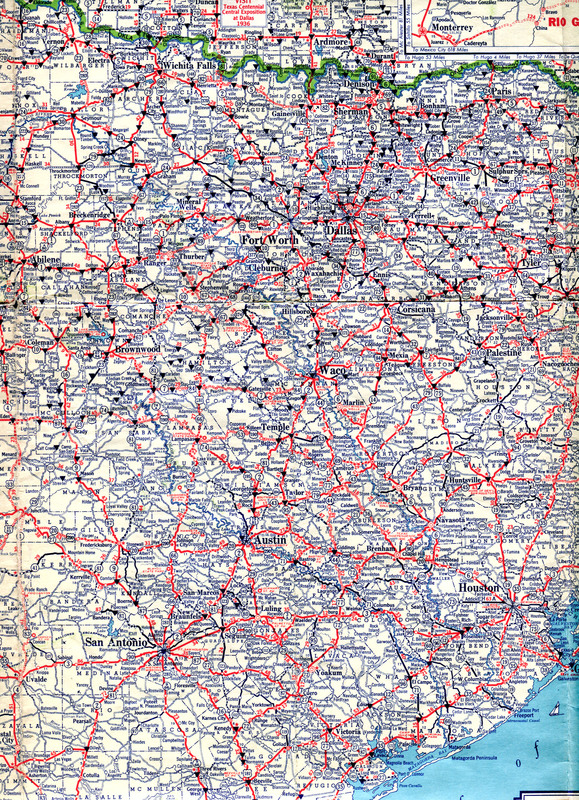 The numbers on the routes in the map correspond the the trail names in the index directory. 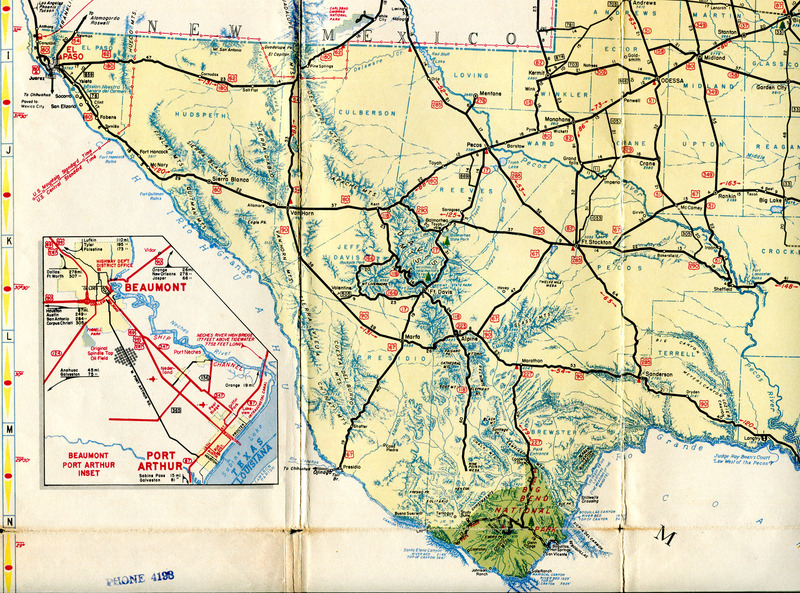 Map scans courtesy of Terry Palmer. 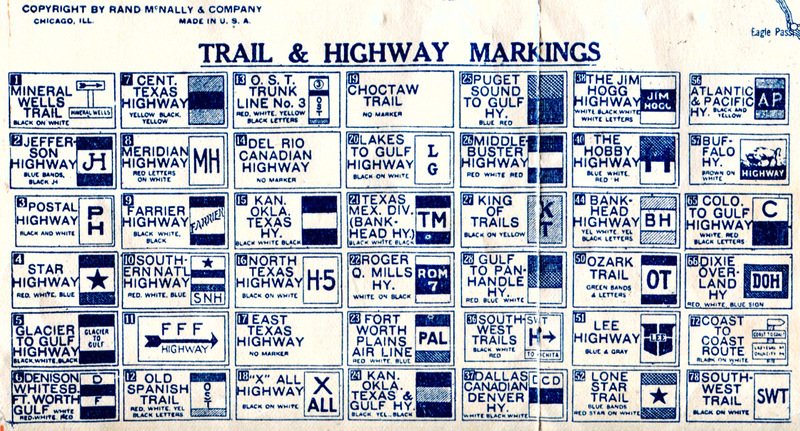 Trail Guide Guide This directory shows the distinctive markers for the automobile trails. 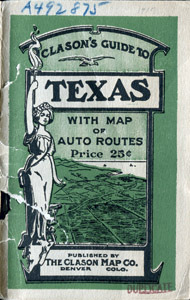 The legend for this map also includes a trail marker directory, similar to the 1924 map. 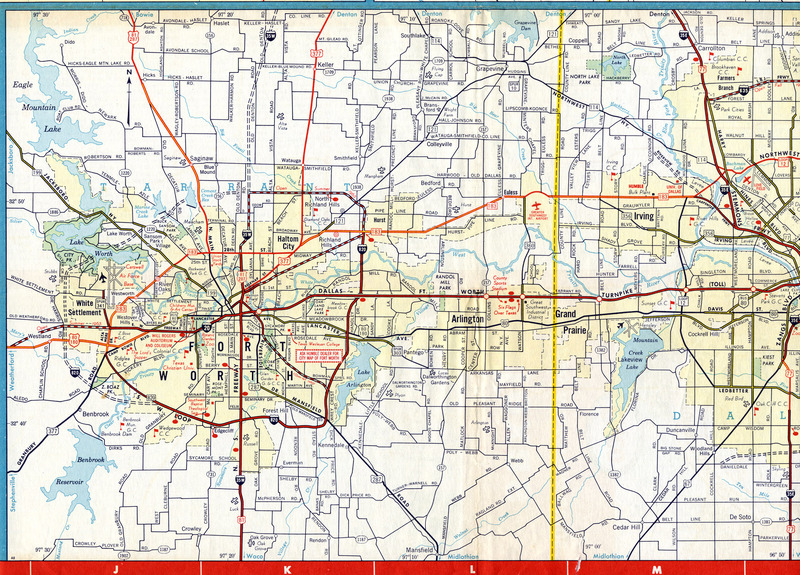 The red numbers on the maps correspond to the trail directory entries. 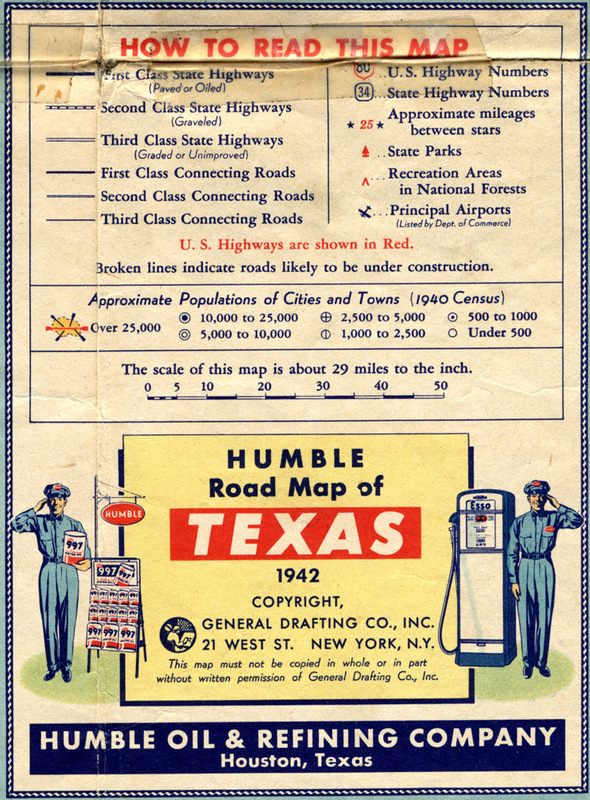 Highways were also designated with the first generation of number designations, so many highways had both a number designation and a trail marker. Humble Oil is now part of ExxonMobil. 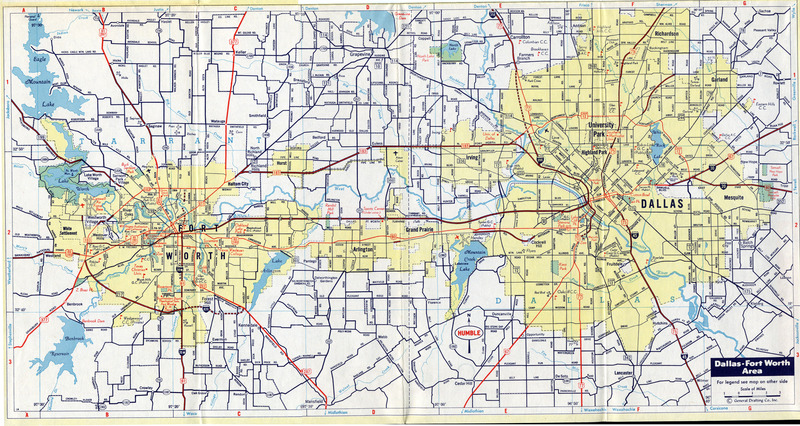 Map scans courtesy of Terry Palmer. 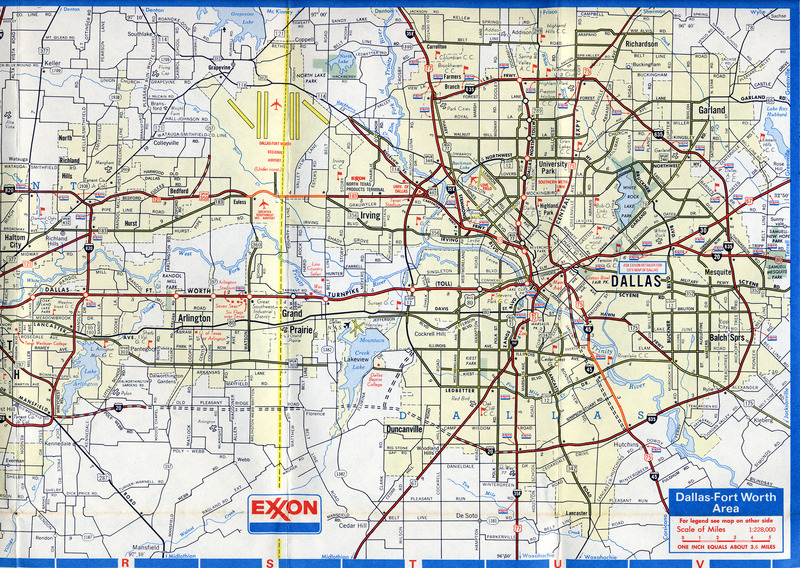 This map has detailed maps of cities. 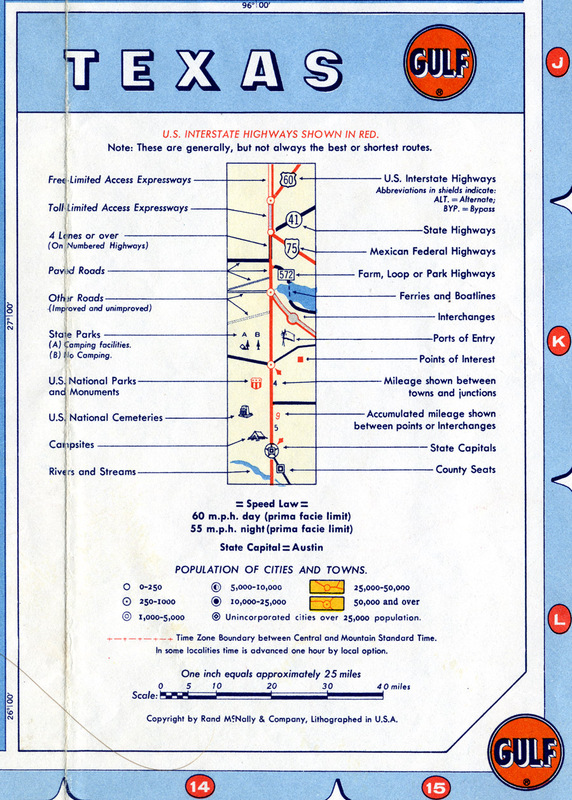 There is no indication of trail markers, so the trail marker system appears to be phased out by this time. 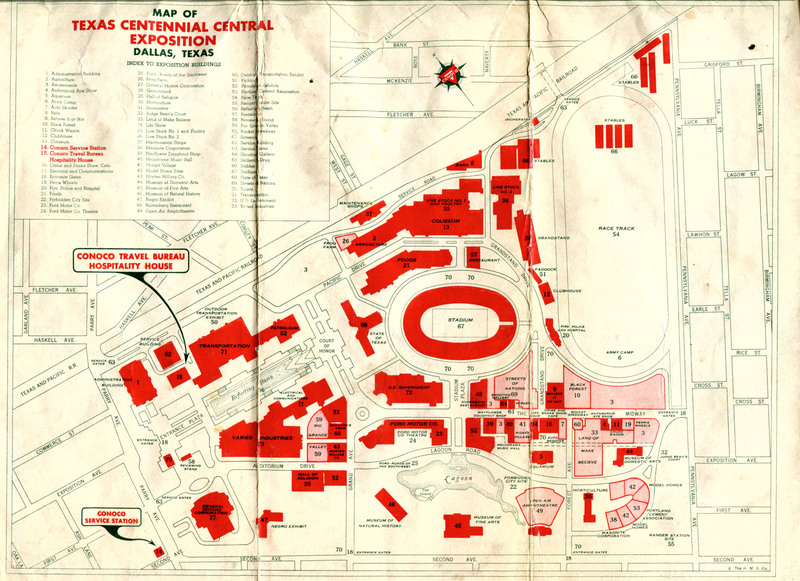 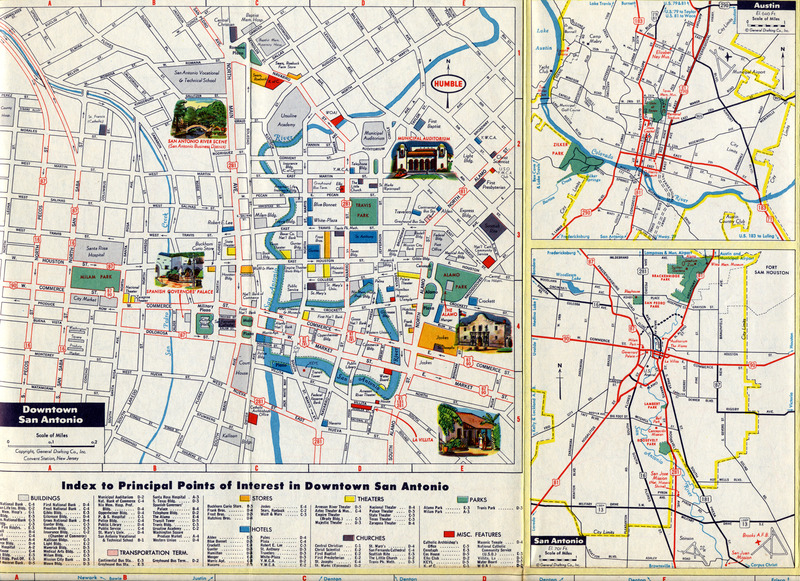 This map also includes a map of the Texas Centennial Exposition at Fair Park in Dallas. Map scans courtesy of Terry Palmer. Fair Park Med Large The 1936 Texas Centennial Exposition was held at Fair Park to commemorate the one-hundredth birthday of Texas. 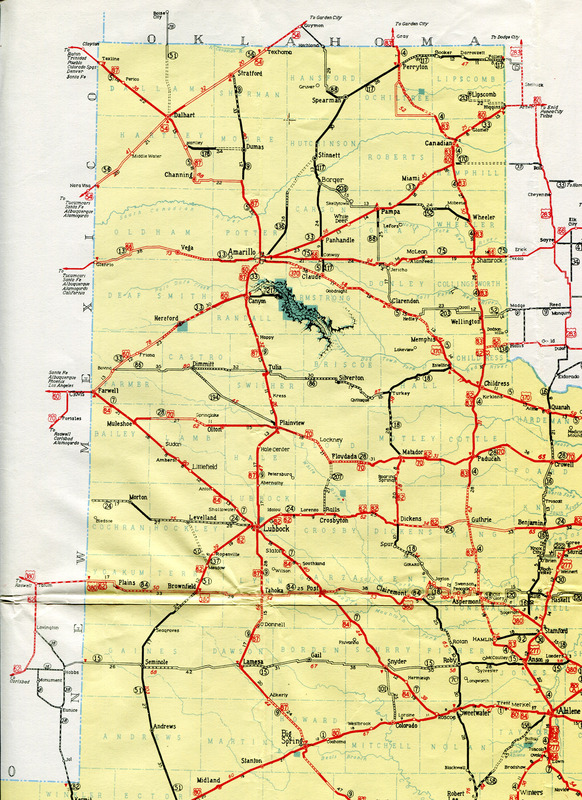 West Texas Med Large Notice the lack of paved roads in West Texas. The Big Bend area was served by dirt roads only. 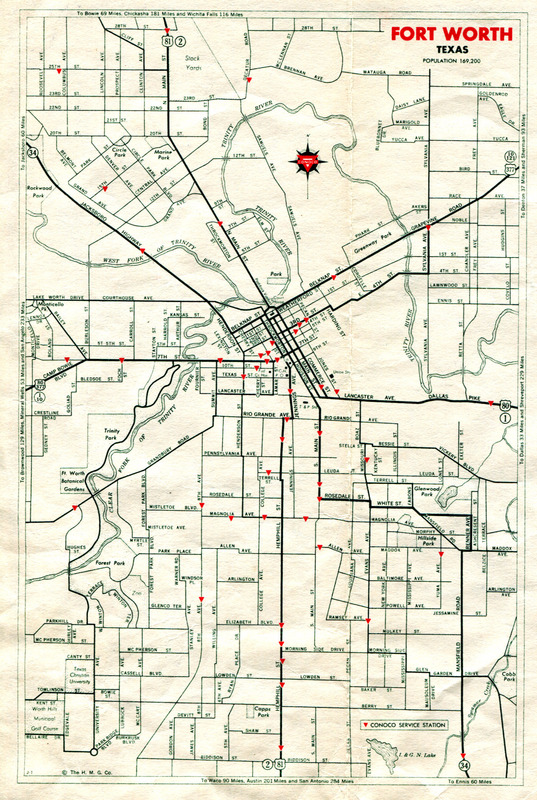 Map scans courtesy of Terry Palmer. 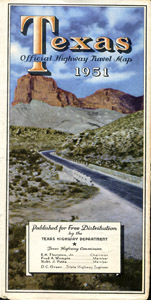 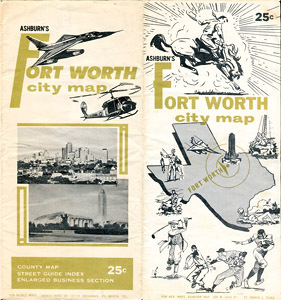 Note that the map cover illustration is a generic city scene, not representing El Paso. 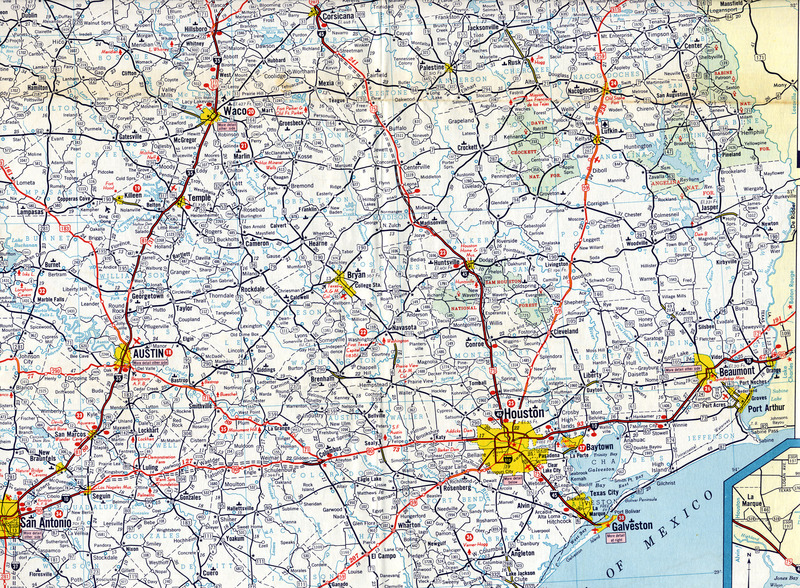 Map scans courtesy of Terry Palmer. 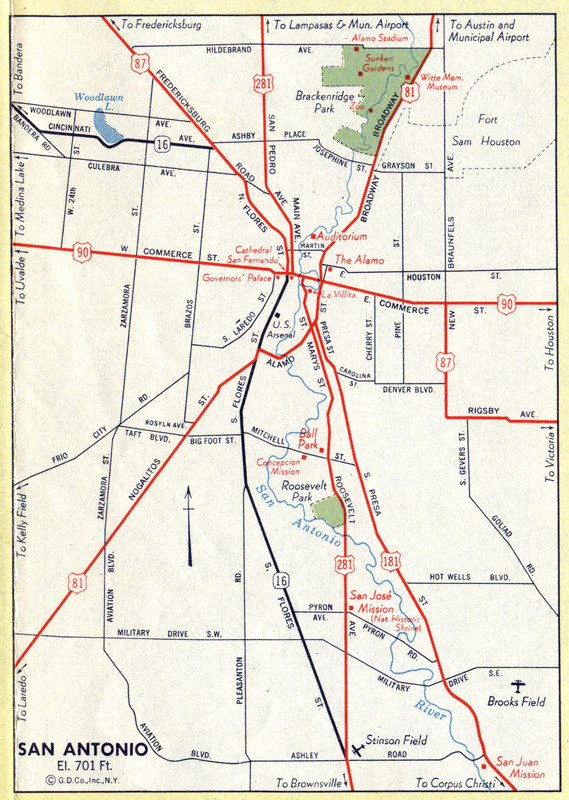 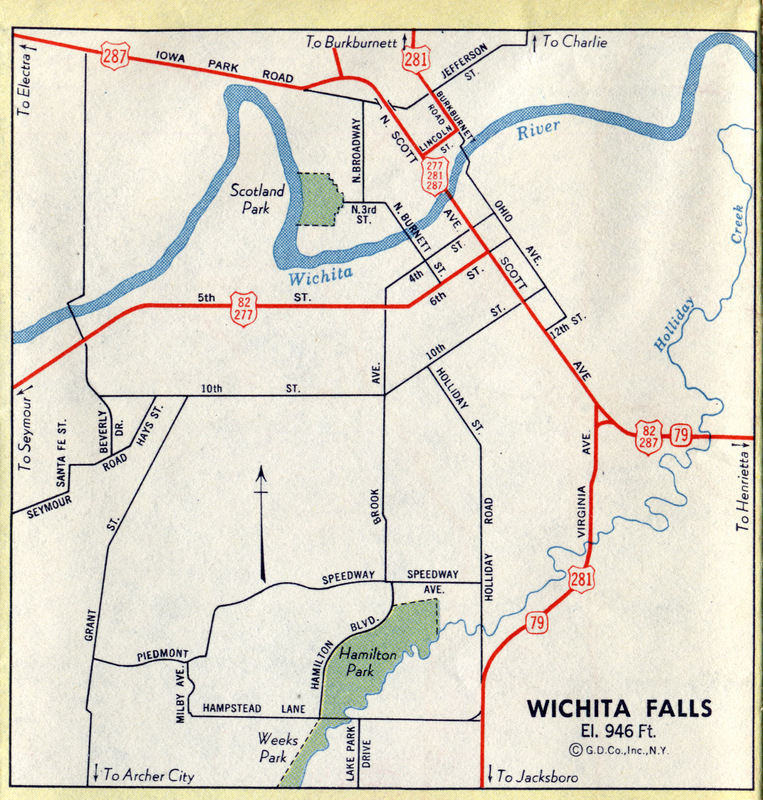 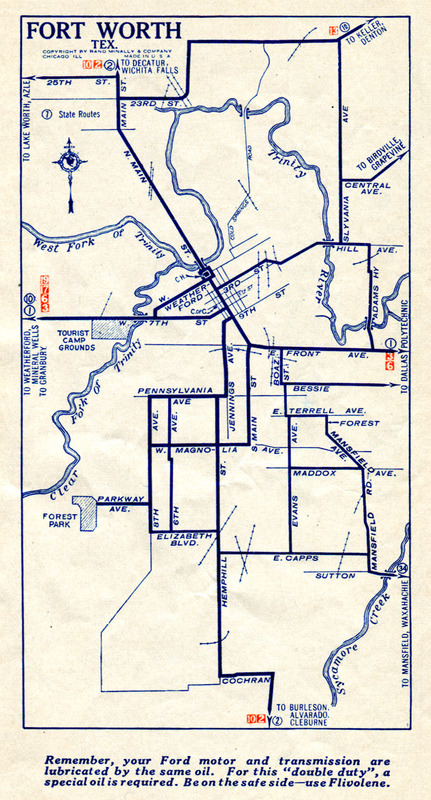 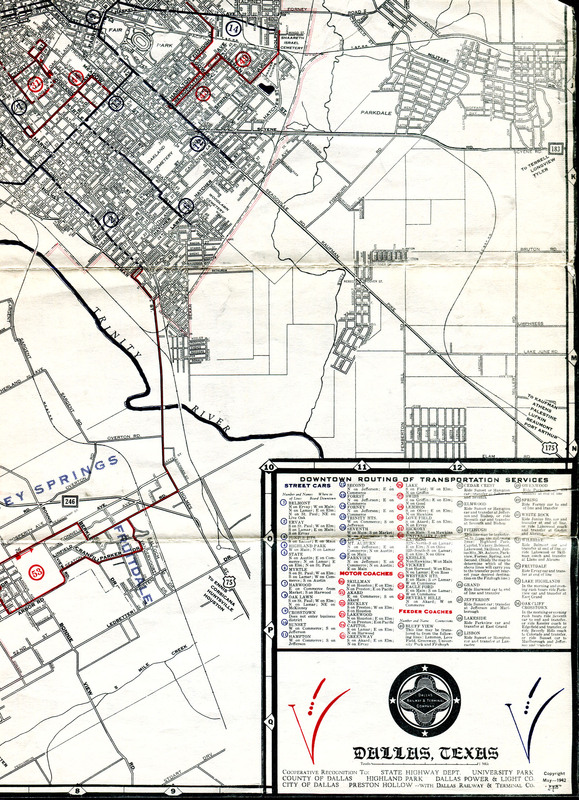 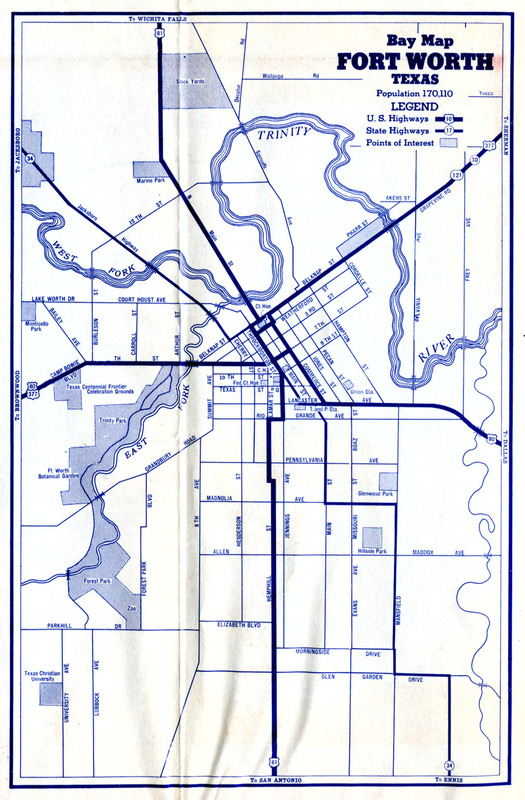 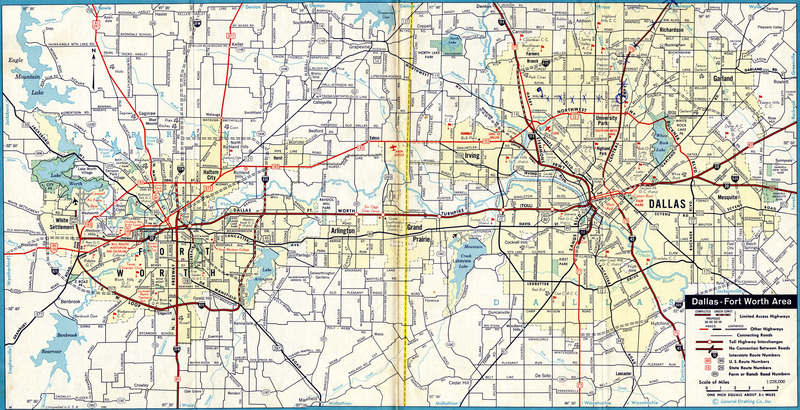 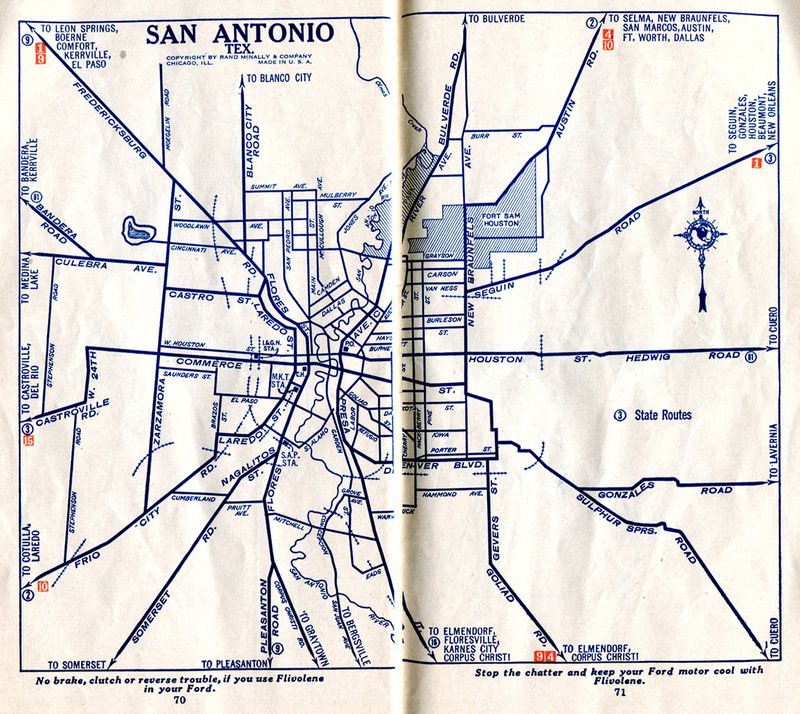 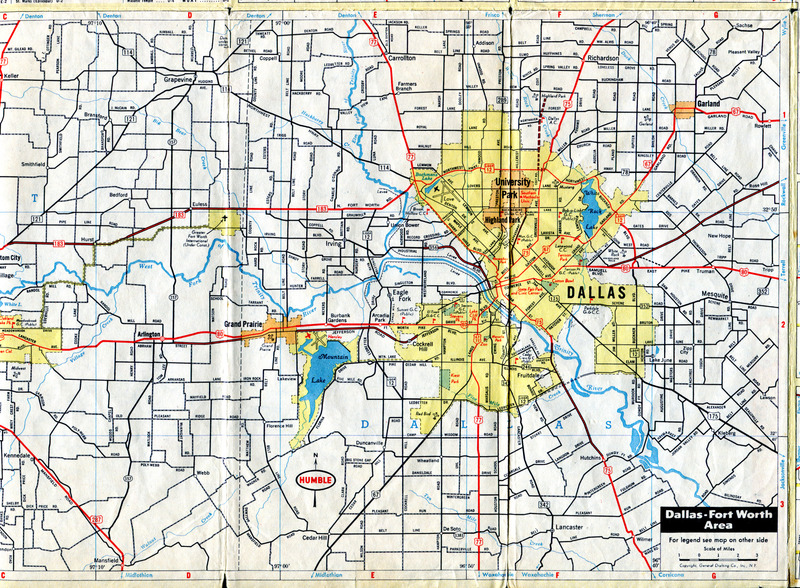 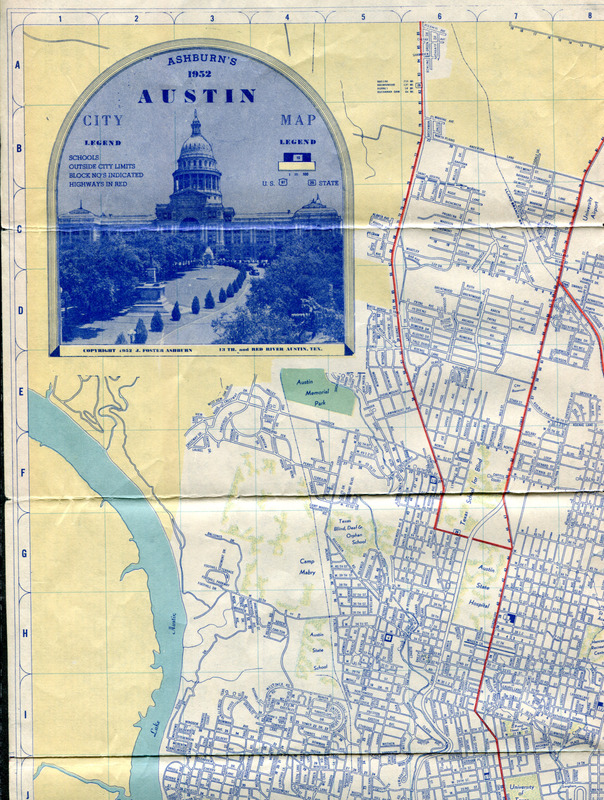 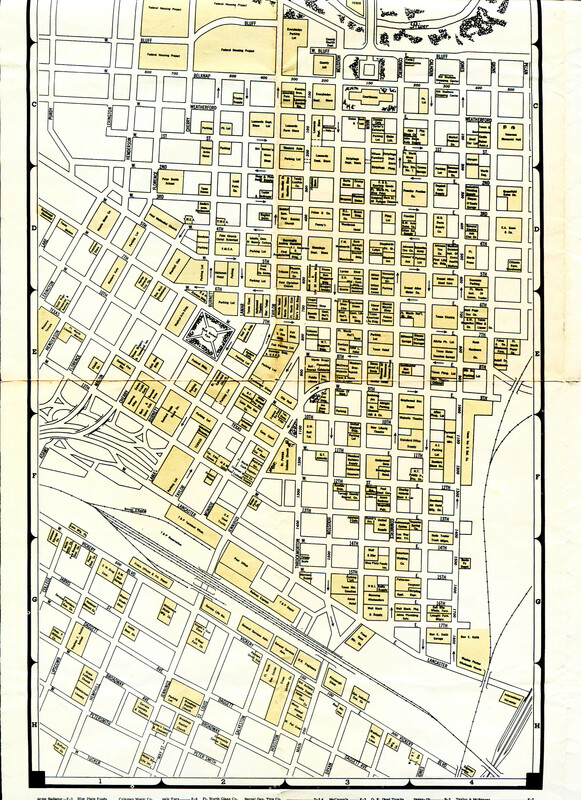 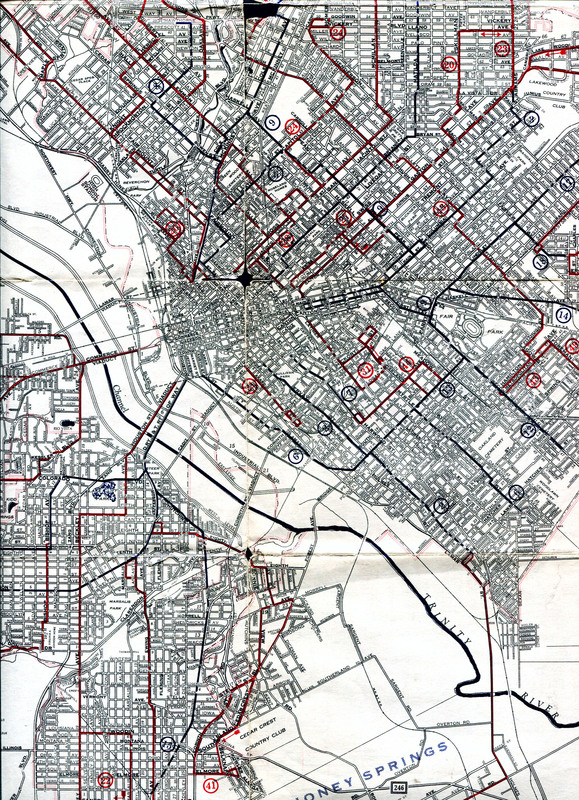 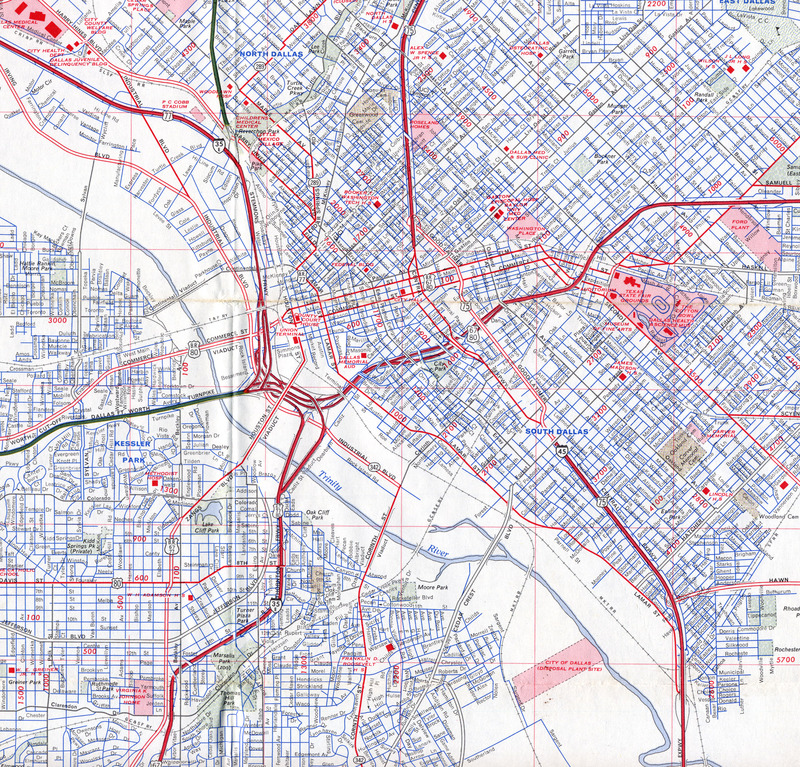 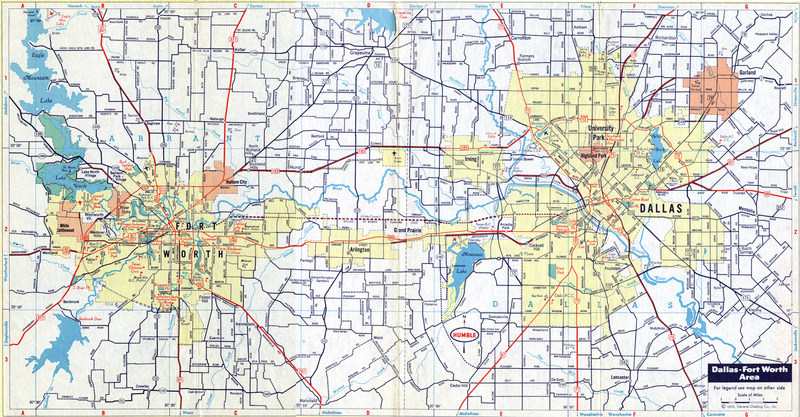 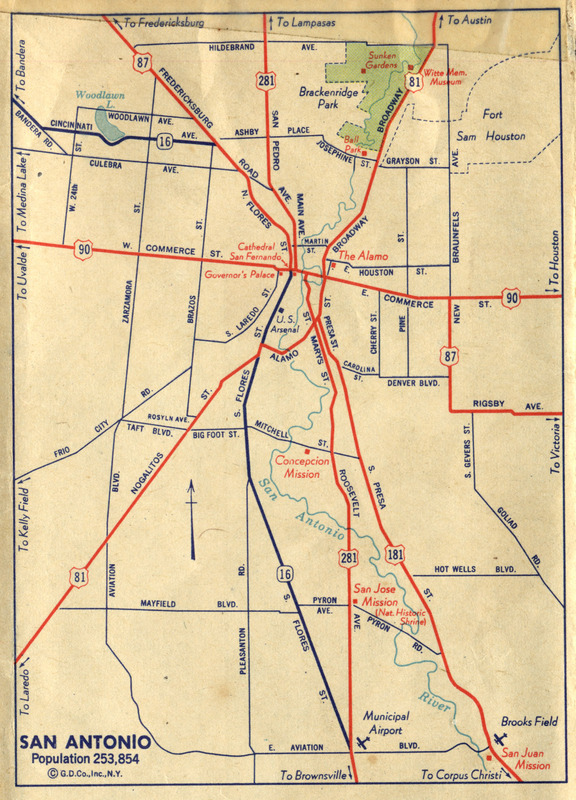 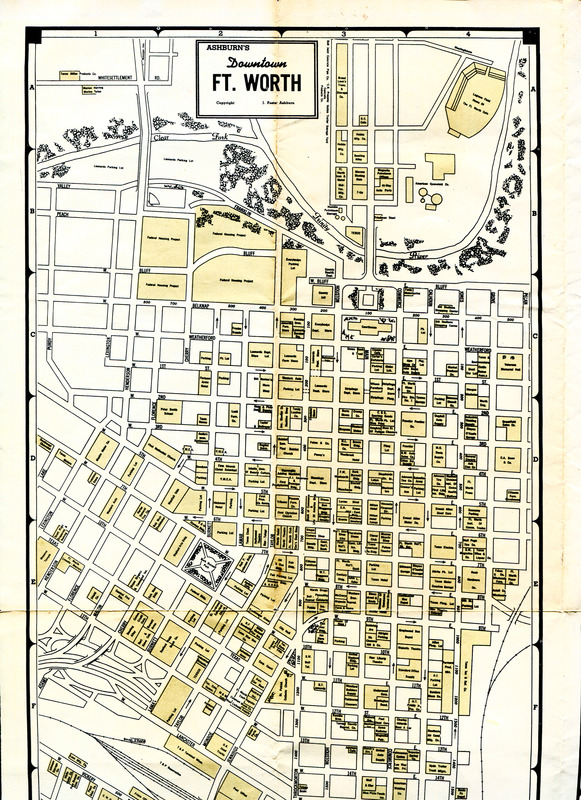 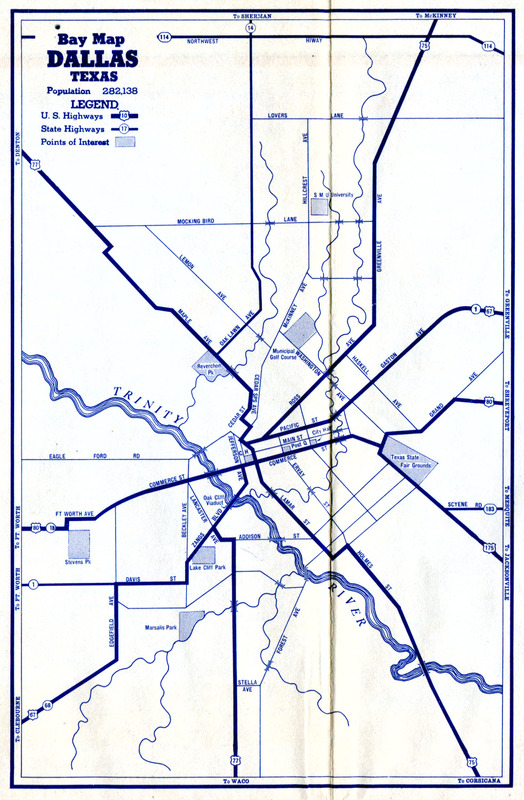 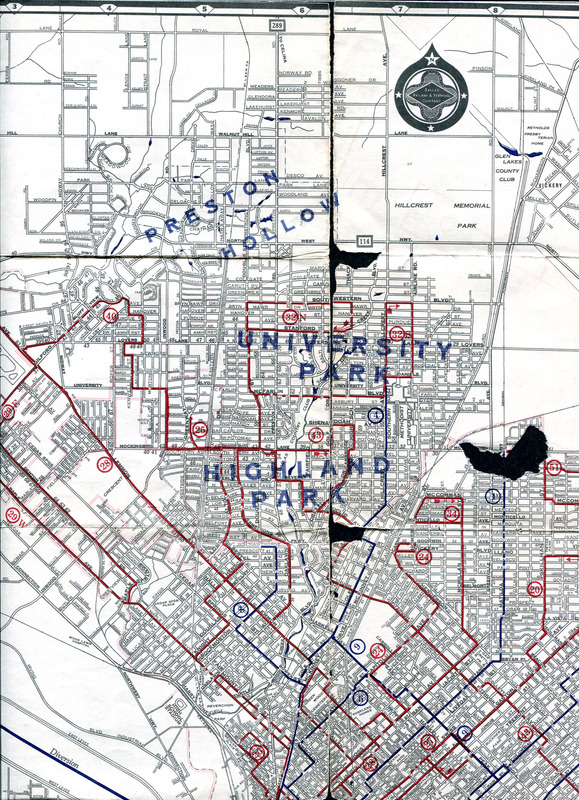 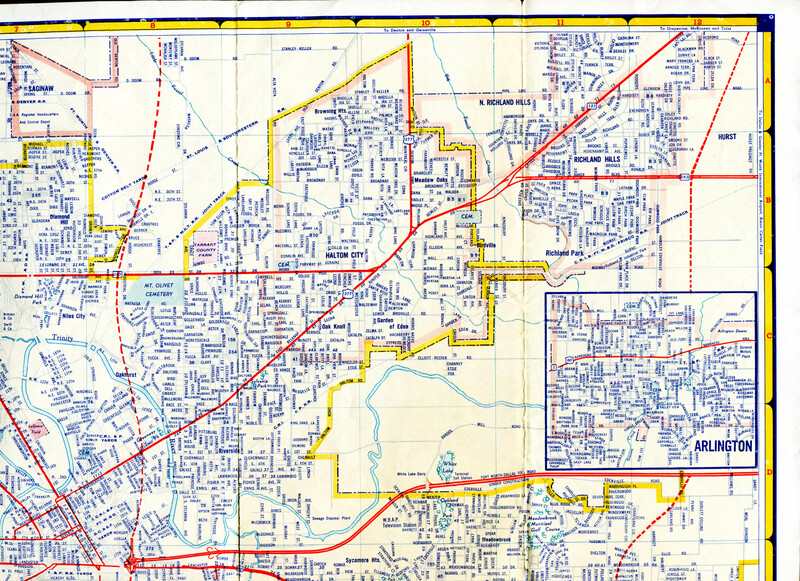 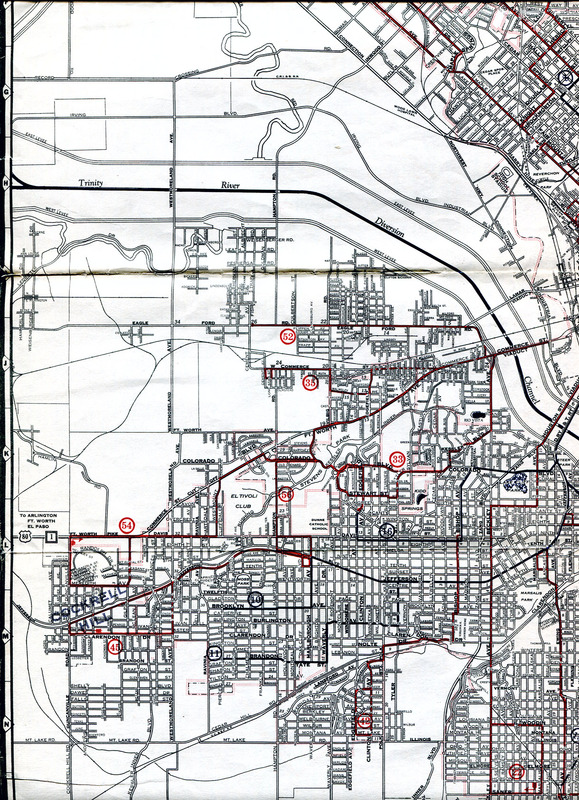 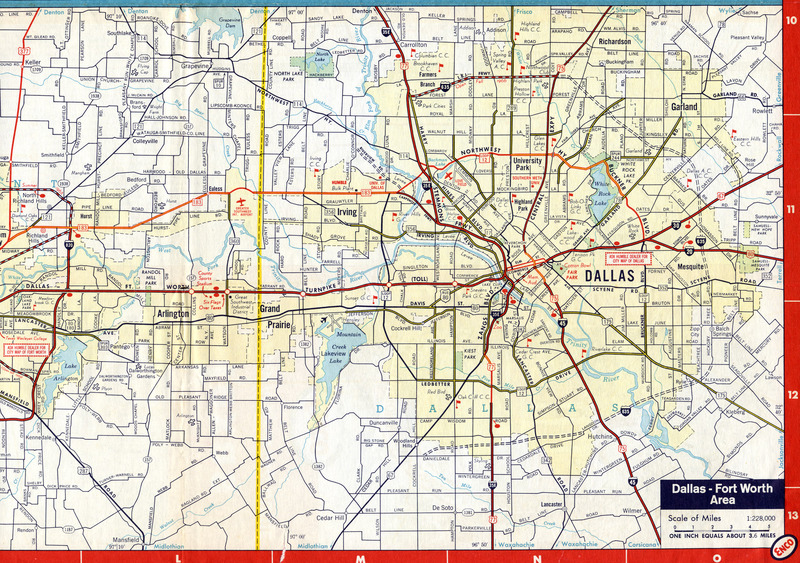 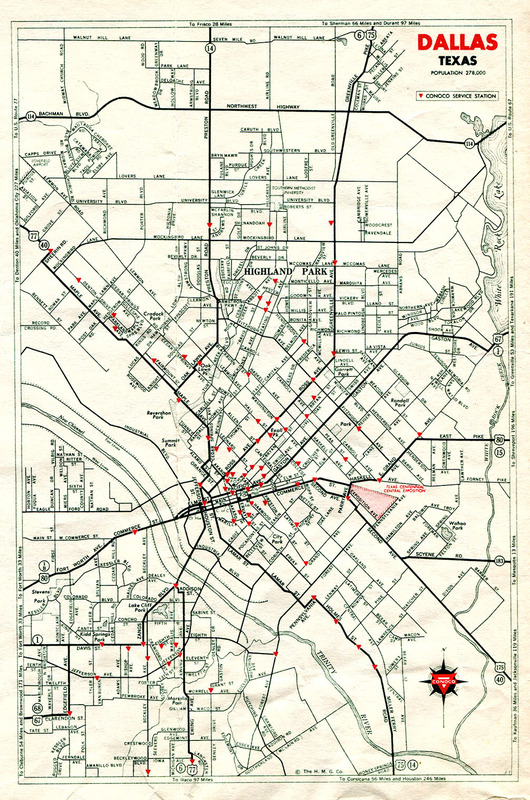 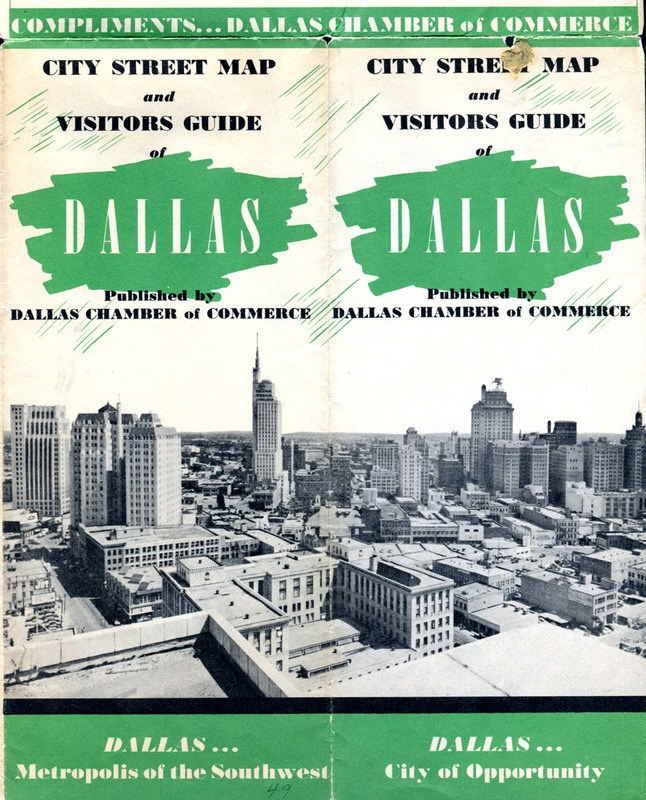 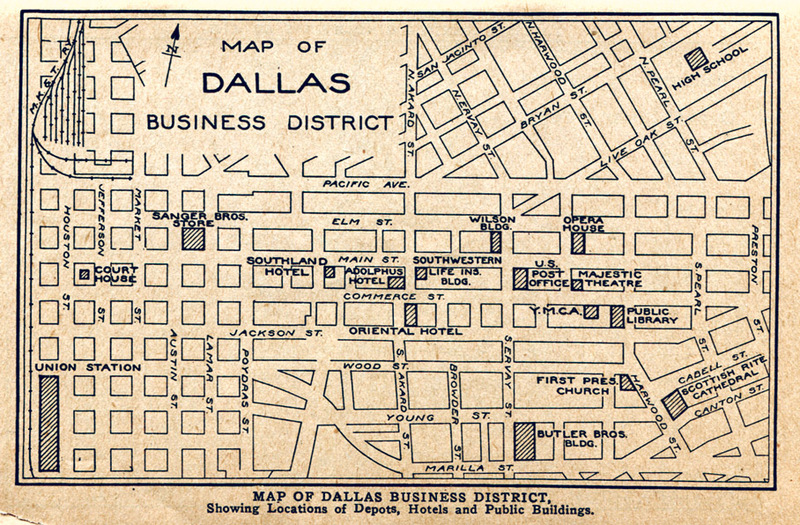 This map was published by the transit company, Dallas Railroad and Terminal, which provided bus and streetcar service. 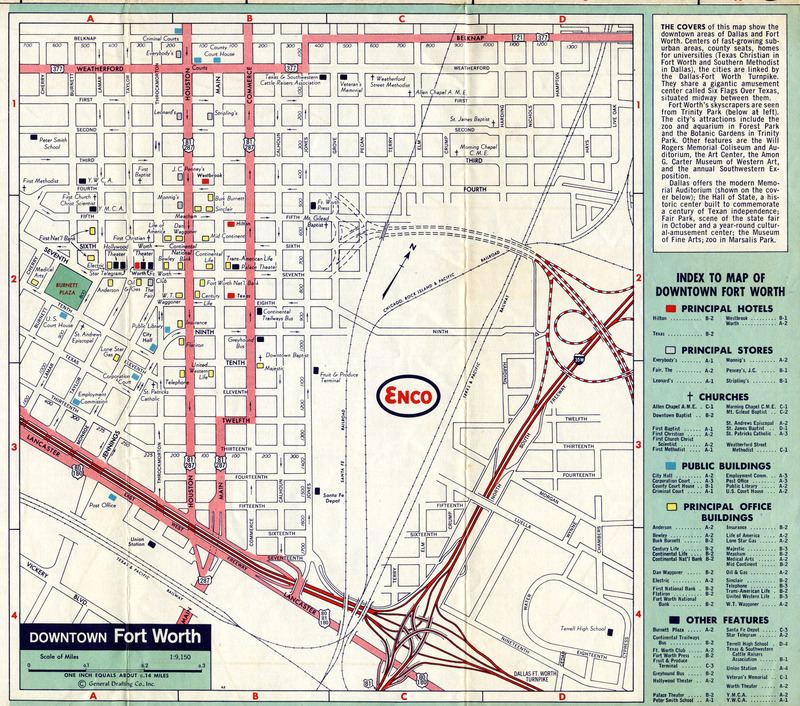 The main purpose of this map is to show the bus and streetcar routes. 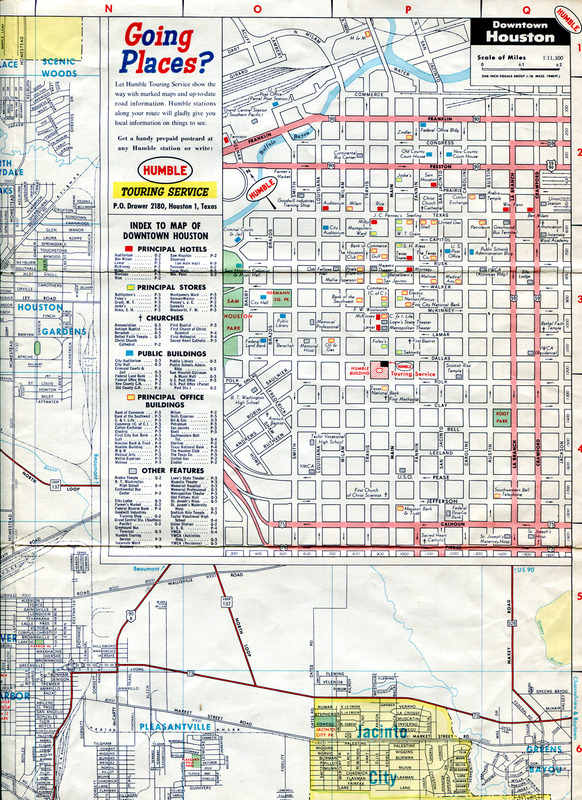 Map scans courtesy of Terry Palmer. 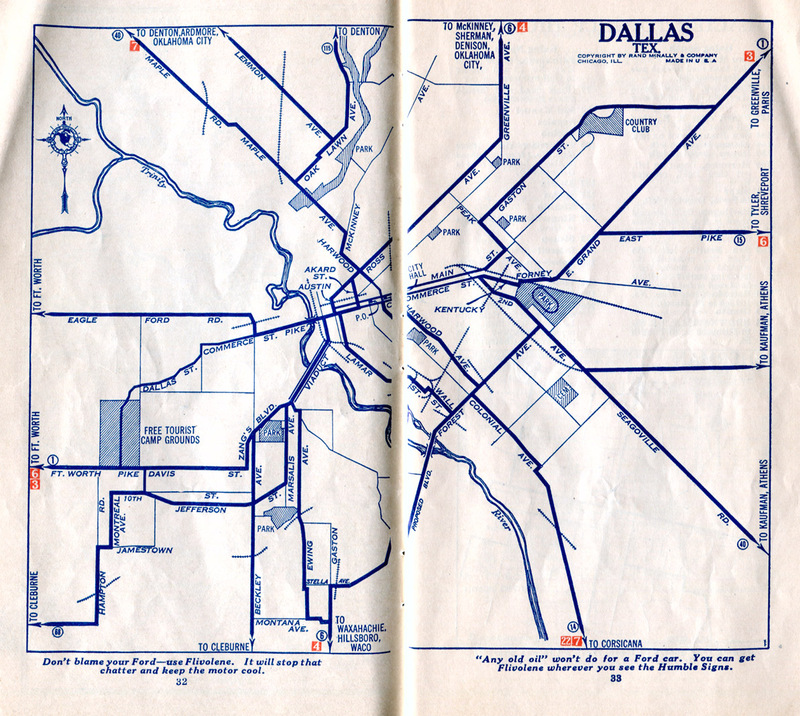 North Dallas Med Large I'm thinking that the bus routes in the Park Cities may have existed to provide transportation for domestic workers. 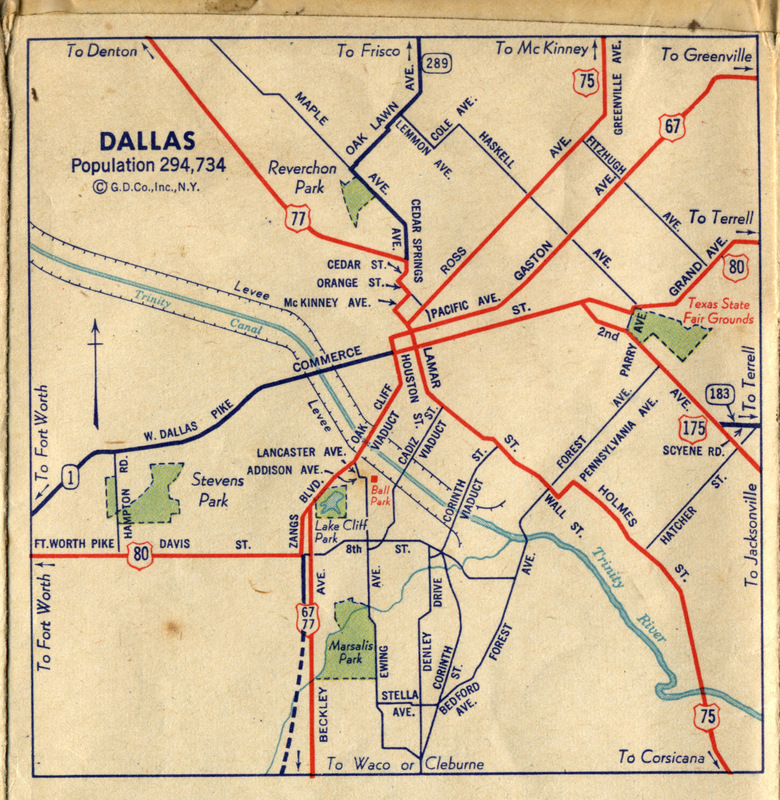 Central Dallas Med This map shows North Central Expressway as a dashed line, indicating it was under construction. 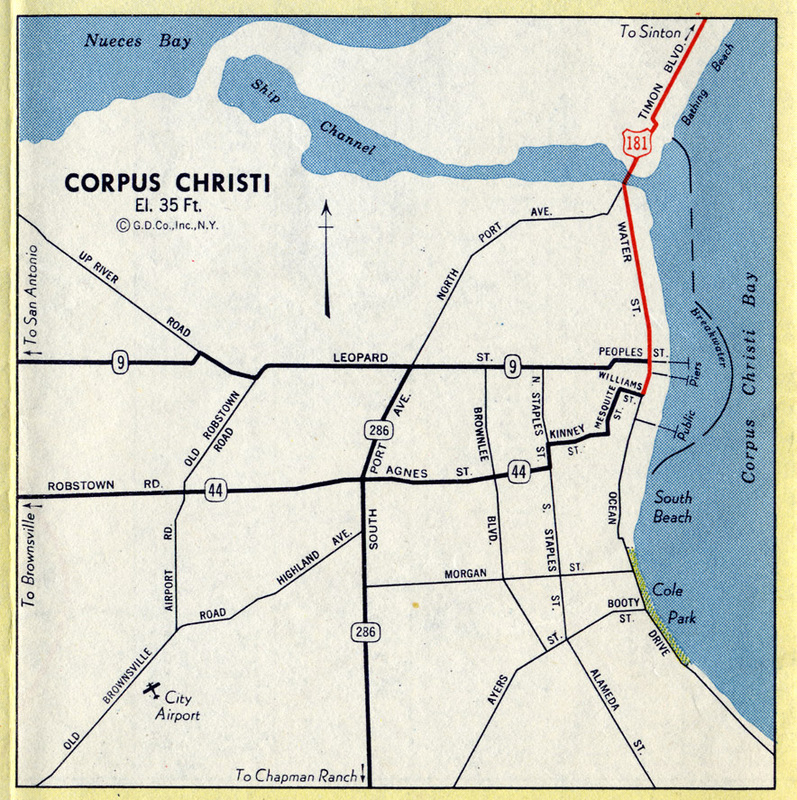 The first section of Central Expressway opened in August 1949. 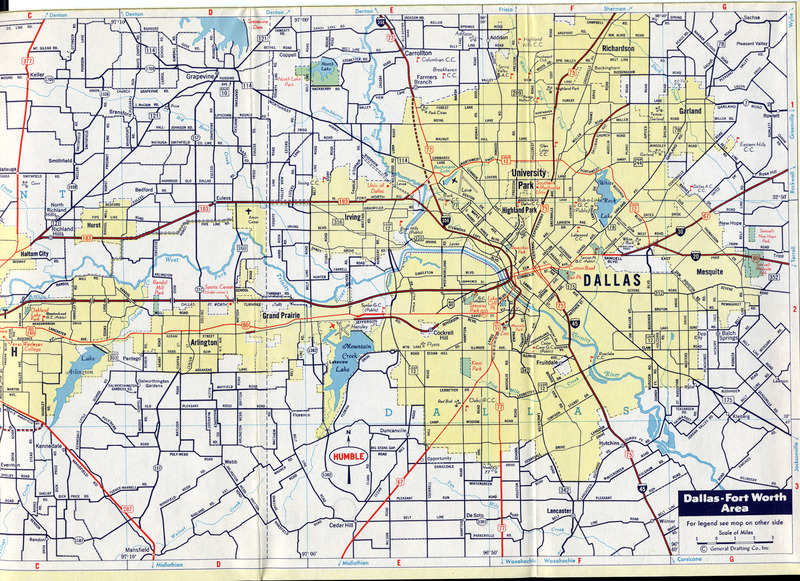 Northeast Dallas Med This map shows Mustang Airport along Northwest Highway between Central Expressway and White Rock Lake. 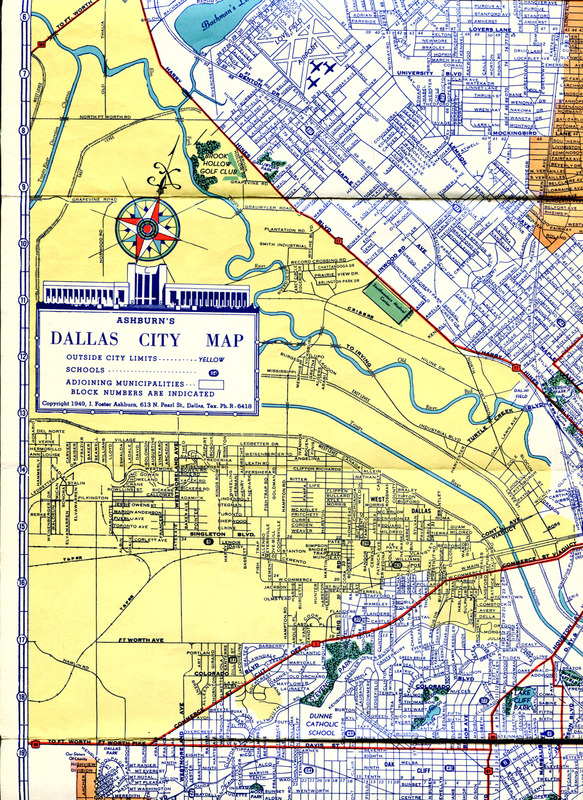 Dallas Med Large The first section of Central Expressway (US 75) north of downtown opened in August 1949, but this map does not include the new freeway. US 75 is still shown on Ross and Greenville Avenues. 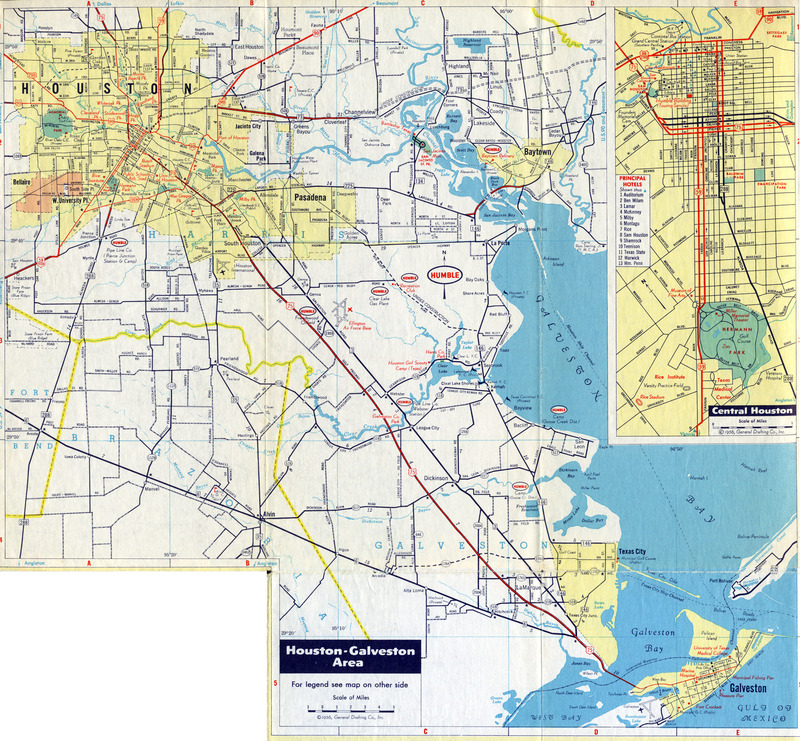 Houston Med Large This map shows the first section of the Gulf Freeway which opened September 30, 1948. 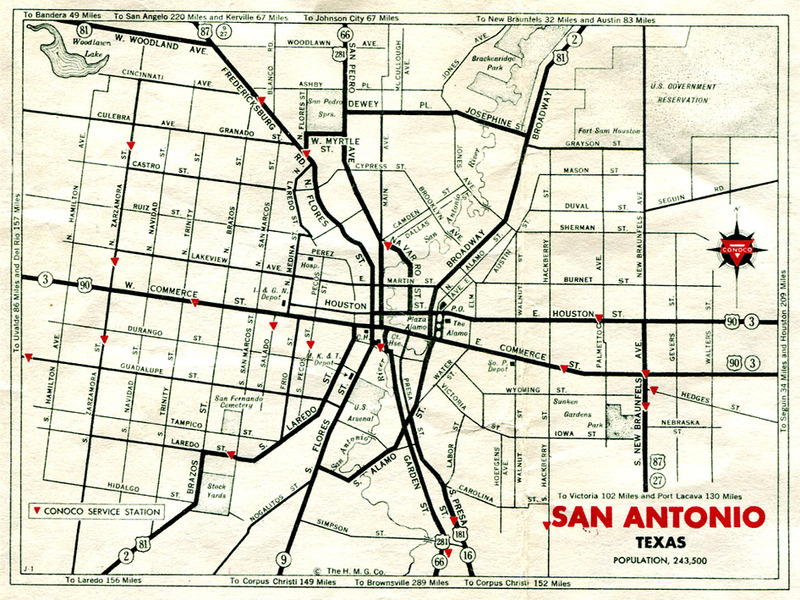 San Antonio Med Large The first section of freeway on US 87 (now I-10) just northwest of downtown opened in 1949 but is not shown on this map. 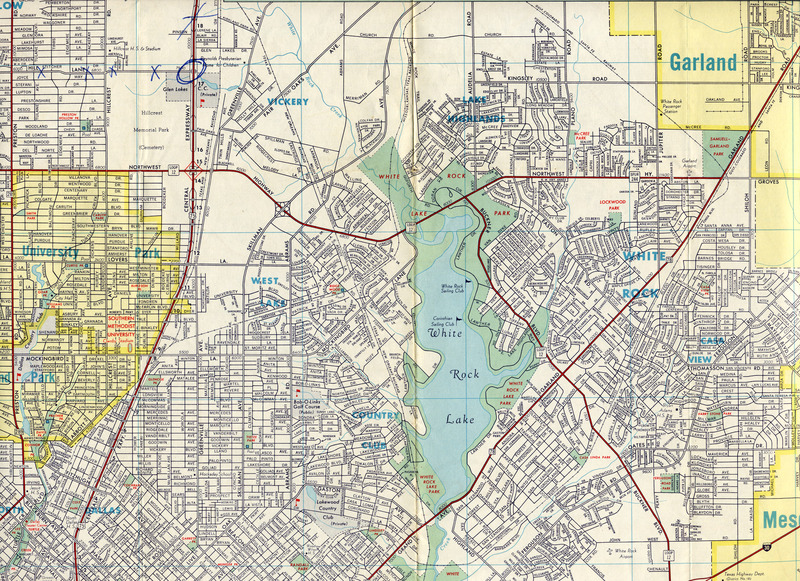 Austin Med Large Notice that Lake Lady Bird (formerly Town Lake) does not appear on this map. 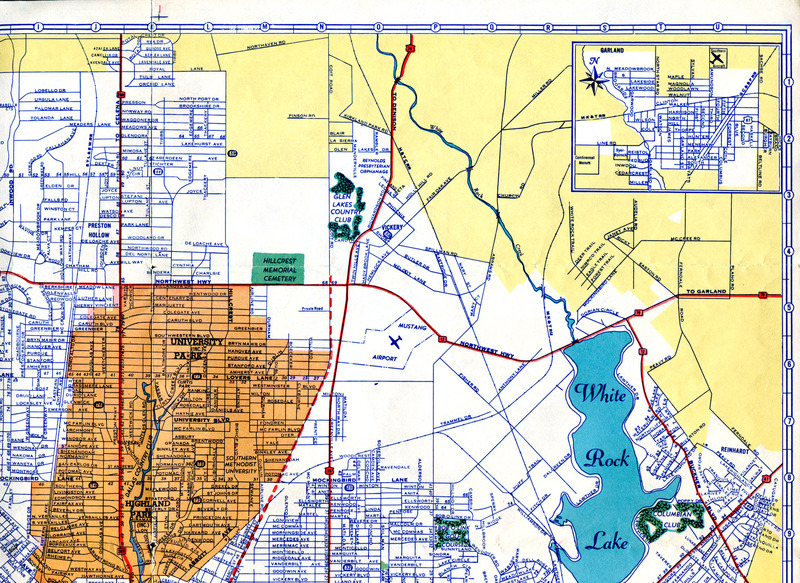 Lake Lady Bird formed after the completion of Longhorn Dam in 1960. 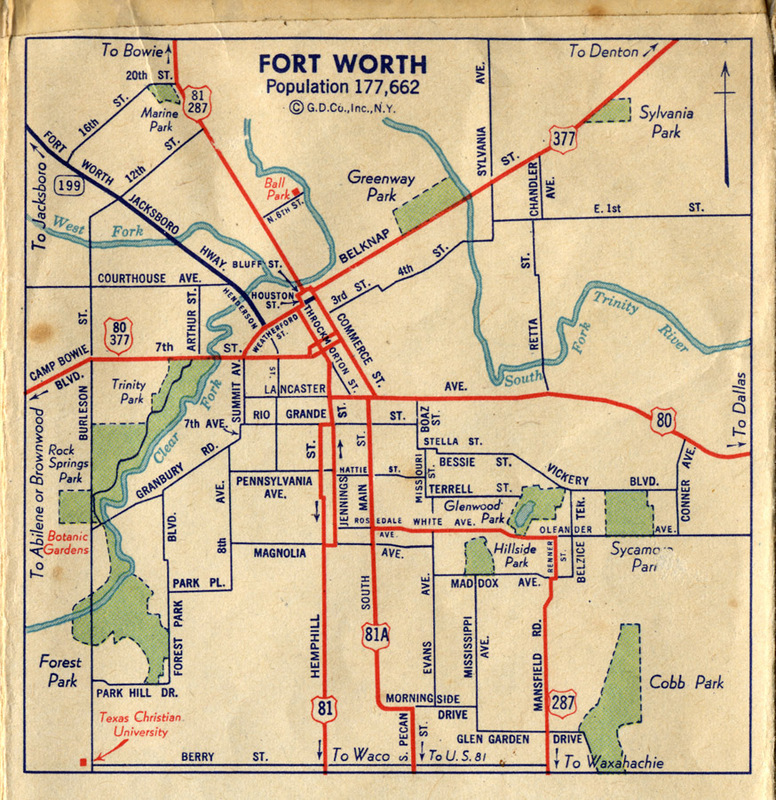 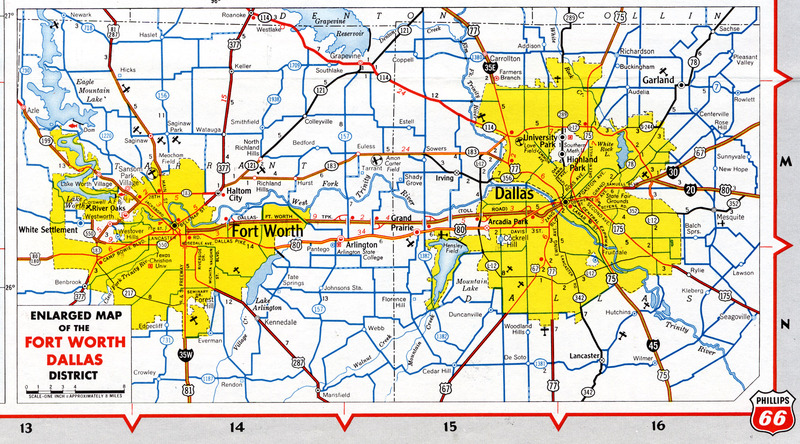 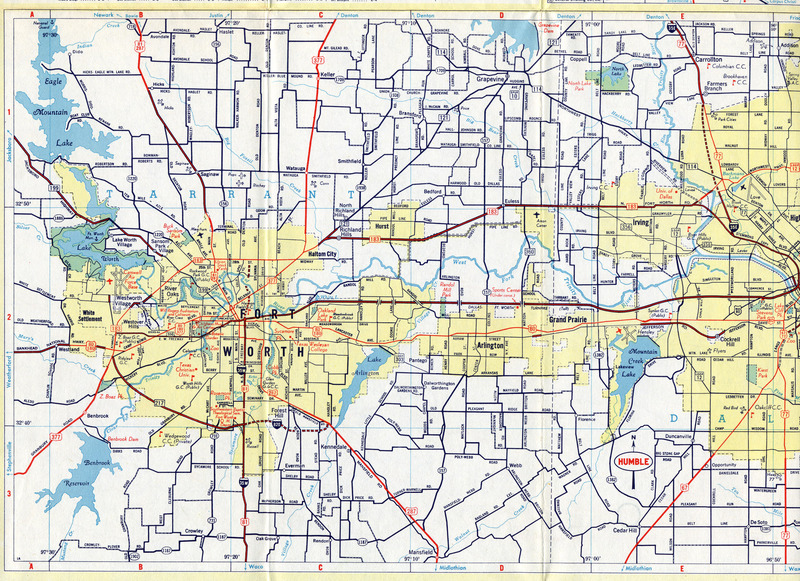 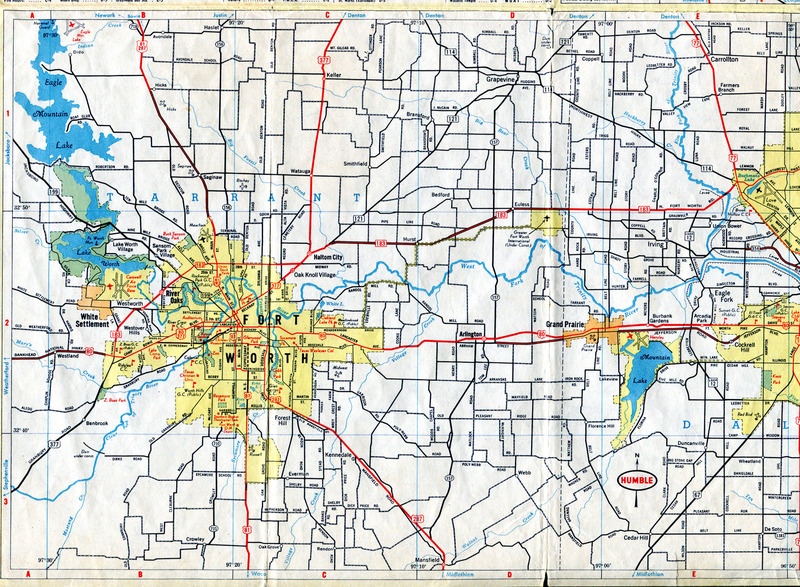 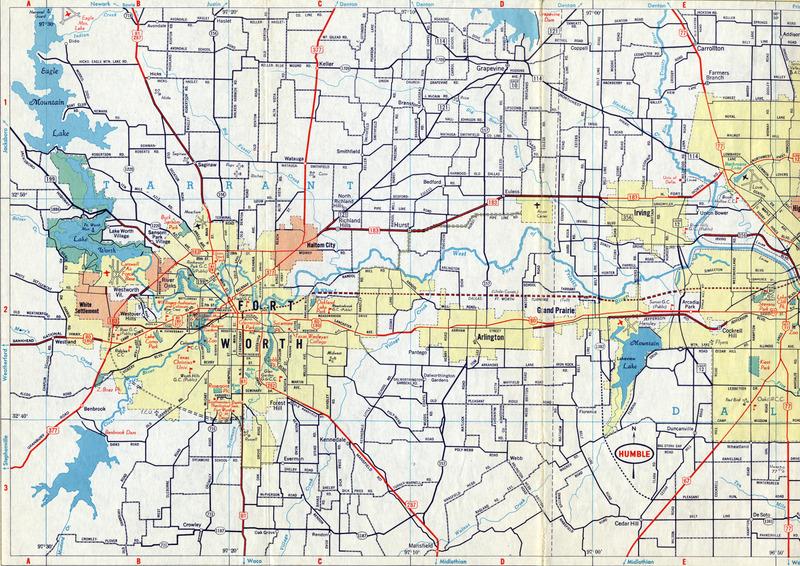 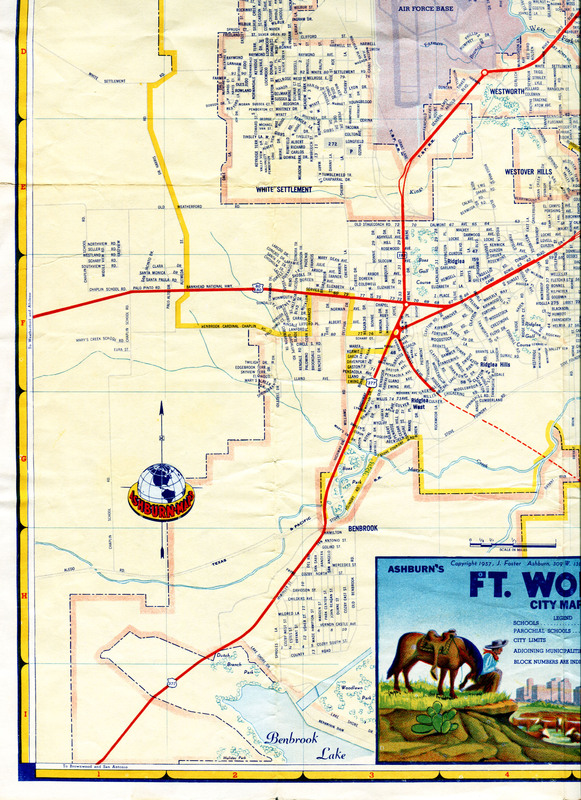 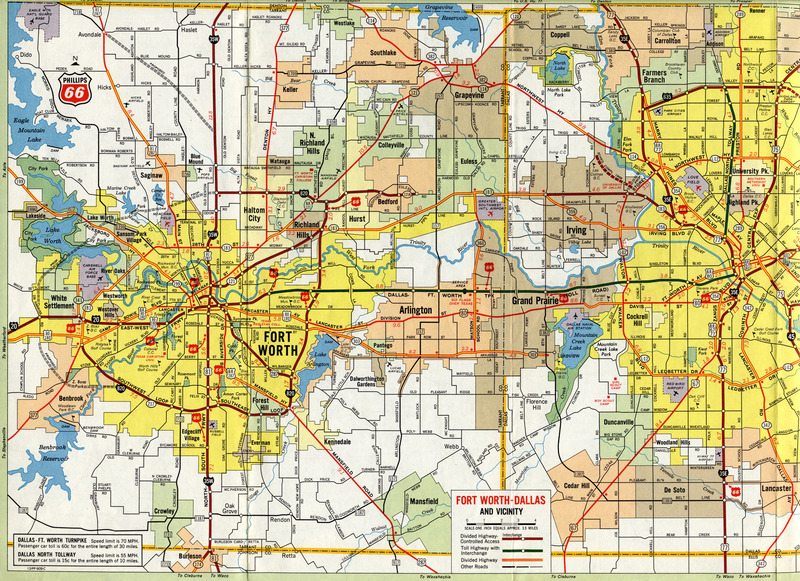 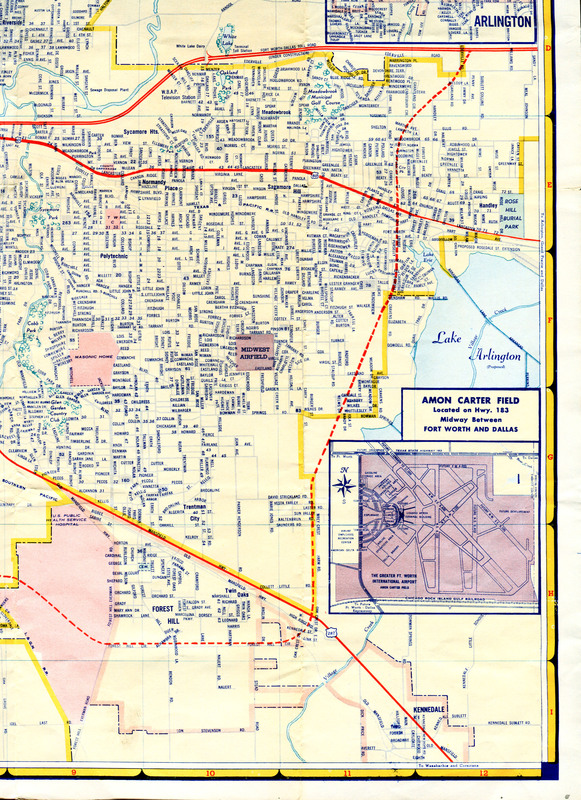 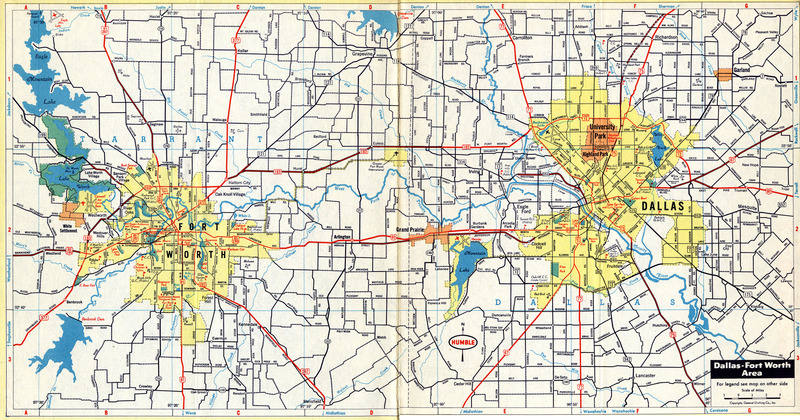 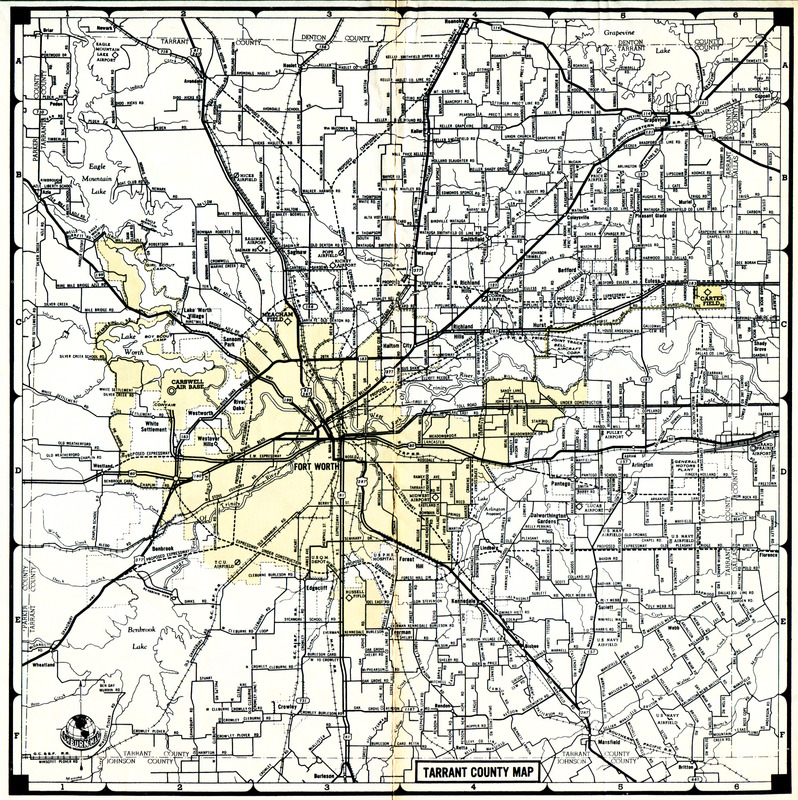 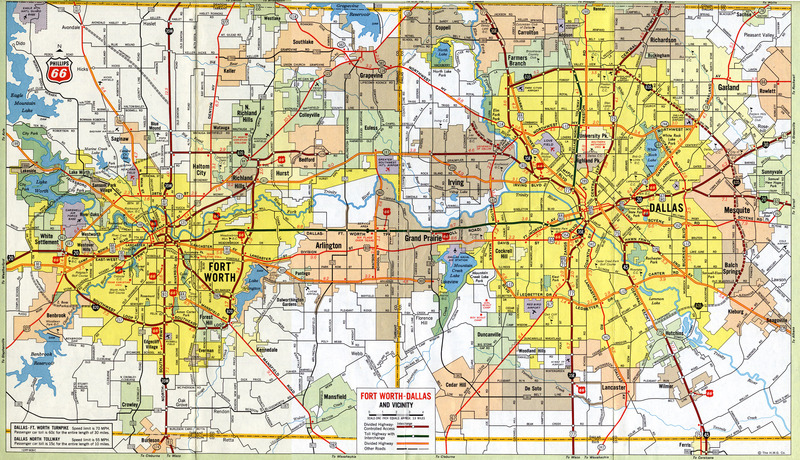 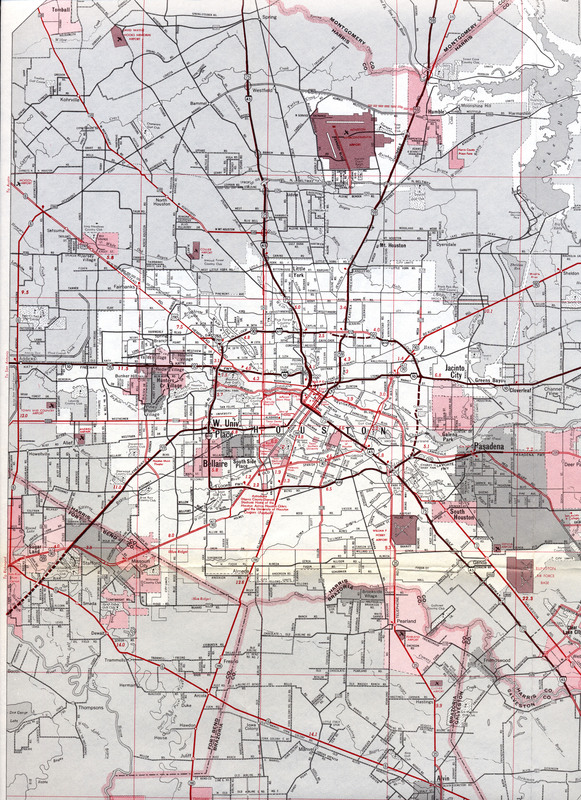 Compared to the 1950 Humble Oil map, this 1951 Humble map has a detailed view of the Dallas-Fort Worth region. 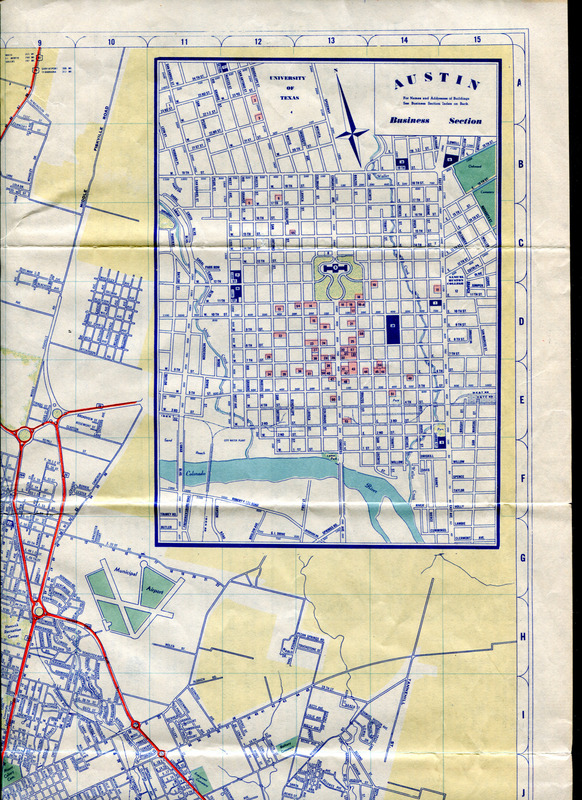 Map scans courtesy of Terry Palmer. 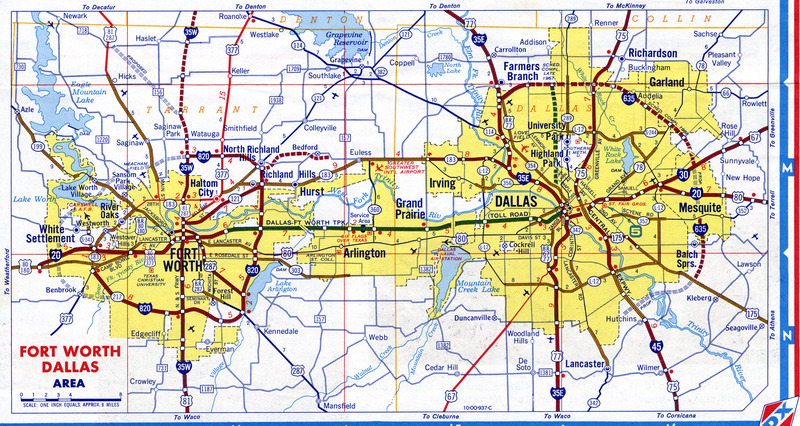 Dallas Med This map shows Central Expressway under construction north of Loop 12. 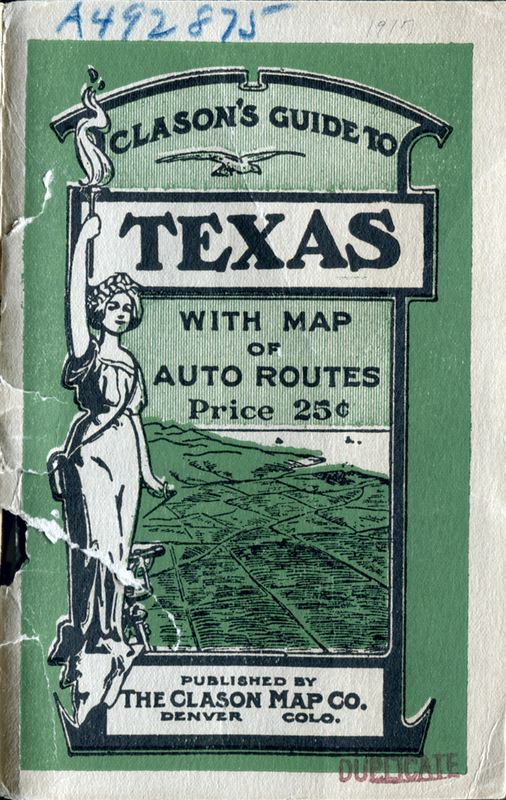 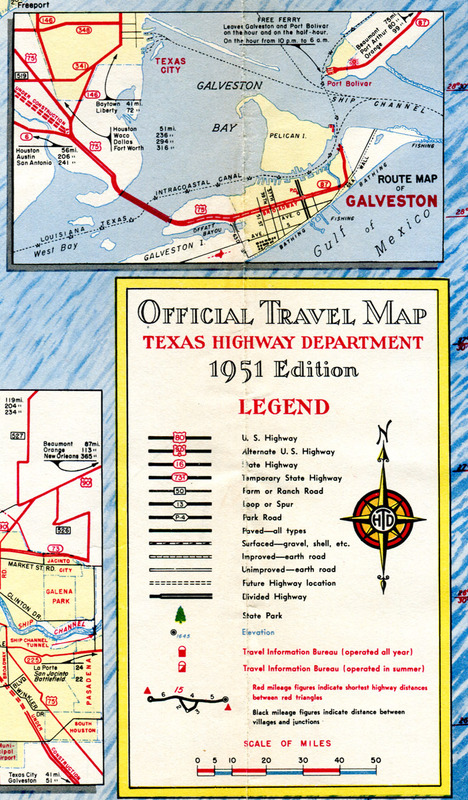 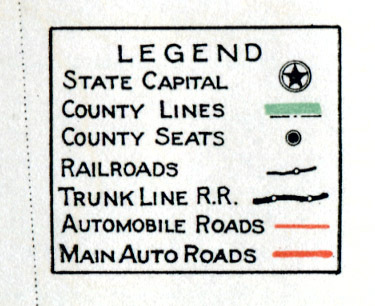 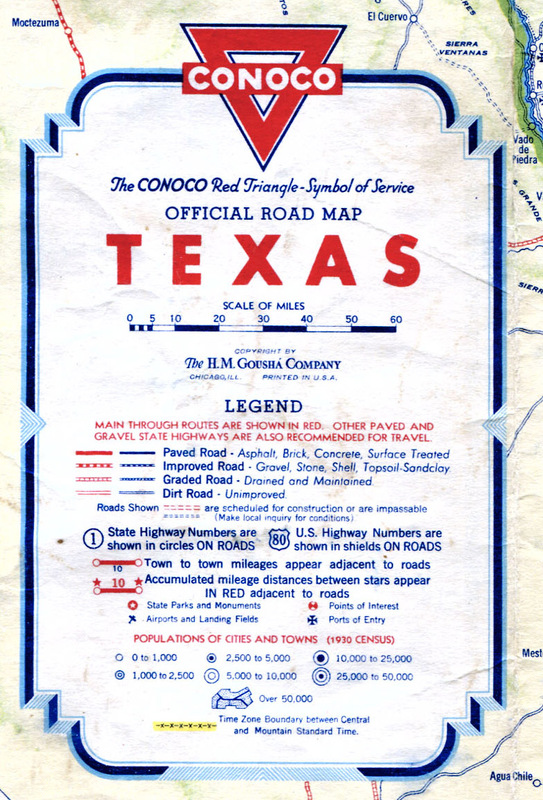 This map includes a guide to Texas road signs, showing the style used at that time. 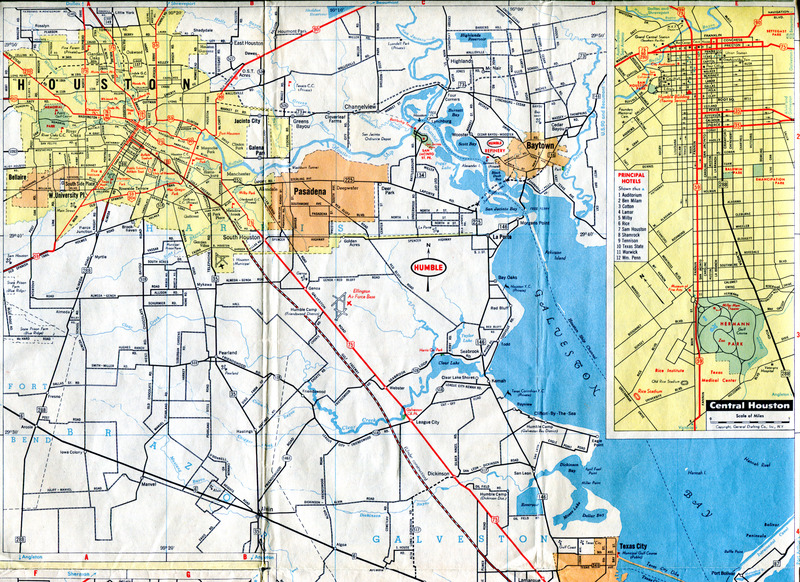 Map scans courtesy of Terry Palmer. 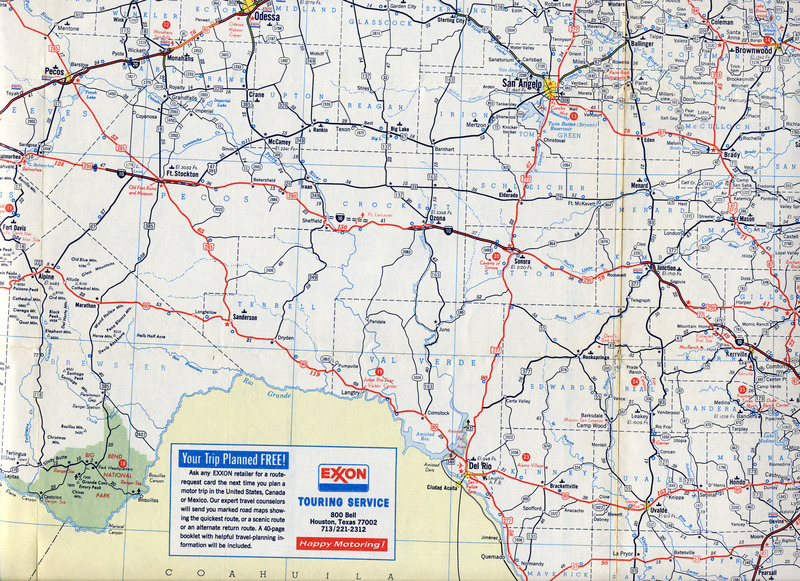 West Texas High This map shows that by 1951, most of main route into Big Bend National park (then SH 227, now US 385) was paved. 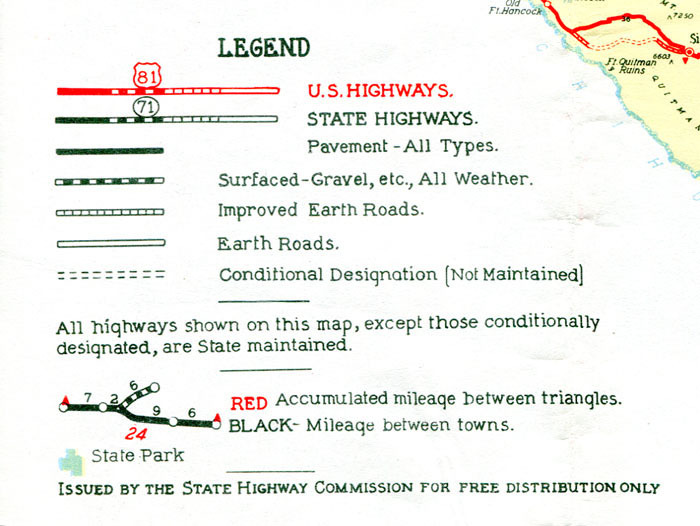 However, the map still shows an unpaved section inside the park. 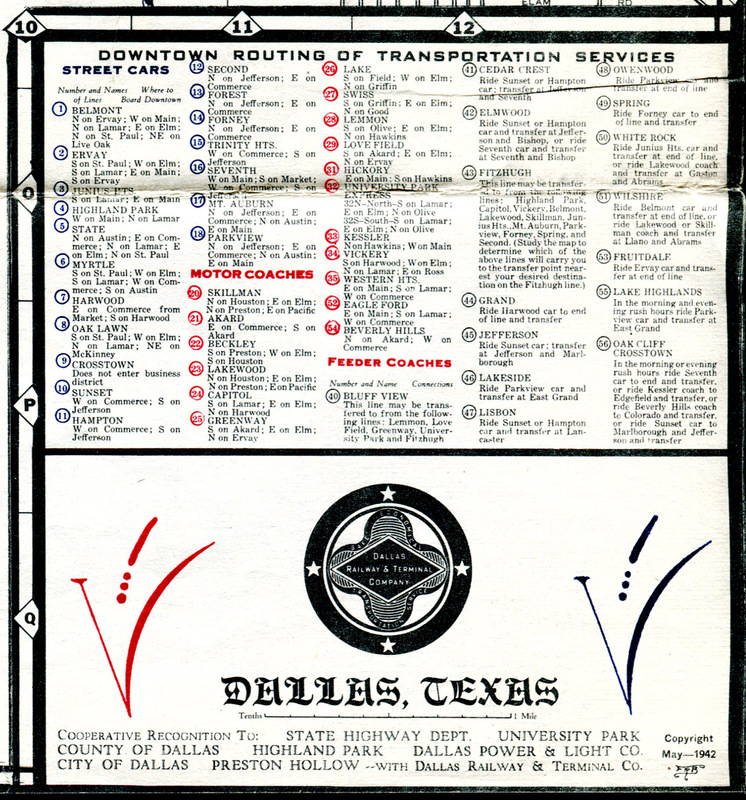 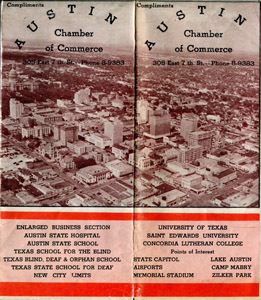 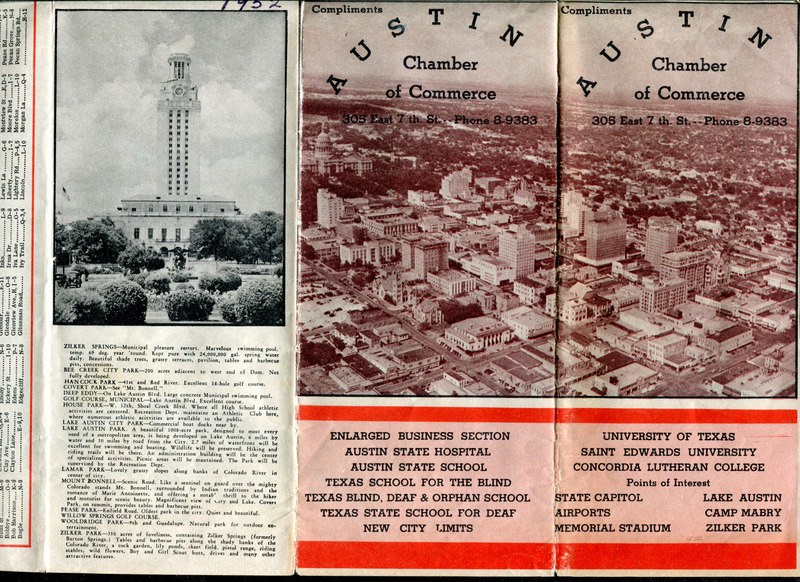 The first item on the listing of points of interest on the cover (click on cover for larger view) refers to "Zilker Springs". 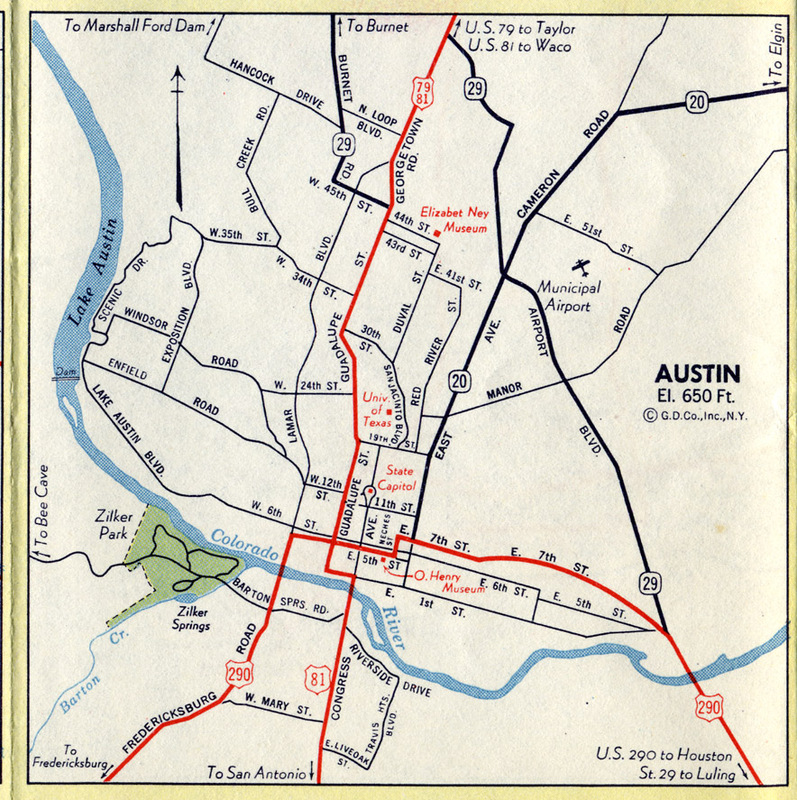 The description for Zilker Park also refers to Zilker Springs with the accompanying text "formerly Barton Springs". 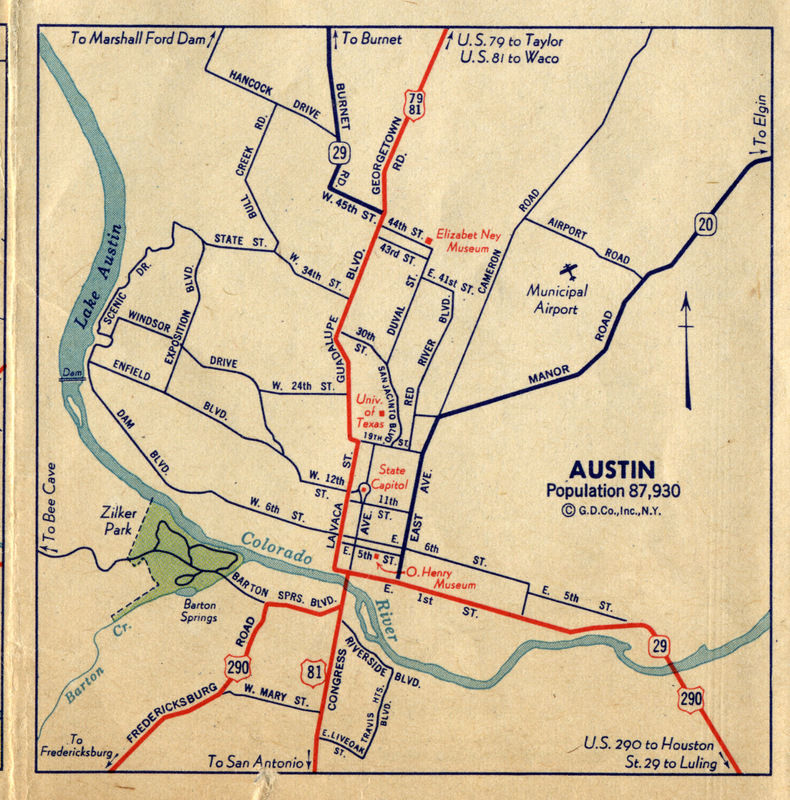 So apparently the name was changed to Zilker Springs, and then back to Barton Springs. 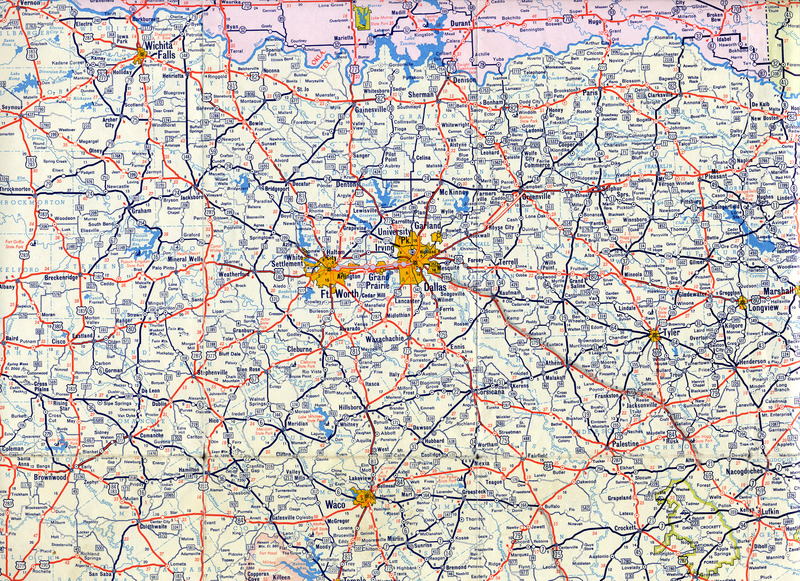 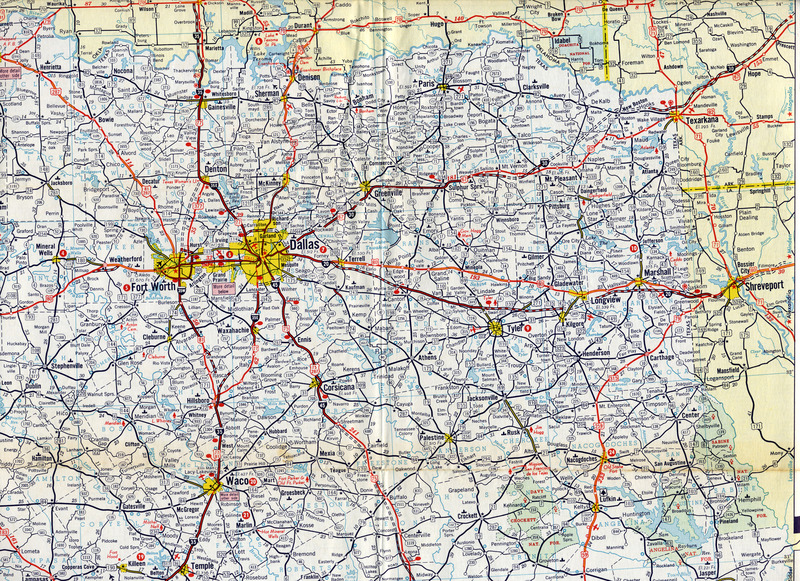 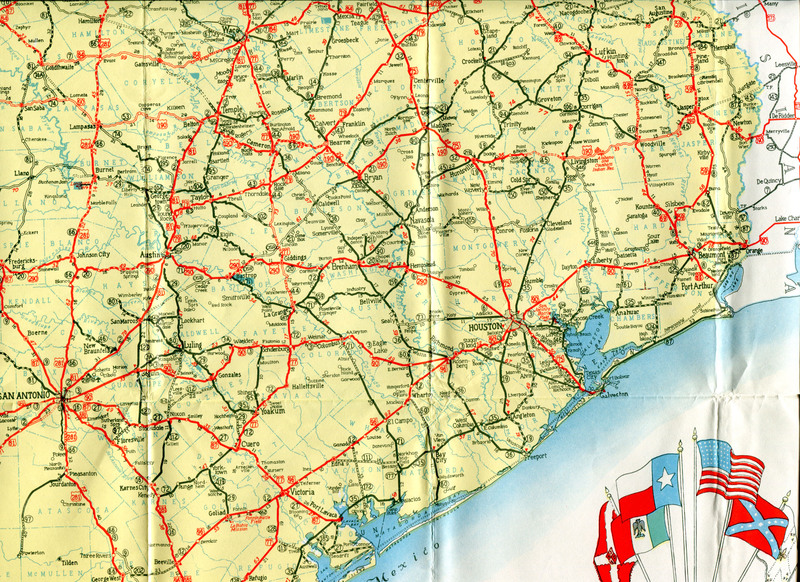 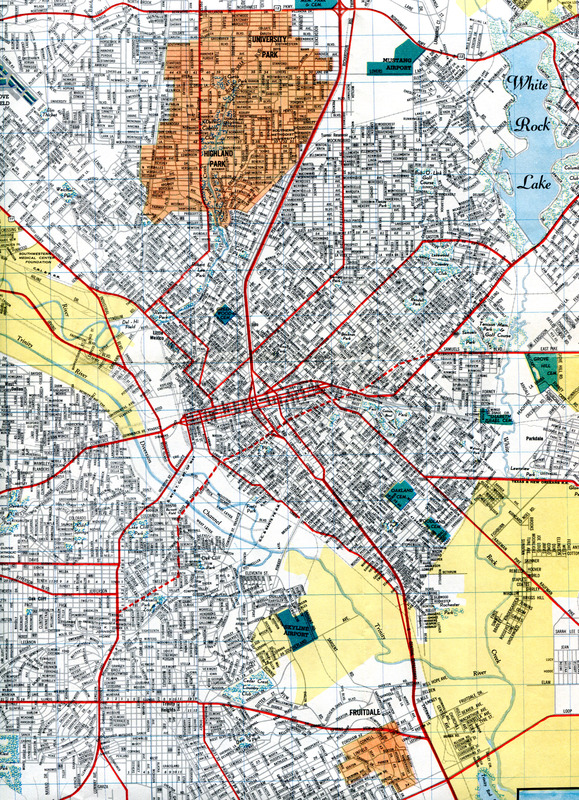 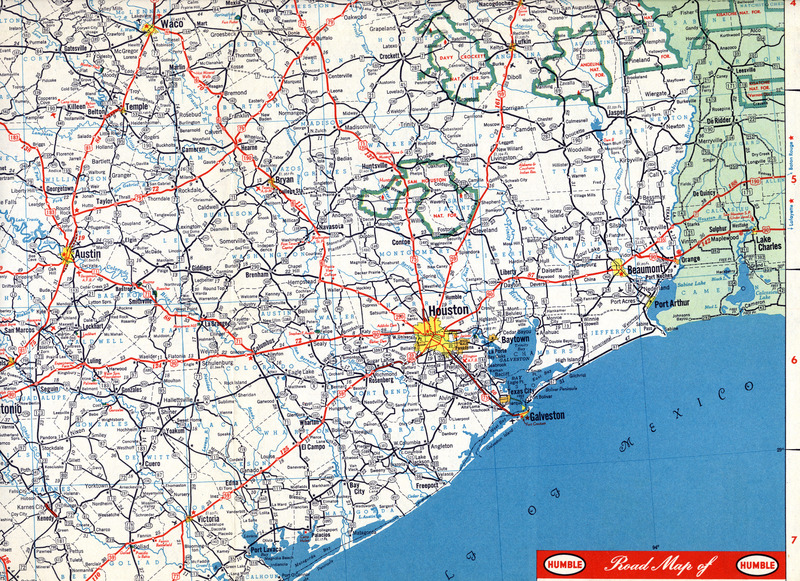 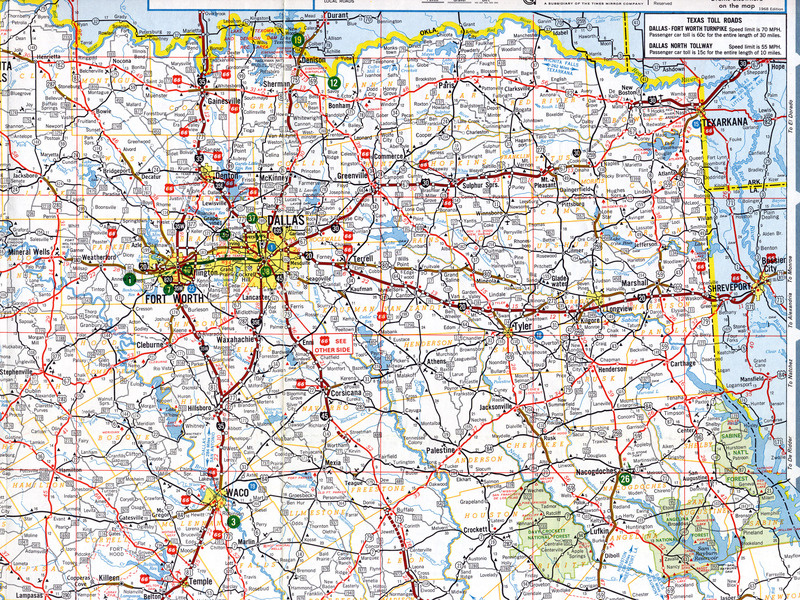 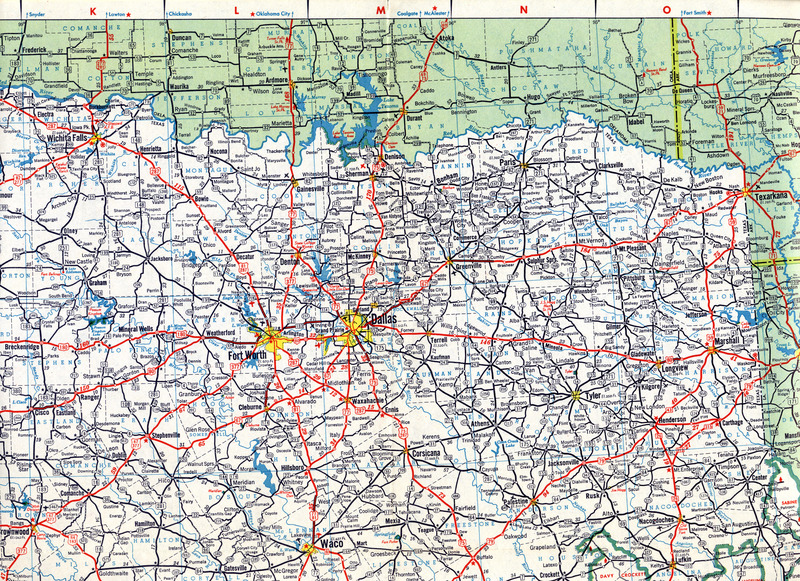 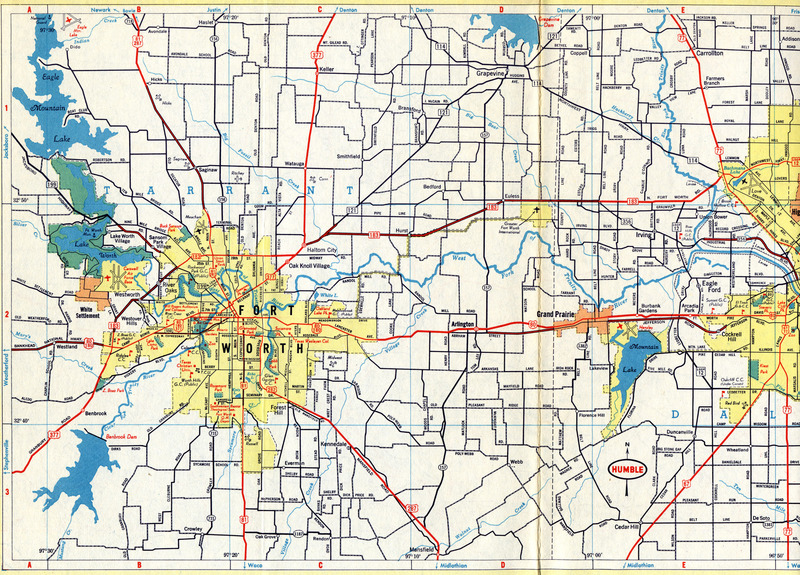 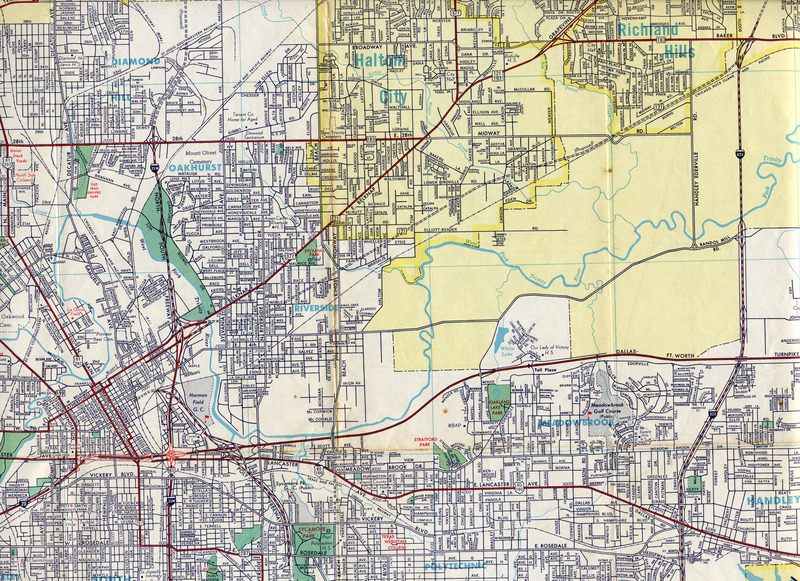 Compared to the 1950 map, this 1954 Humble map greatly expanded coverage of the DFW and Houston metropolitan areas. 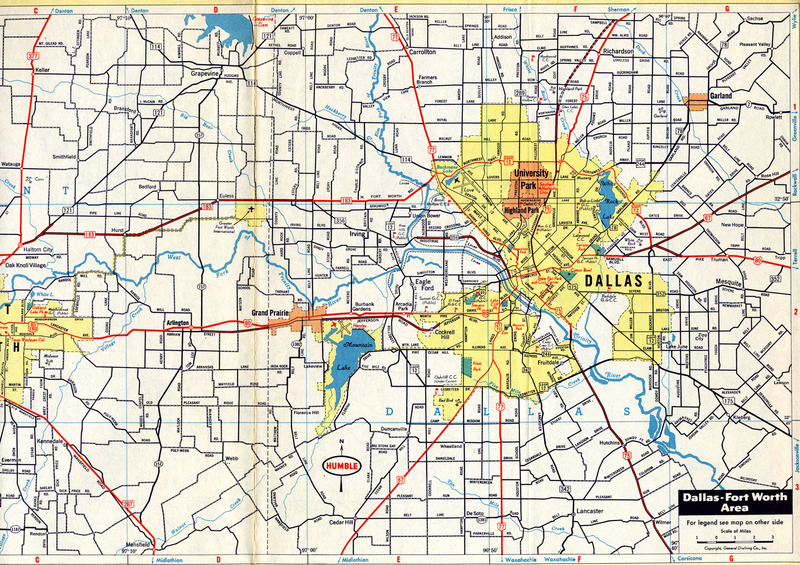 Dallas-Fort Worth Med Large This shows US 75 Central Expressway under construction in Richardson. 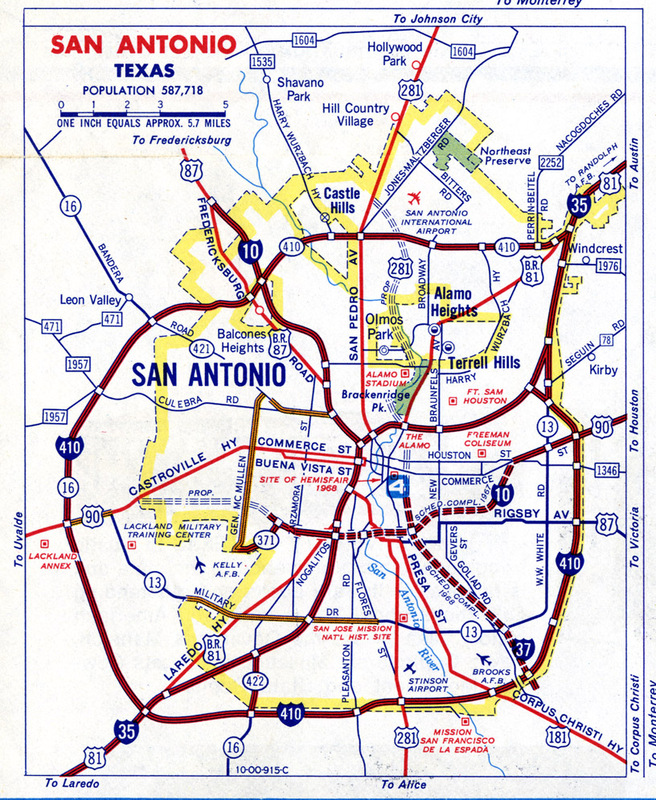 That section of freeway opened in 1954 and 1955. 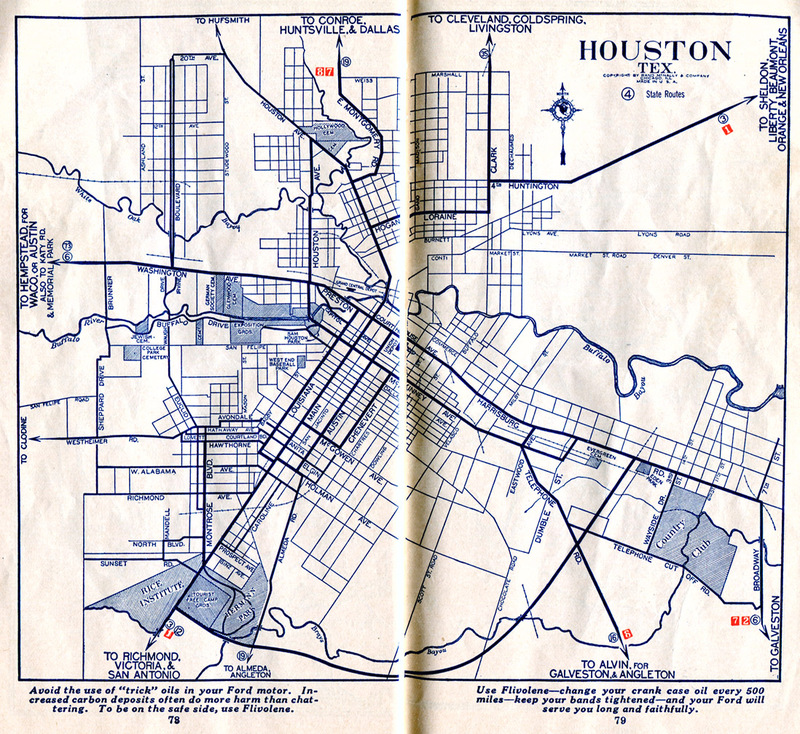 Houston Med Large This map shows several planned freeways as dashed lines. 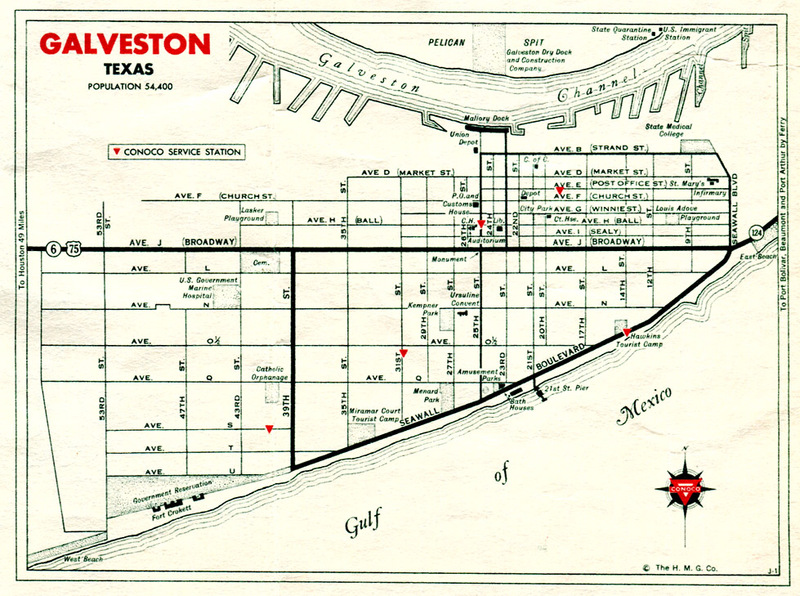 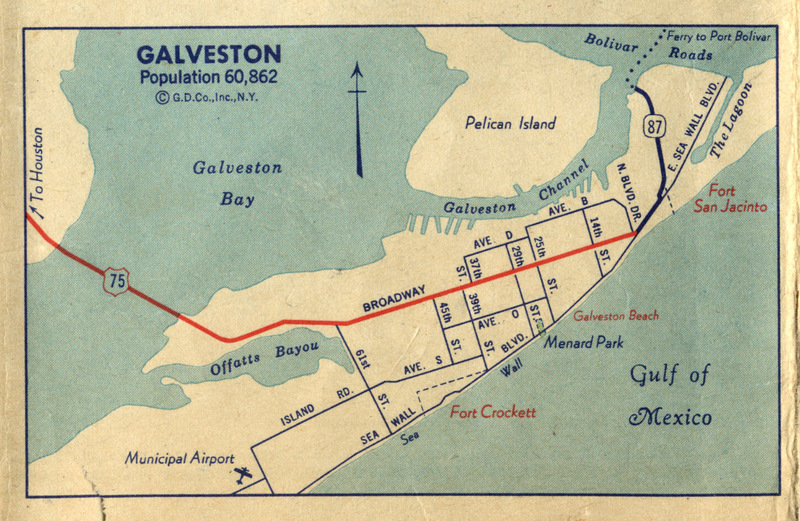 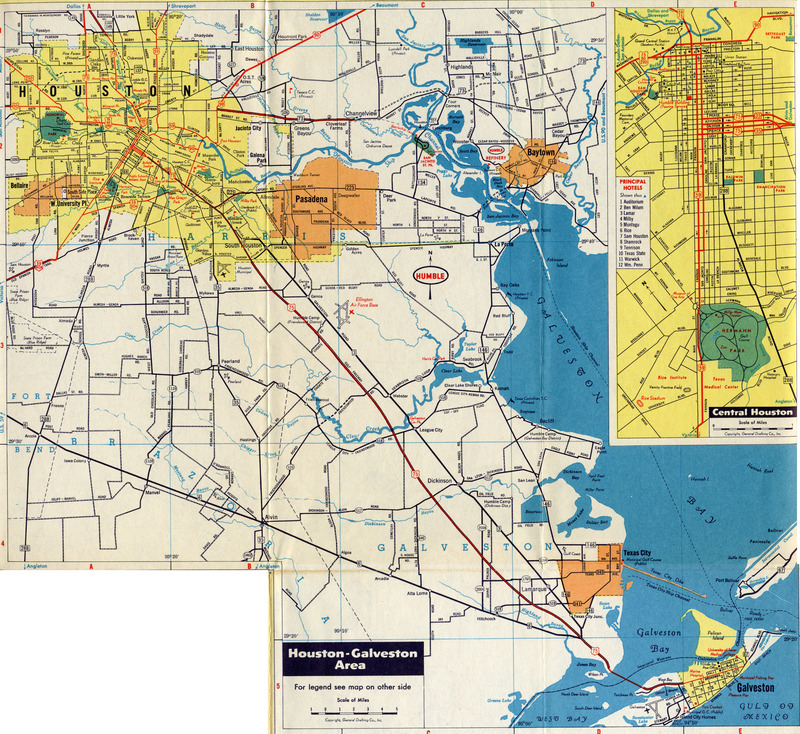 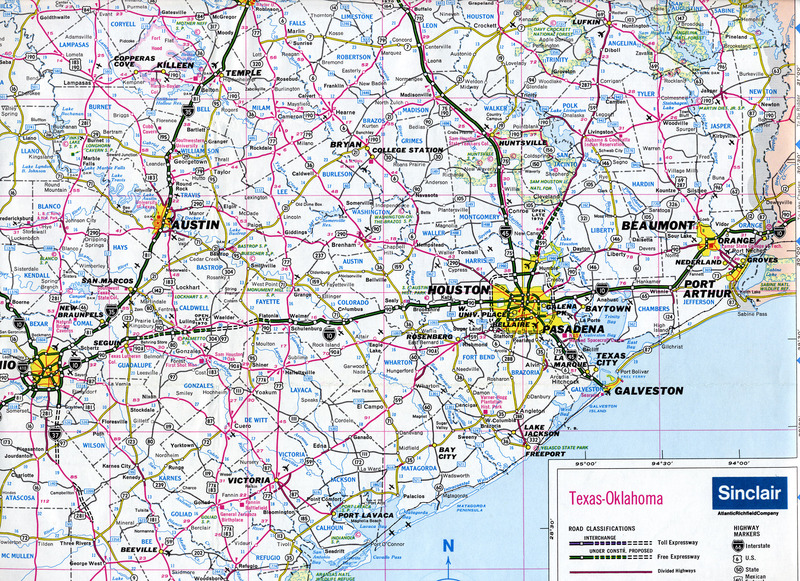 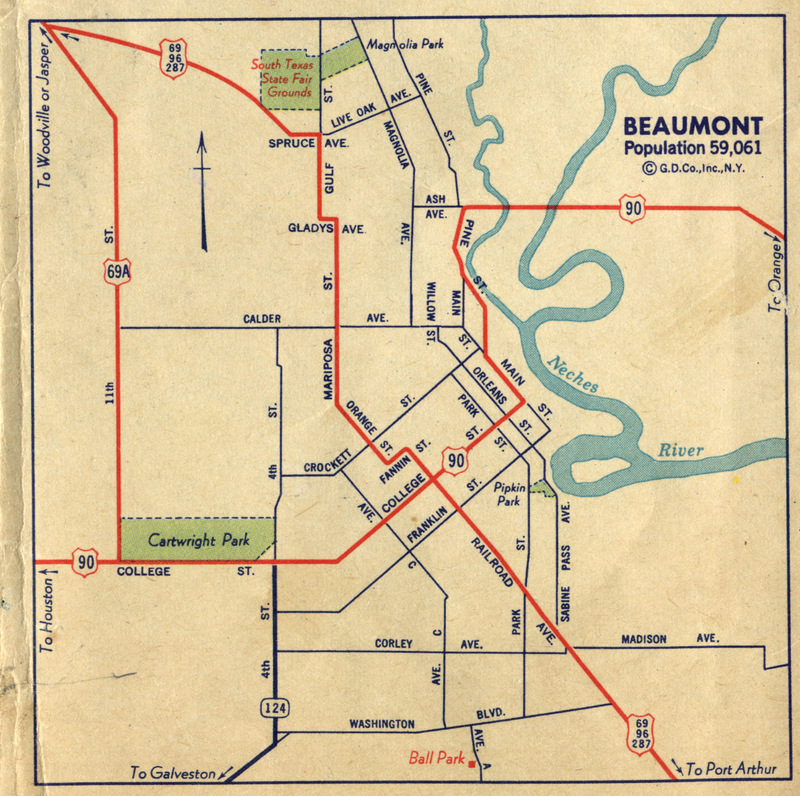 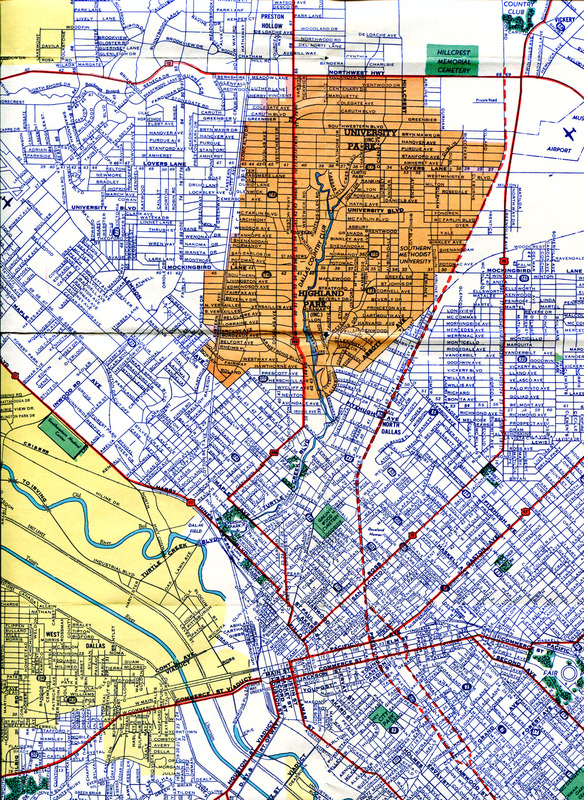 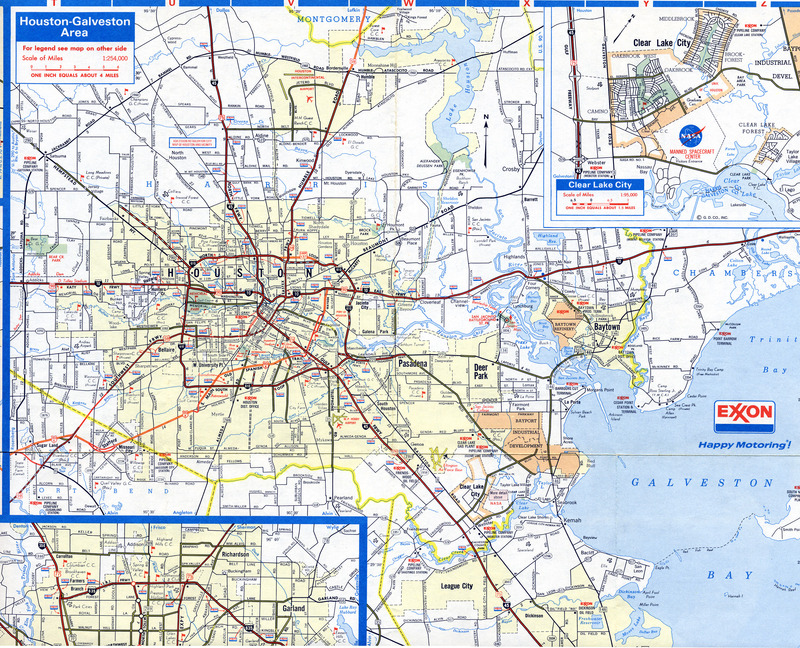 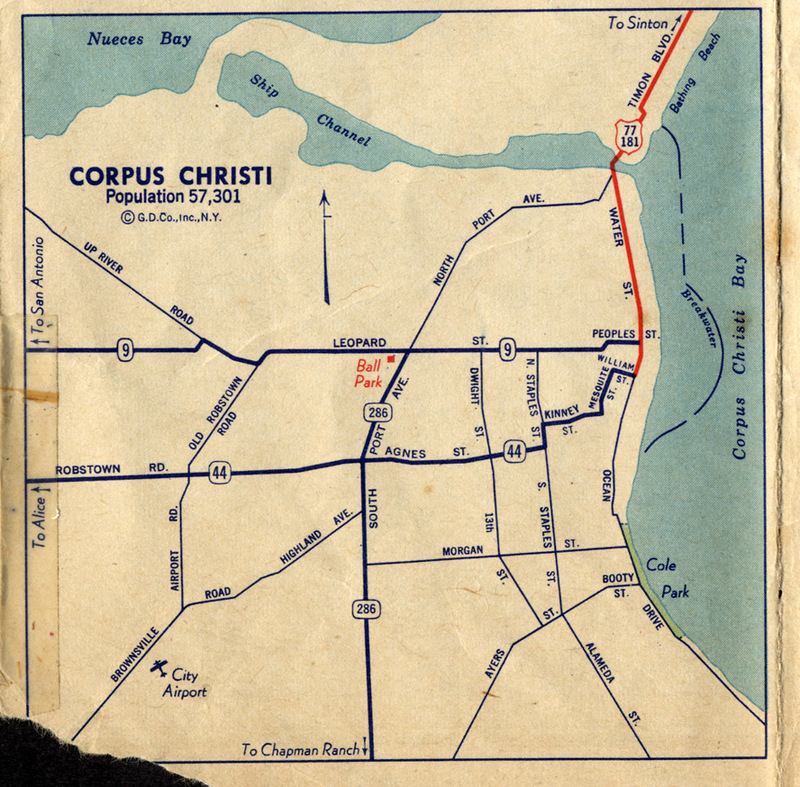 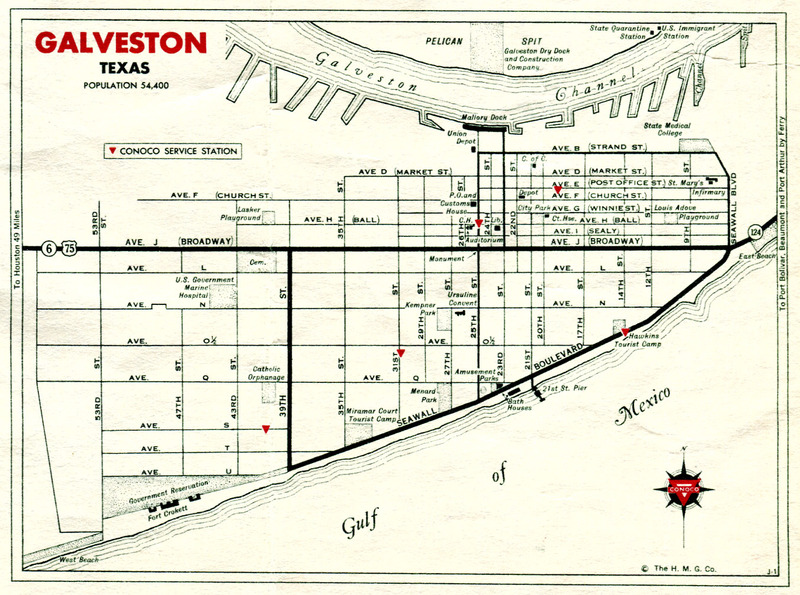 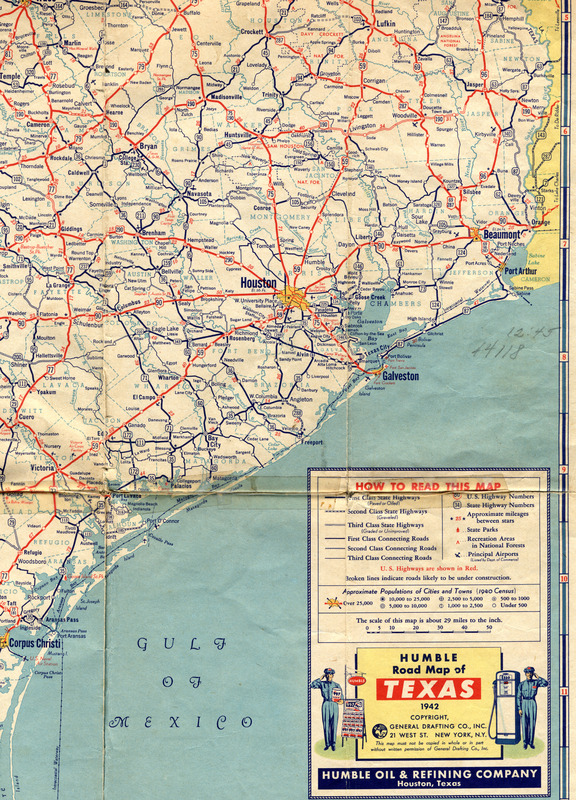 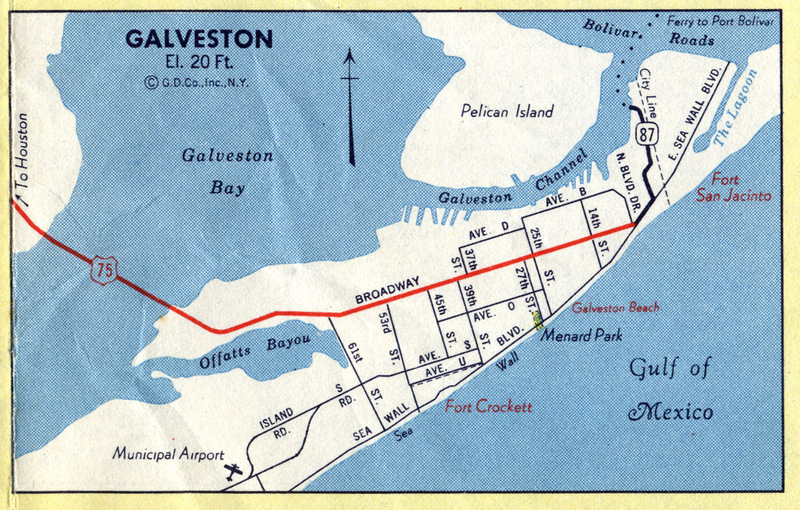 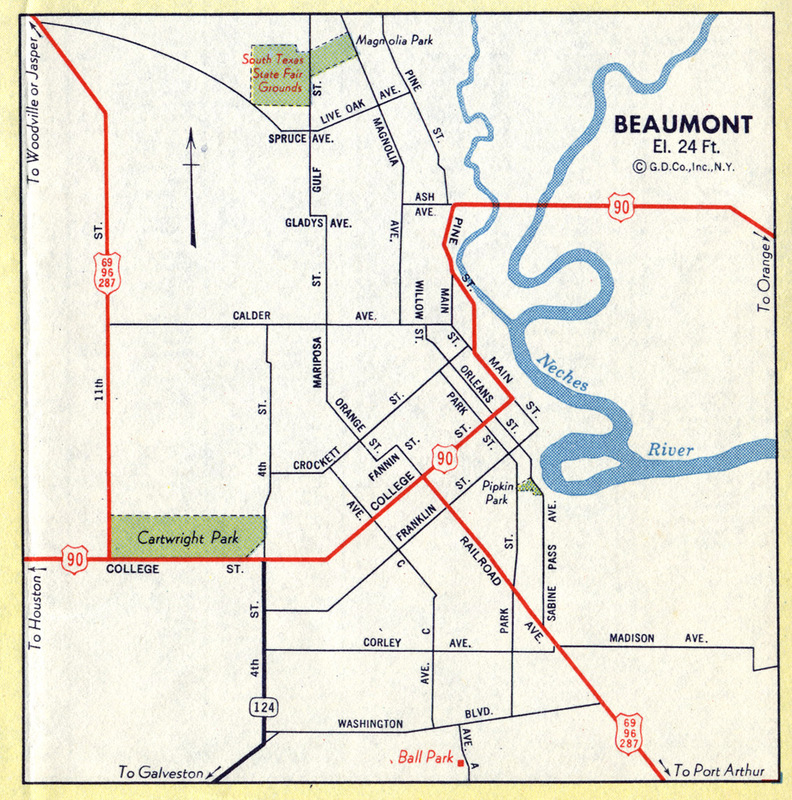 The Baytown Tunnel, opened on September 22, 1953, is shown on this map. 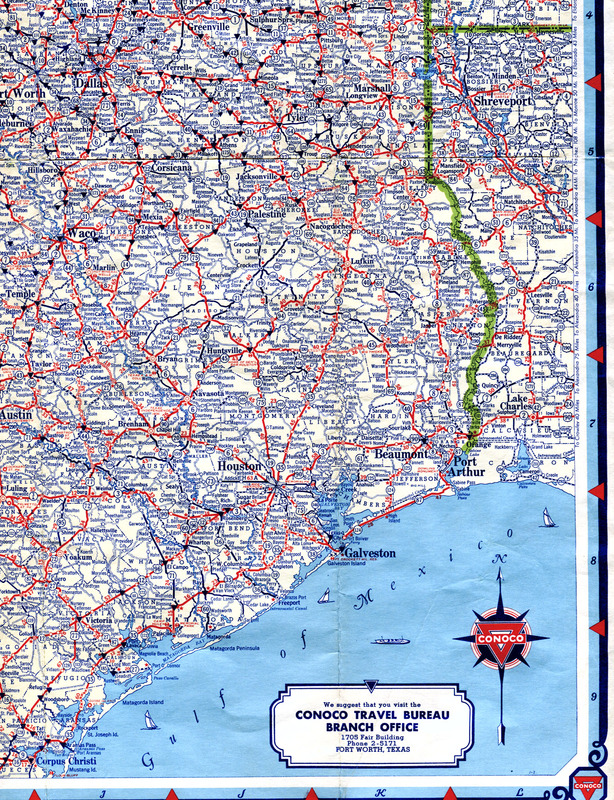 Southeast Texas Med Large Four-lane divided highways in rural areas were still rare in 1954, with the US 75 between Houston and Galveston (now the Gulf Freeway) the longest sustained length. 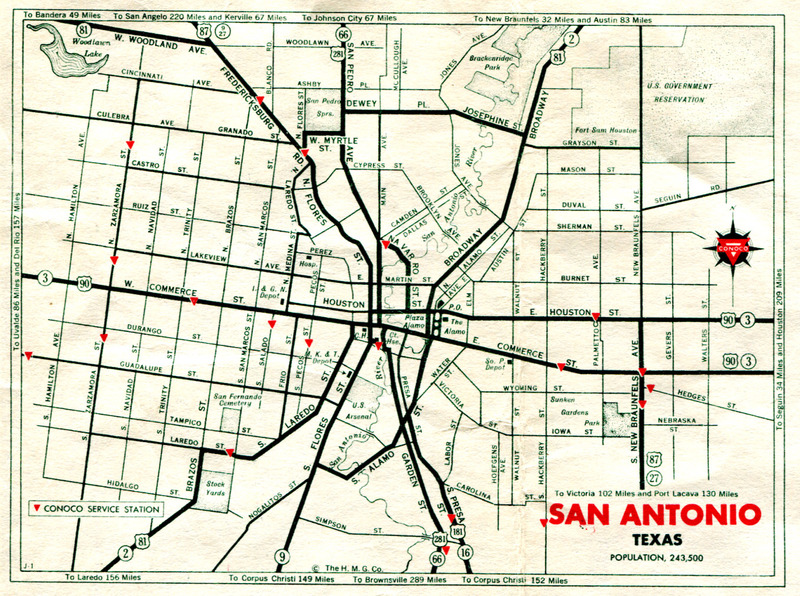 Austin and San Antonio Med Large The first planned freeways are indicated on these maps. 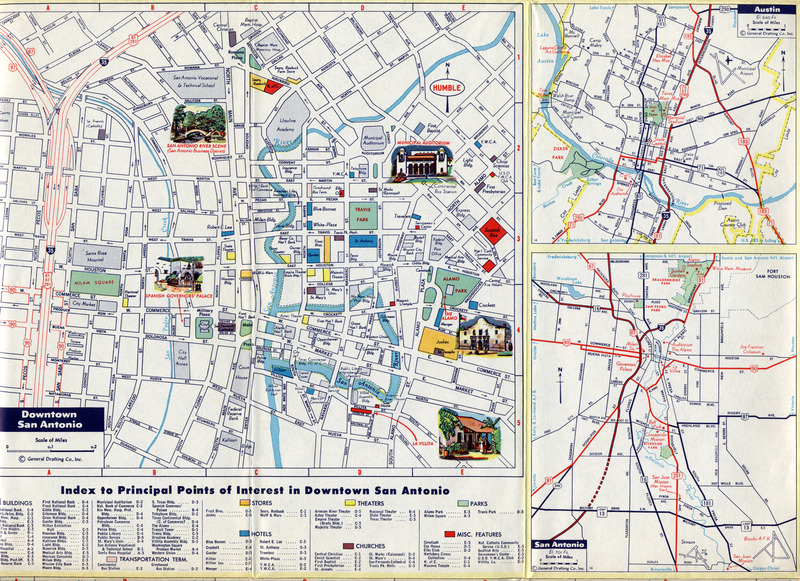 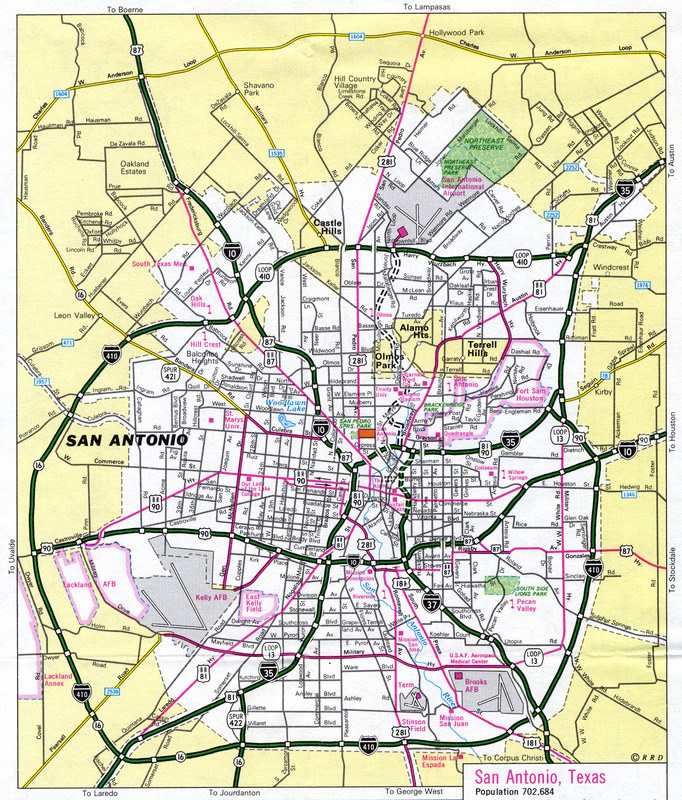 This map includes a detailed view of downtown San Antonio. 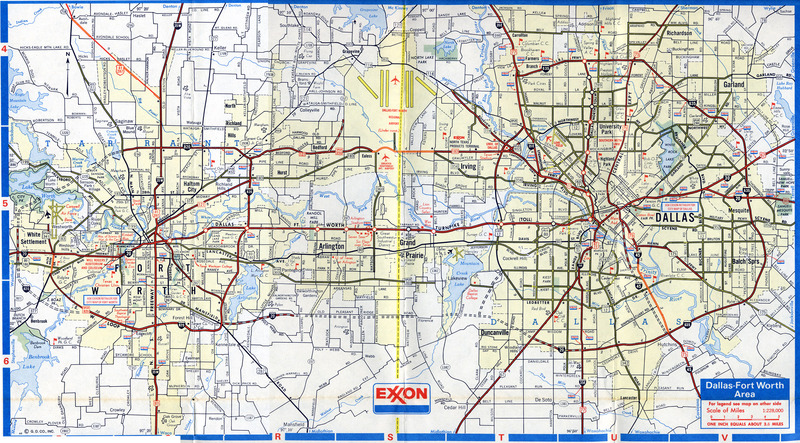 The Chevron map has less detail in the urban areas compared to the Humble map. 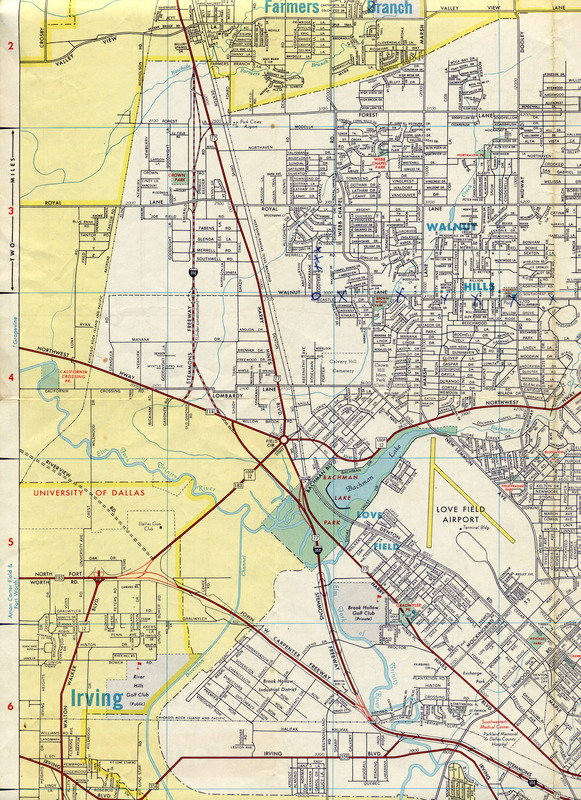 Central Dallas Large This view shows the planned route of Interstate 30 on the south side of downtown, and the planned route of Interstate 35E into South Oak Cliff. 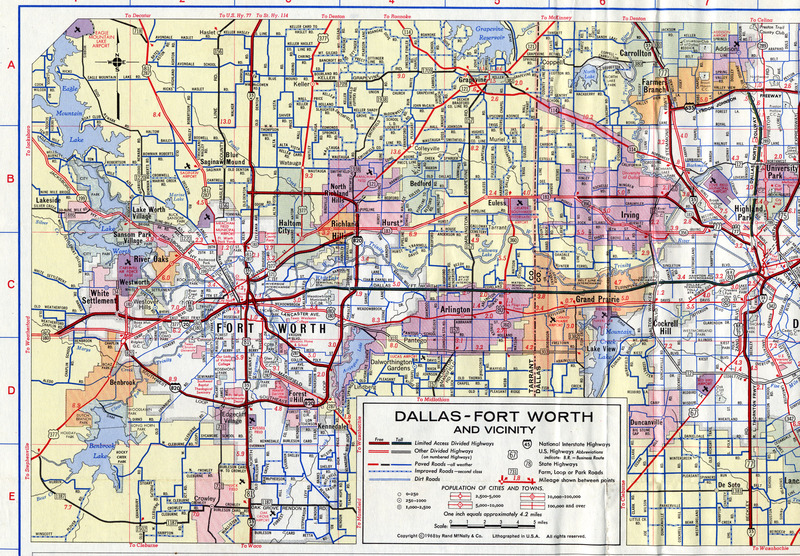 Dallas-Fort Worth Med Large This map includes the DFW Turnpike, which opened Aug 27, 1957. 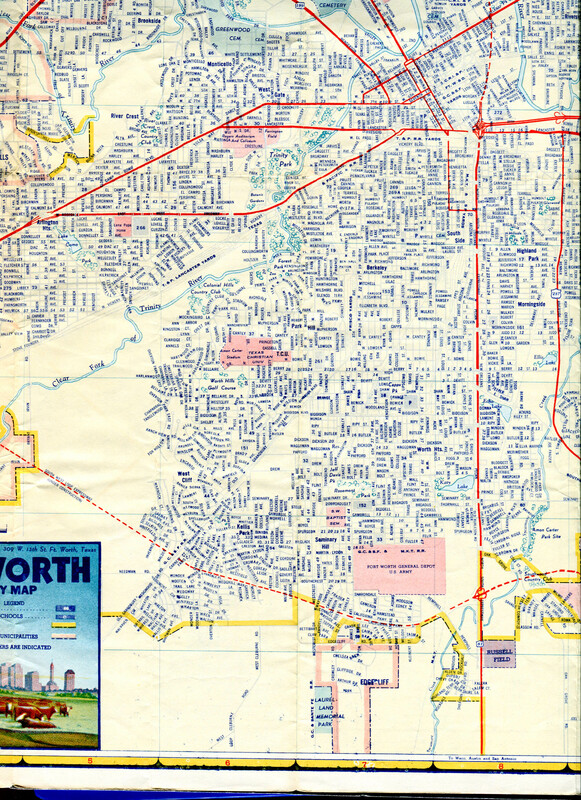 Regional Map Large This map shows the proposed alignments of many Fort Worth freeways, including the north-south freeway in west Fort Worth which was dropped from plans soon after this map was made. 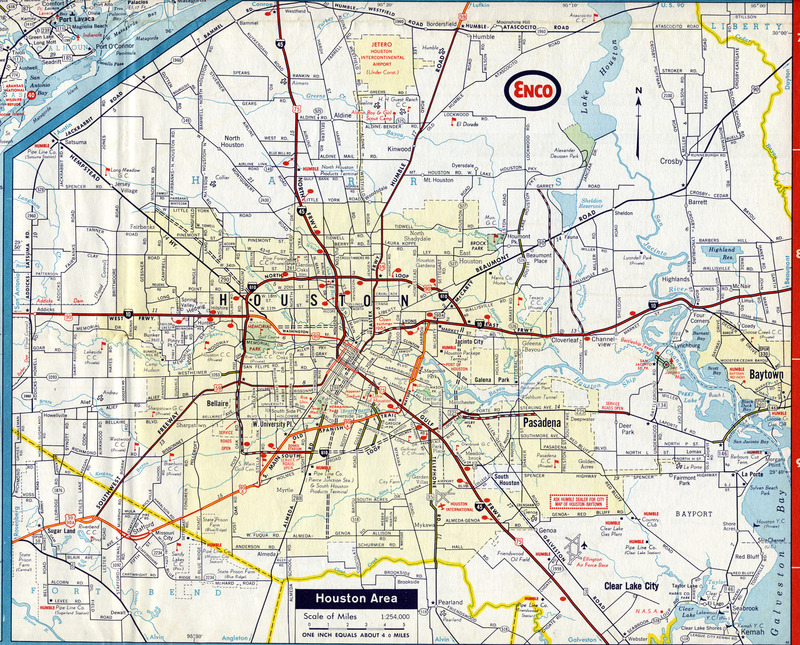 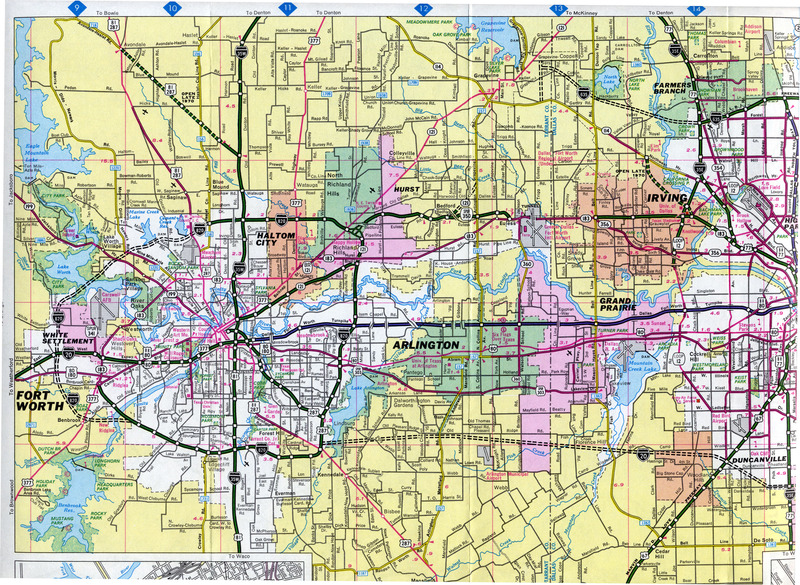 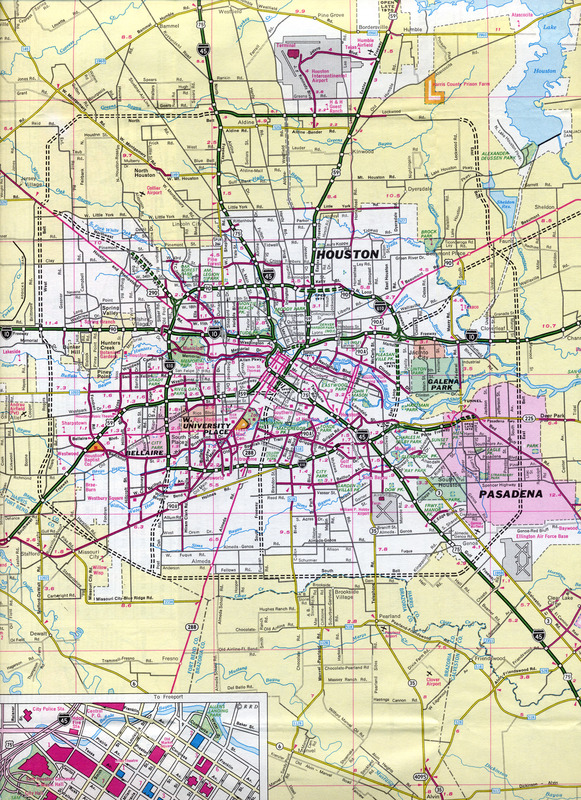 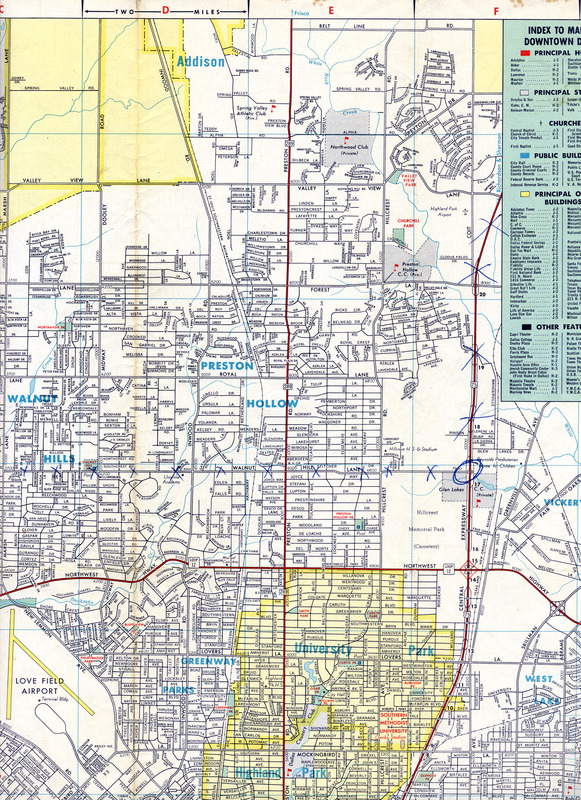 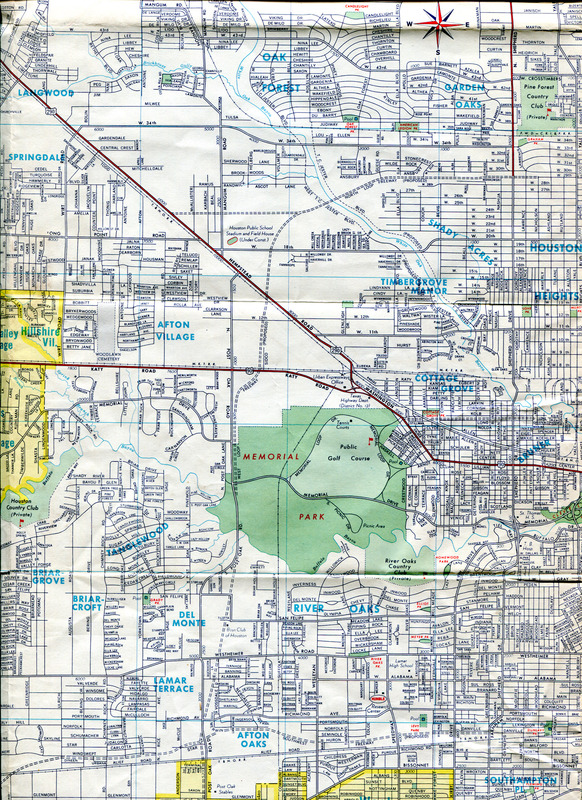 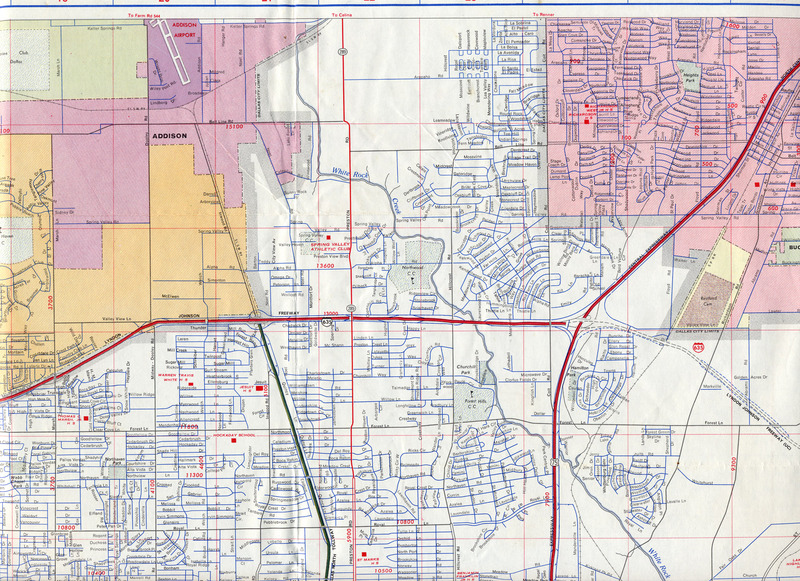 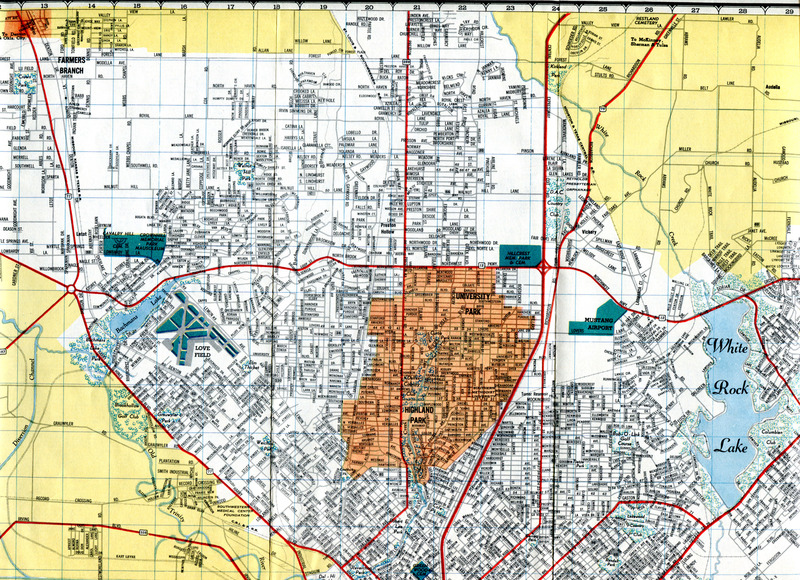 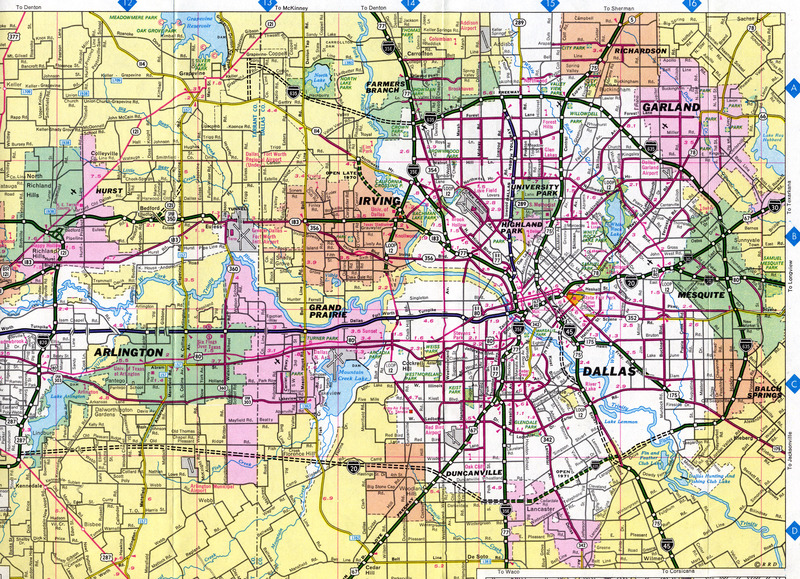 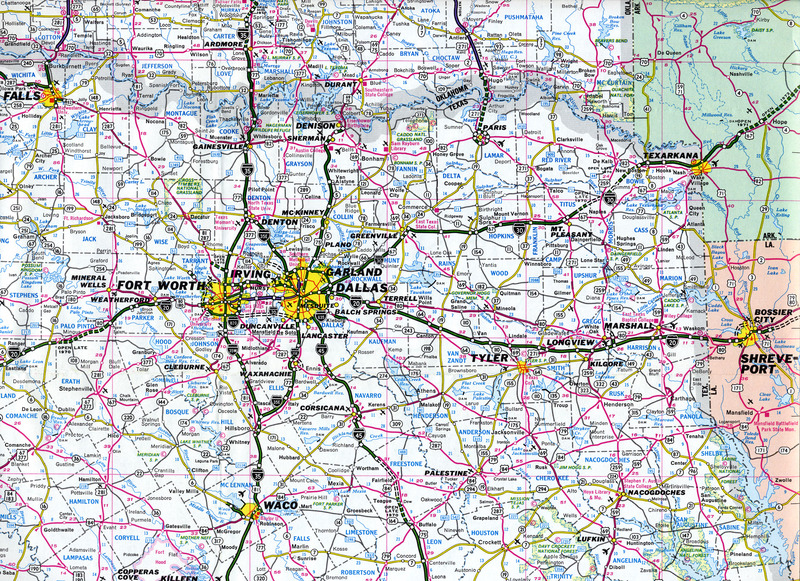 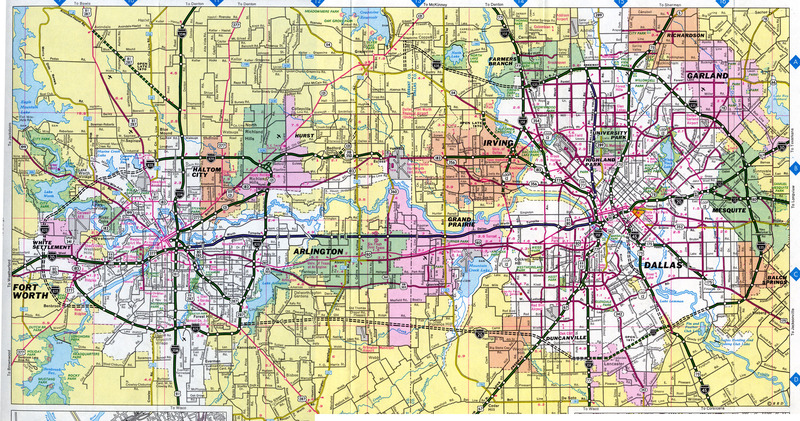 This map also shows an east-west route in Arlington between present-day I-20 and I-30. 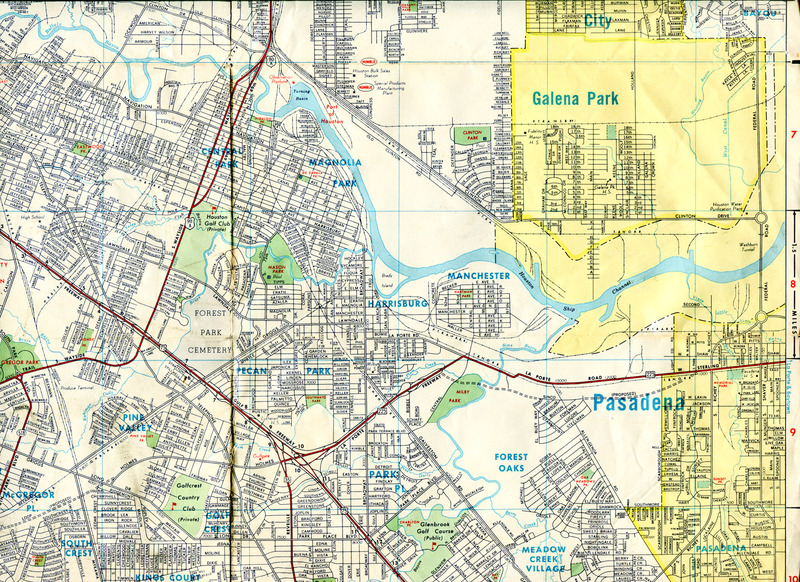 I had not seen that proposed alignment on any other map, but it would have been an eastward extension of the proposed East Rosedale freeway. 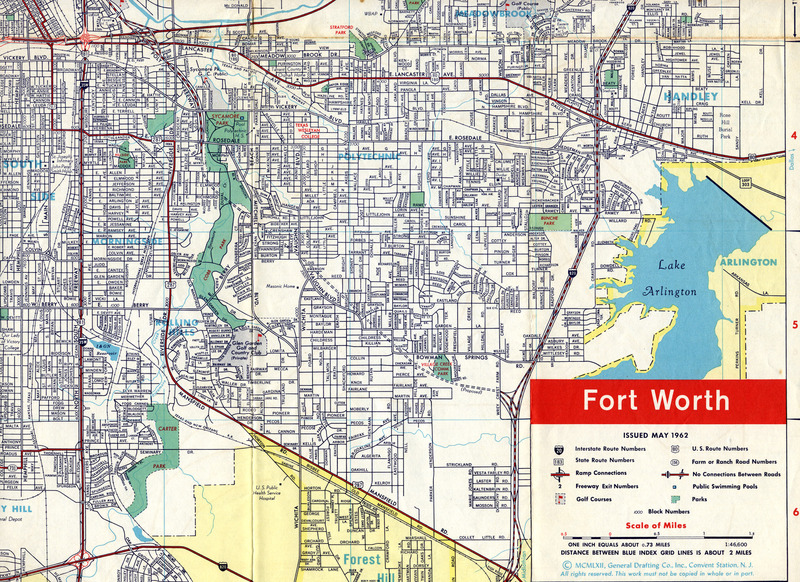 Southeast Fort Worth Large The inset map for Amon Carter field shows a proposed extension of the northwest-southeast runway to 12,000 feet. 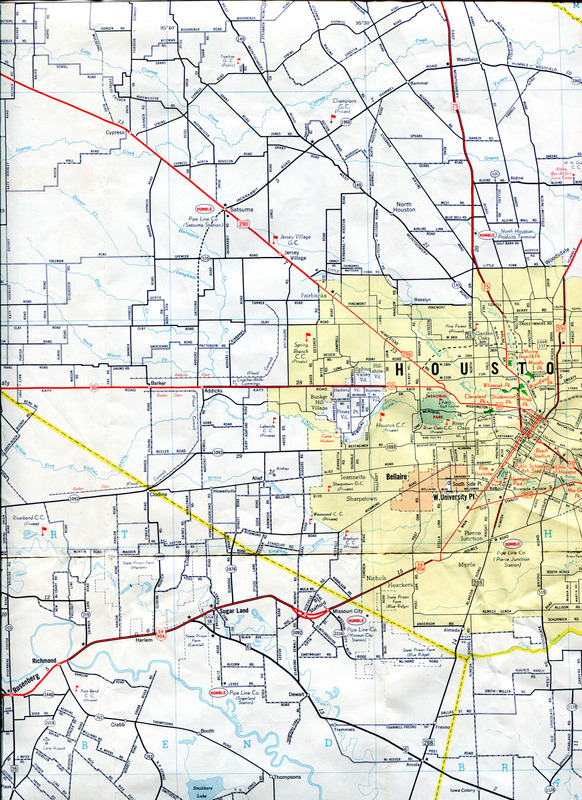 That proposal did not happen, and instead the north-south runway was extended (but not to 12,000 feet). 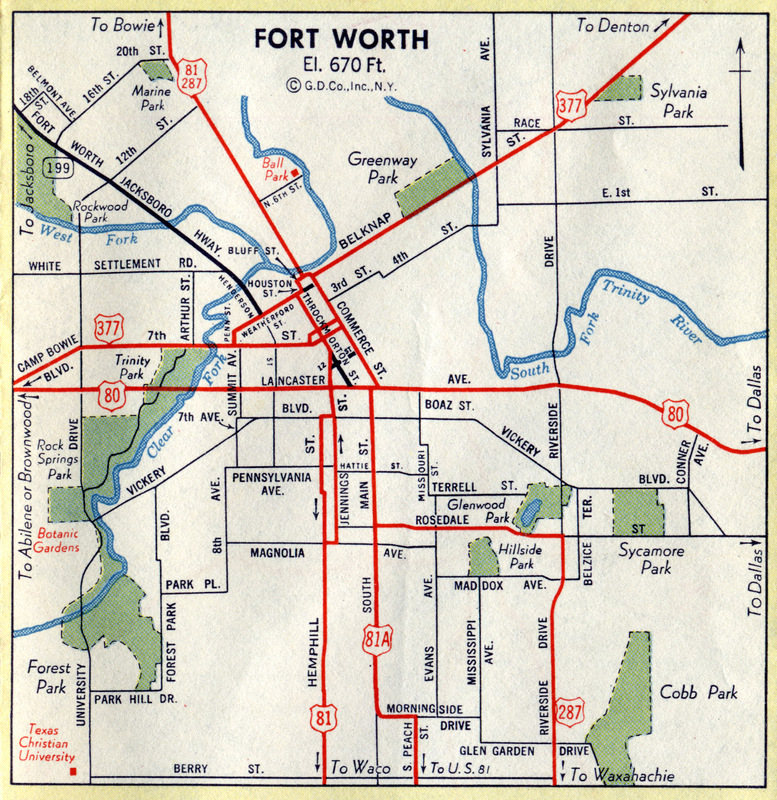 South Fort Worth Large The southwest section of the loop is identified as being under construction. 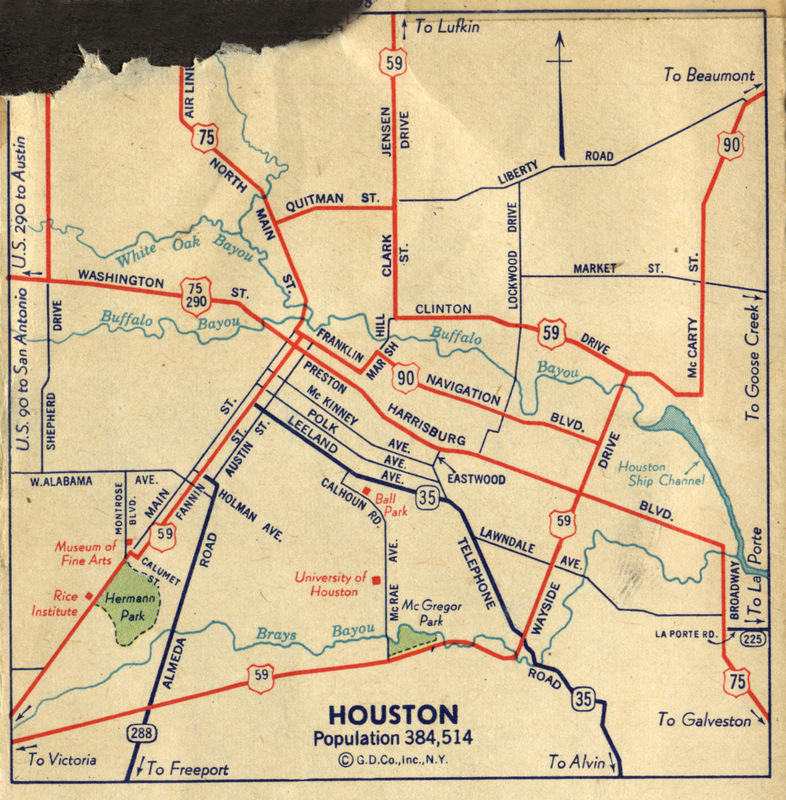 This map shows the planned alignments of many freeways in Houston, including Loop 610, US 59 Southwest Freeway, and Interstate 10. 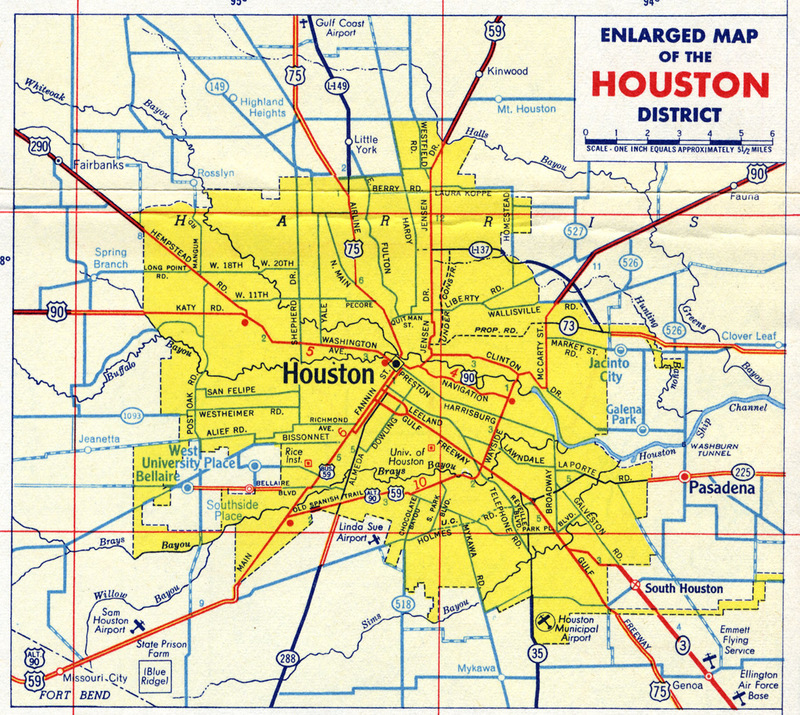 West Houston Large This view shows the planned alignment of the West Loop. 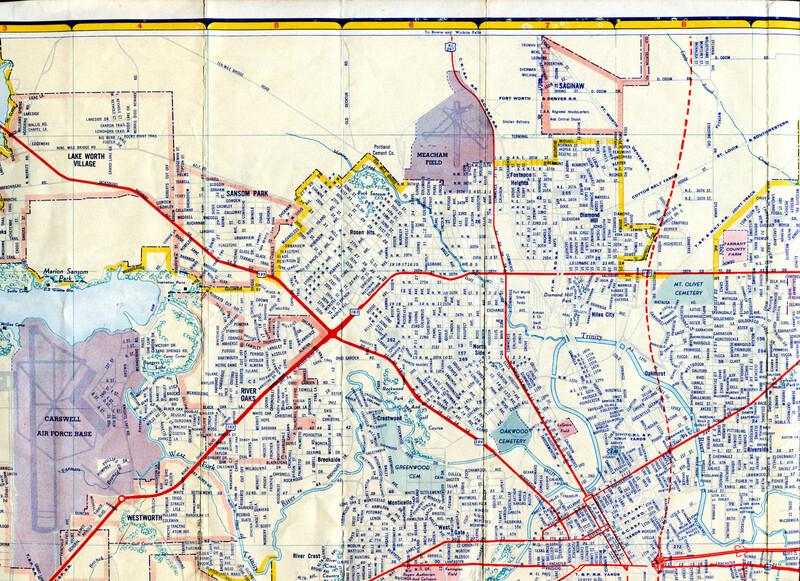 Southwest Houston Large This view shows the area where I grew up, in Sharpstown. 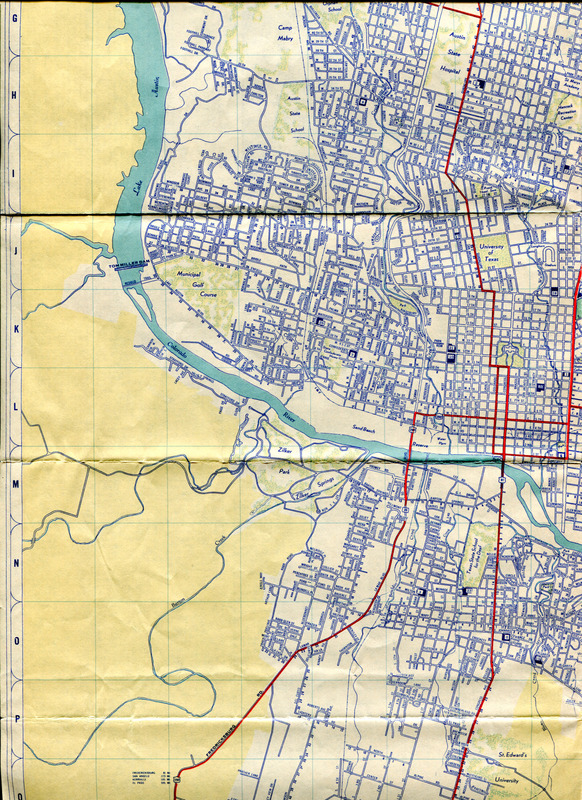 But the streets of my neighborhood were not yet on the map. 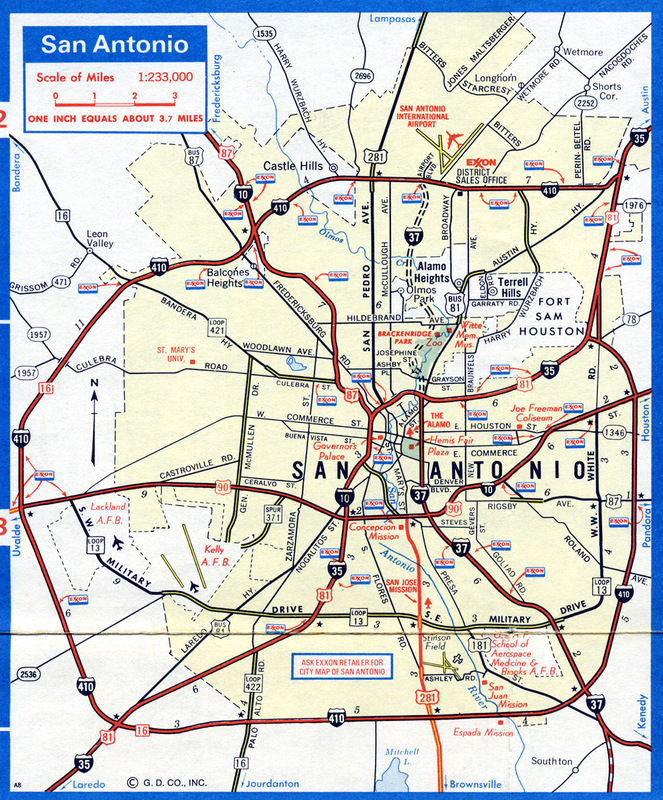 The planned alignment of the Southwest Freeway is shown. 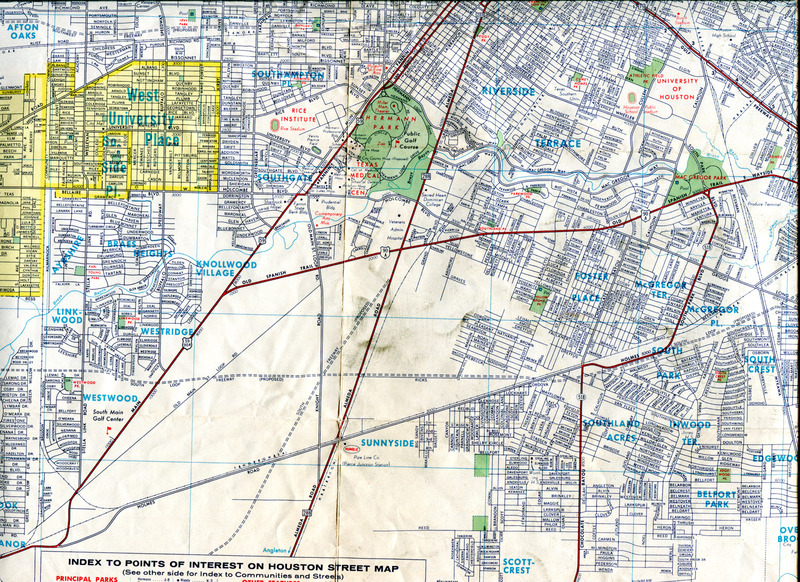 South Houston Large This view shows the planned alignment of the South Loop and the area that would become the Astrodome complex. 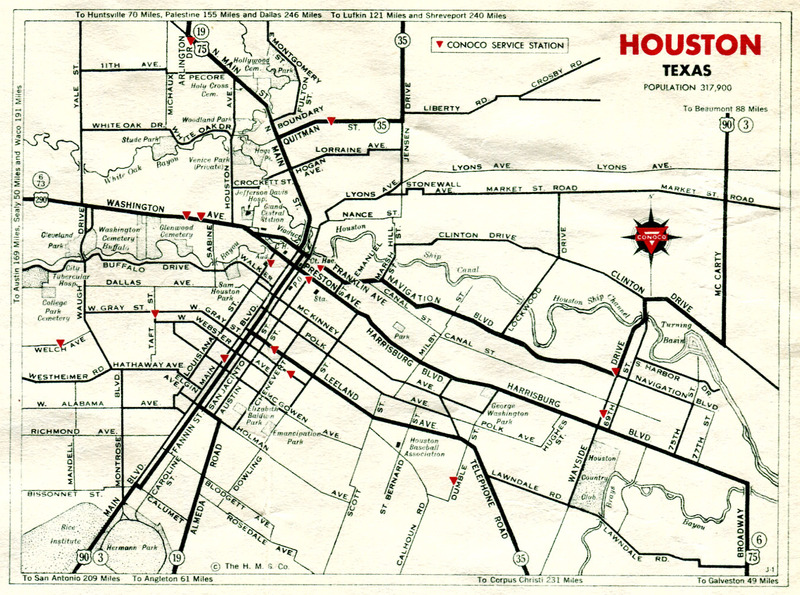 Work on the Astrodome was underway around 1962. 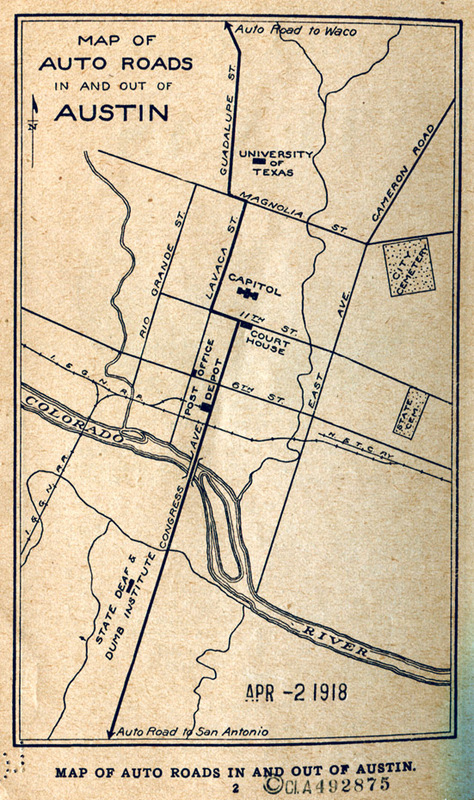 The original planned aligment of the South Freeway SH 288 is shown. 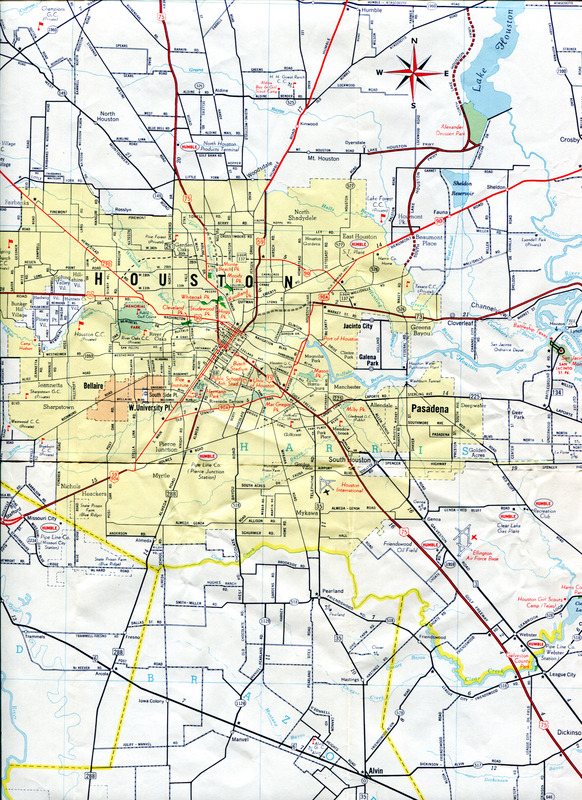 Northwest Houston Large There is no indication of the planned Northwest Freeway US 290. Downtown Houston Large Major highways still came through downtown on the surface streets. 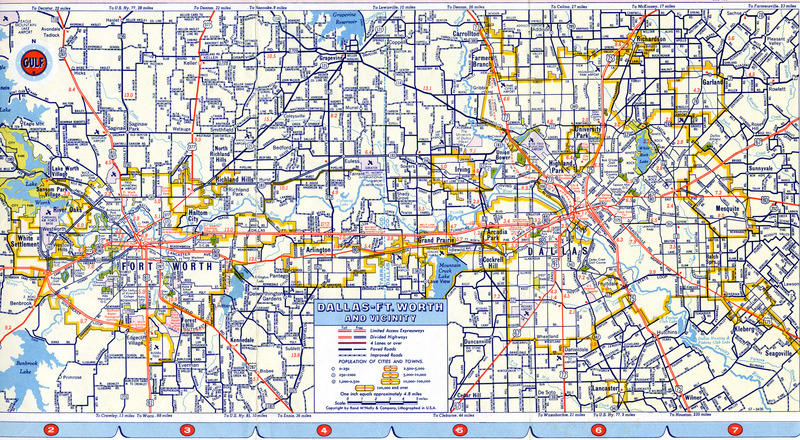 Dallas-Fort Worth Med Large This shows the developing freeway network with interstate designations. 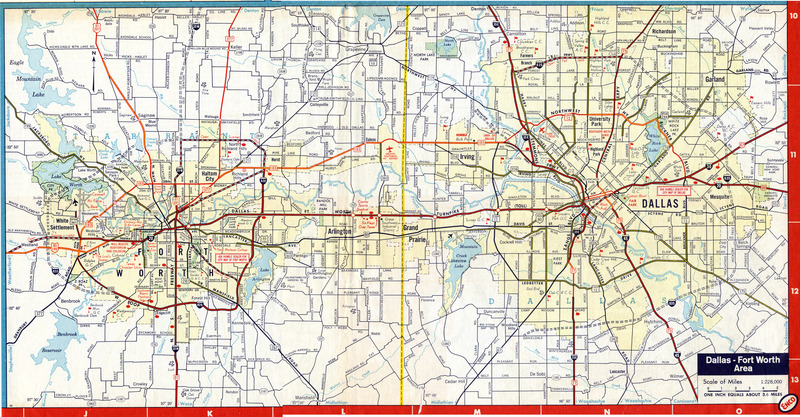 However, this map does not differetiate between freeway and non-freeway divided highways. 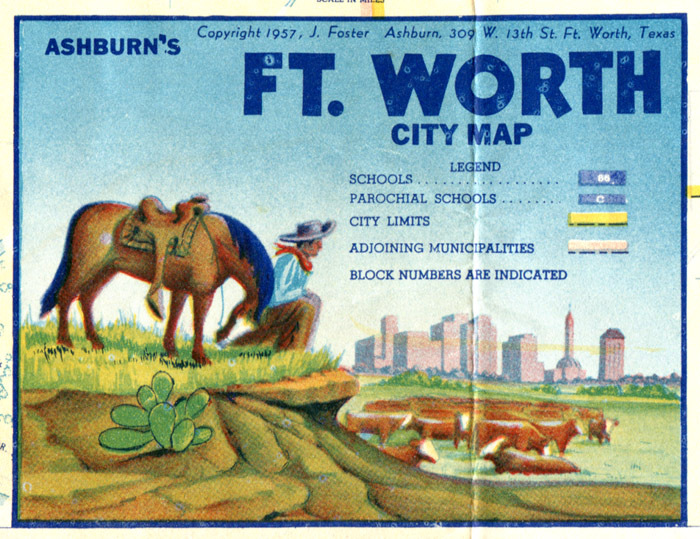 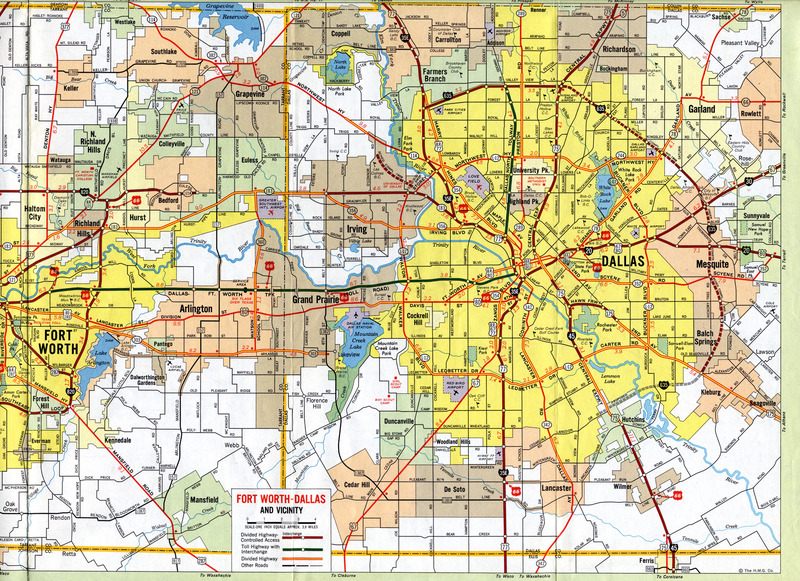 This is a city street map for both Dallas and Fort Worth. 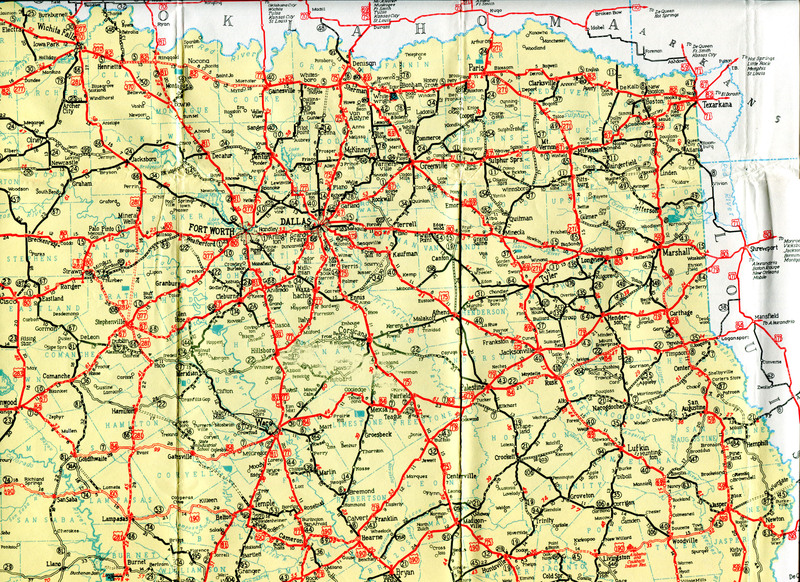 Southeast Texas Med Very little of I-10 west of Houston was complete as of 1965. 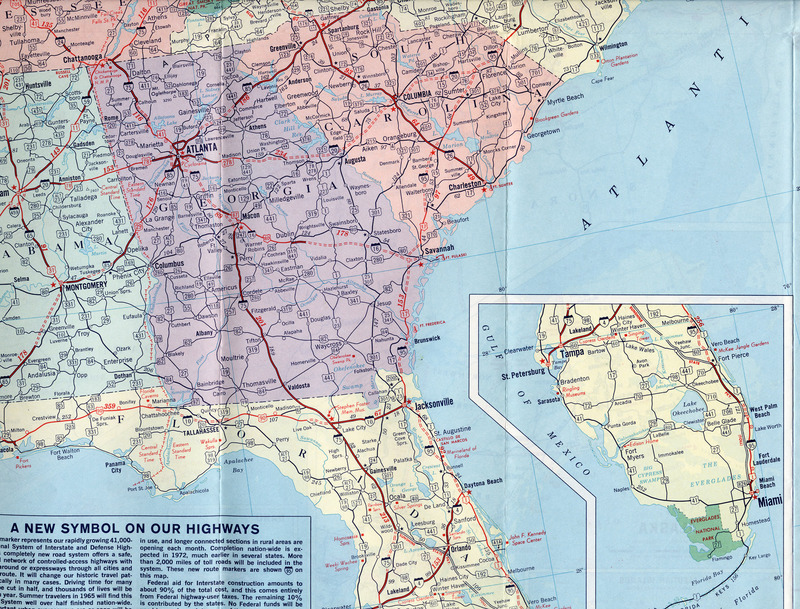 As of Spring 1965 the Interstate Highway System was approximately 50% complete. 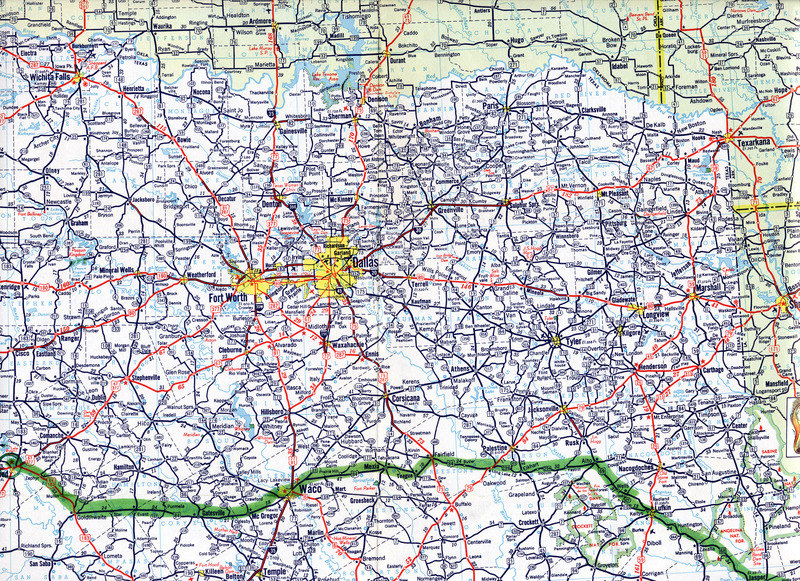 North Texas Med Large This shows I-20 east of Dallas complete to the Louisiana border except for a short section near Longview. 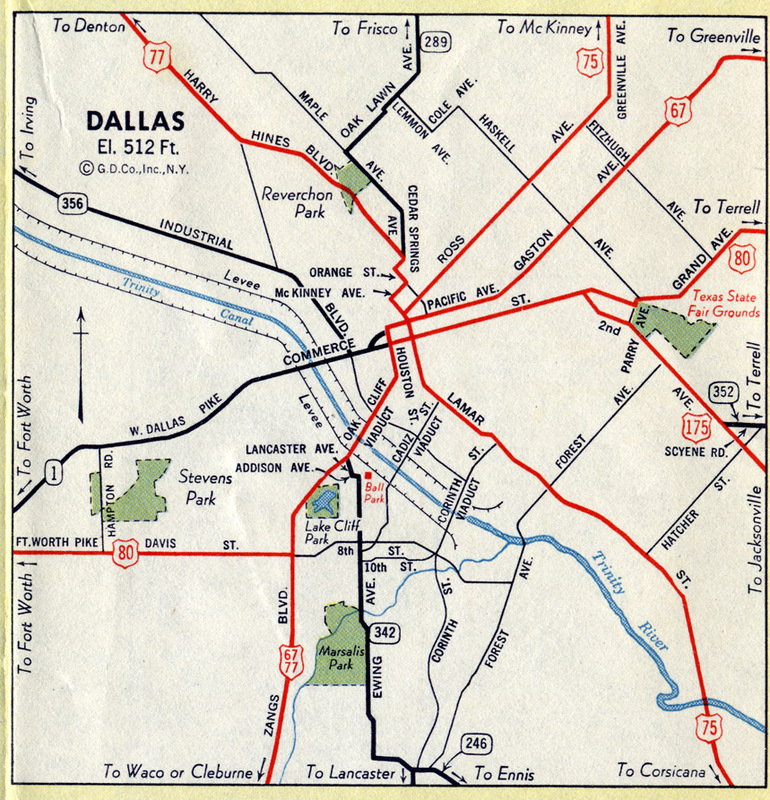 The section near Longview was completed and dedicated on May 6, 1967. 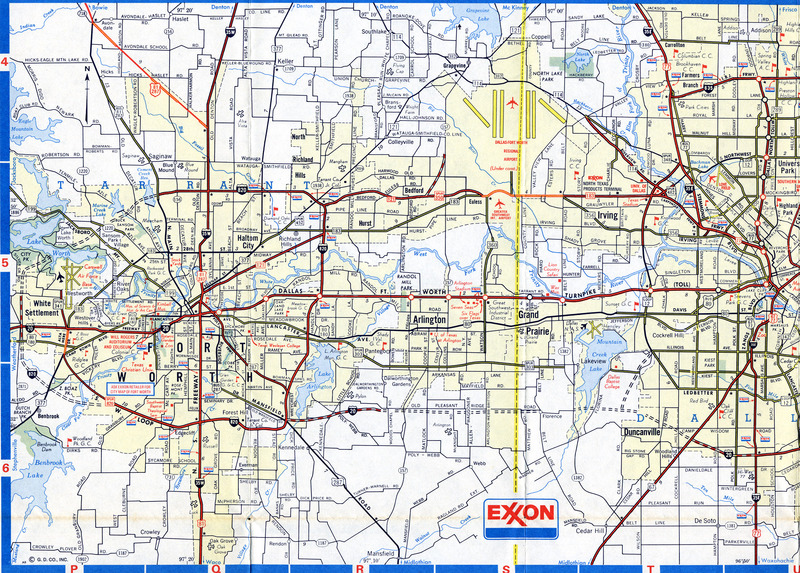 I-45, Dallas to Houston Med This shows a large gap remaining between Madisonville and Richland. 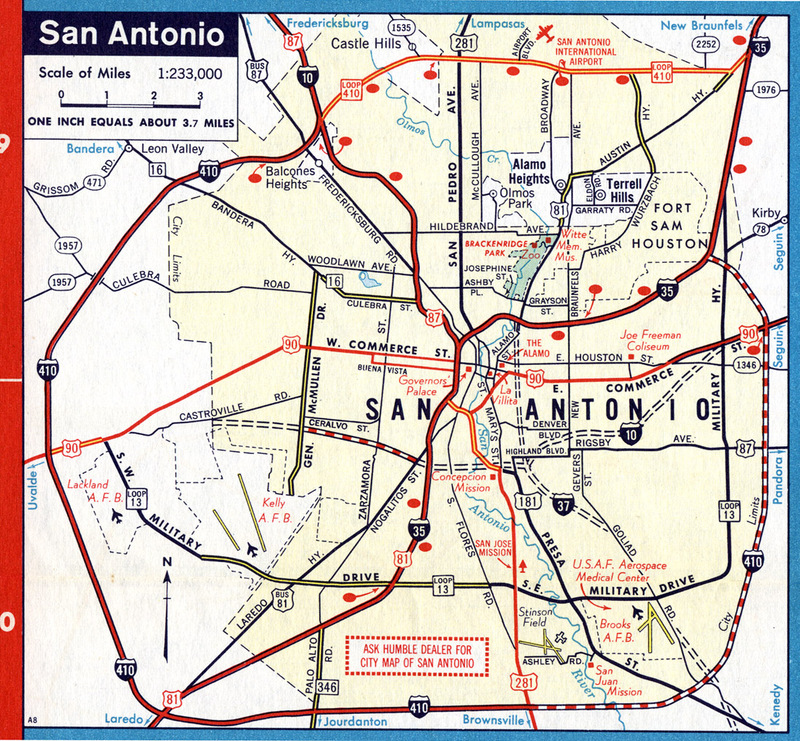 The gap was completely closed in October 1971. 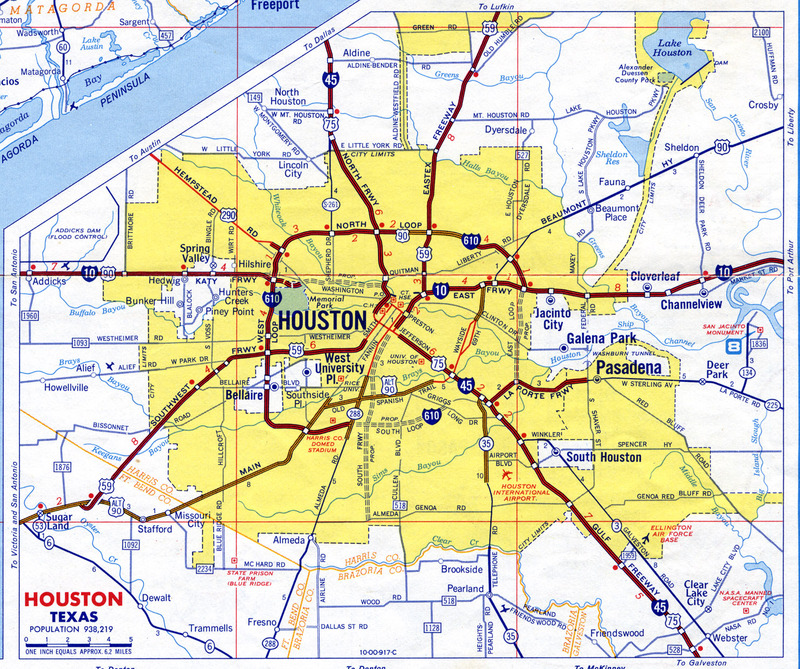 Houston Med The core freeway system is substantially complete. 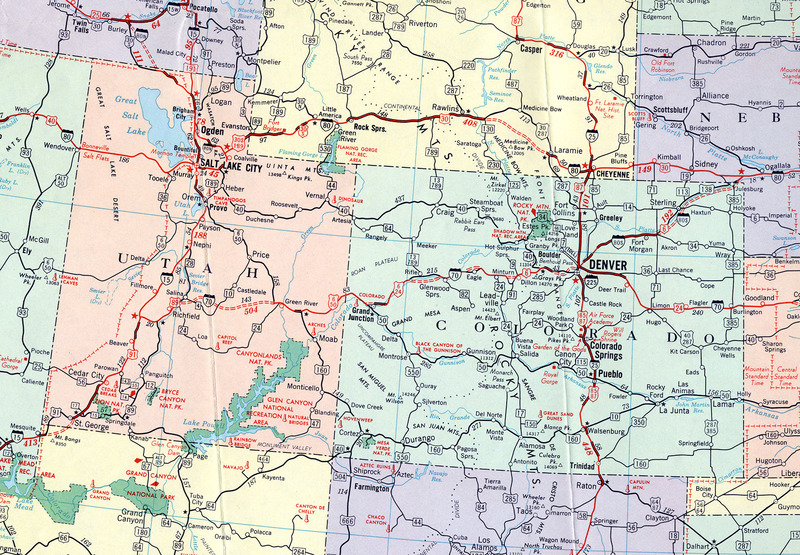 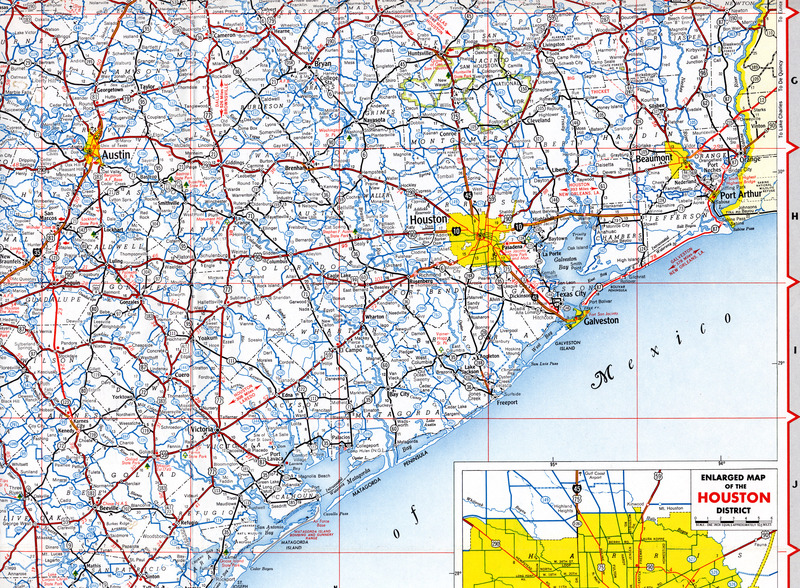 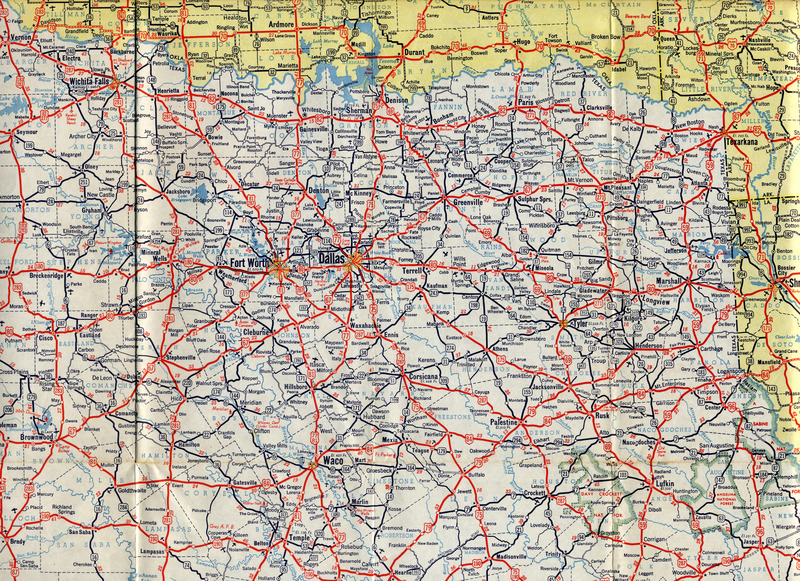 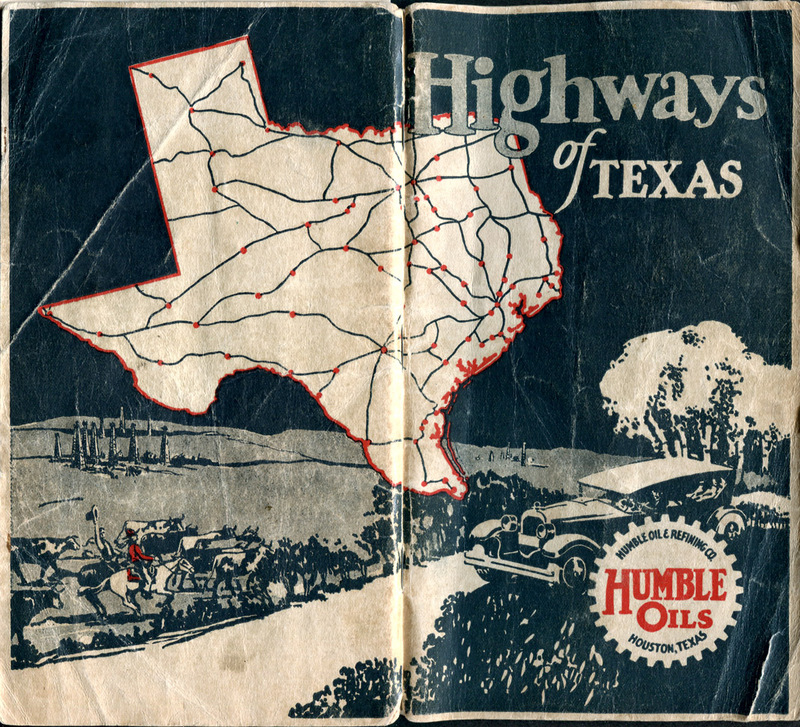 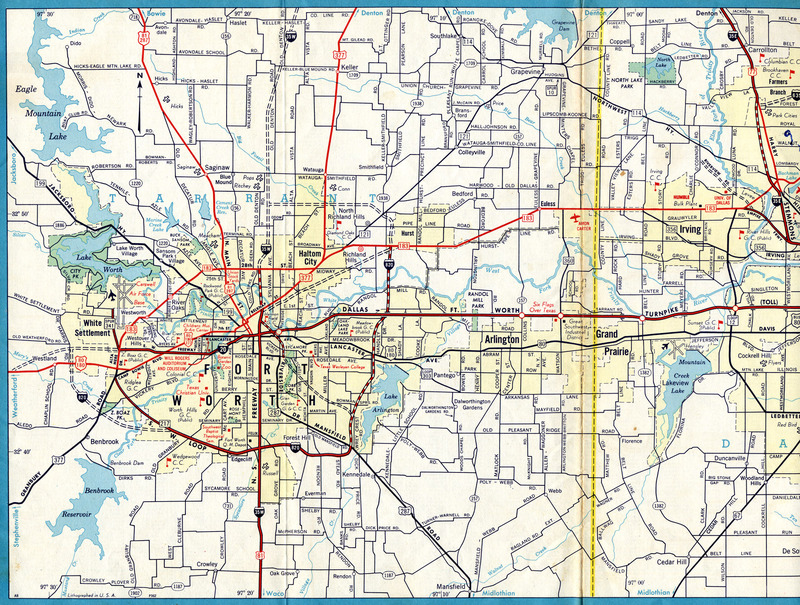 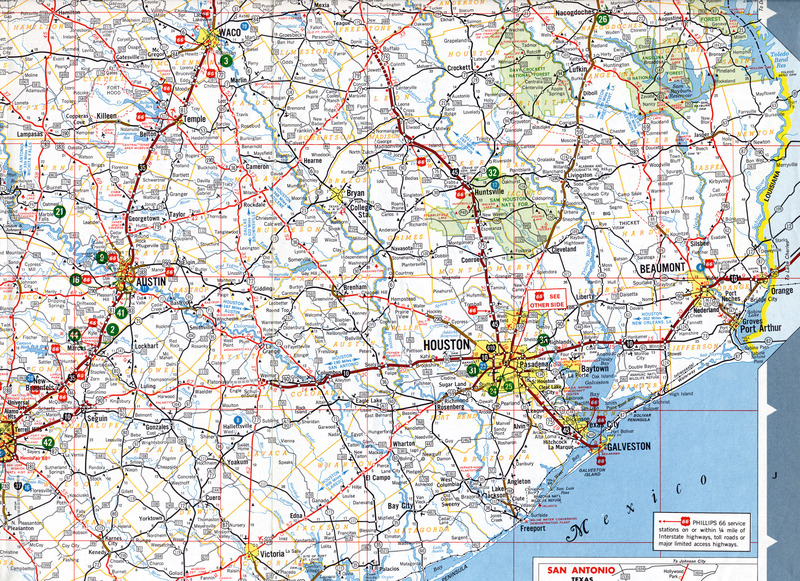 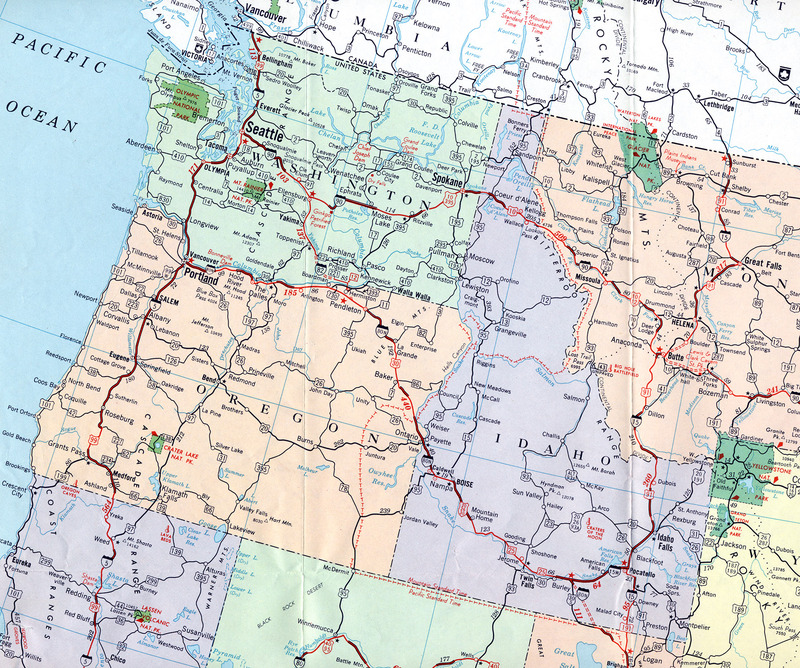 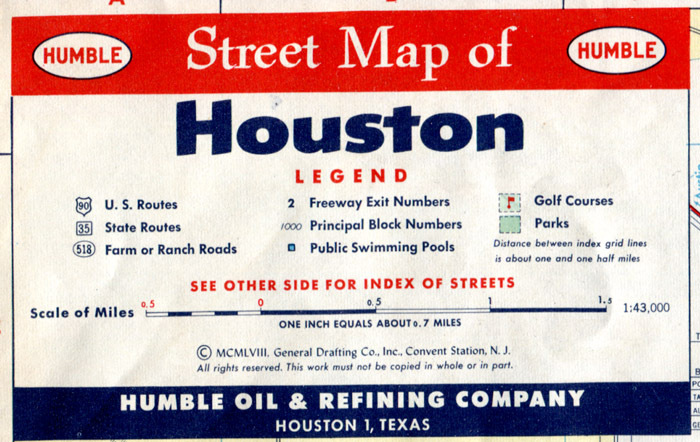 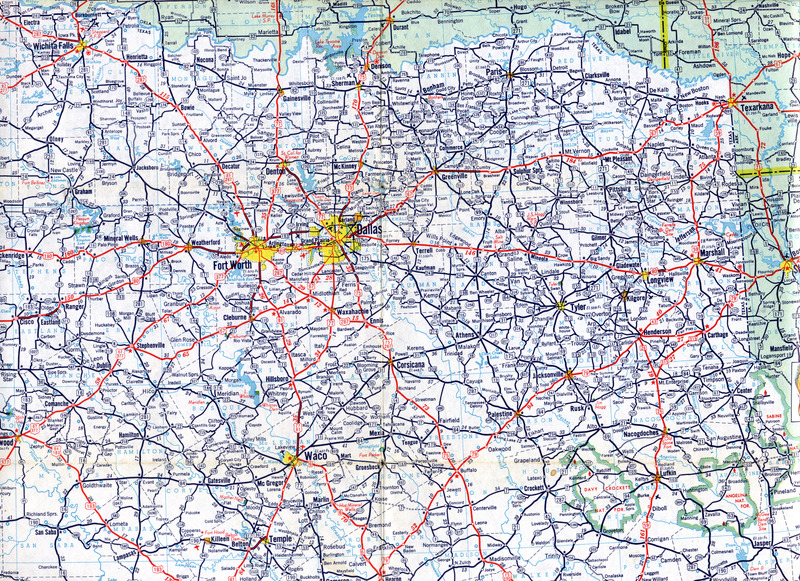 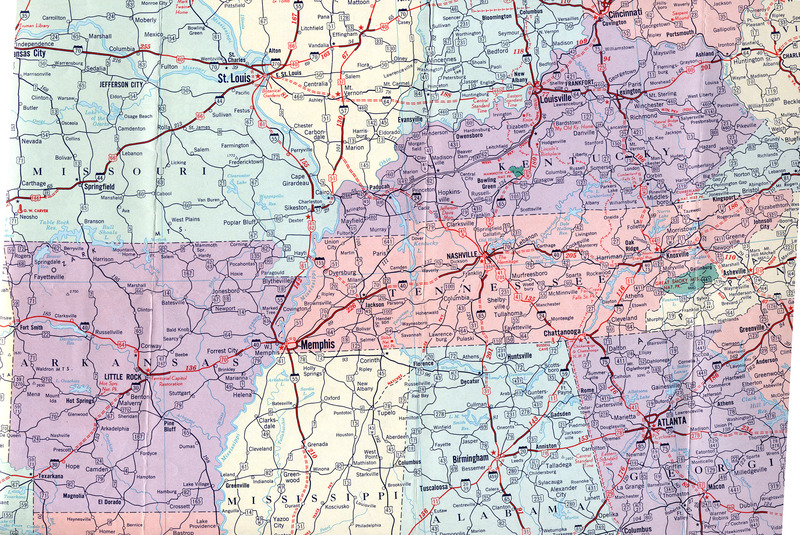 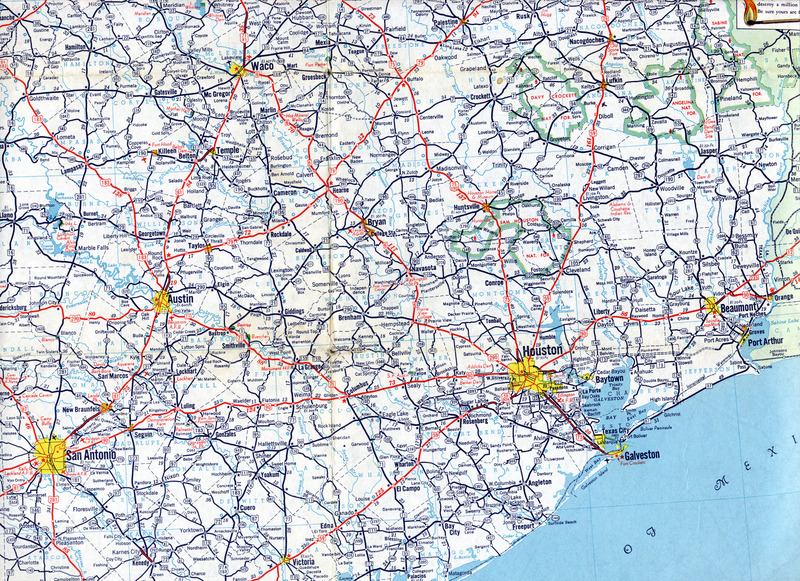 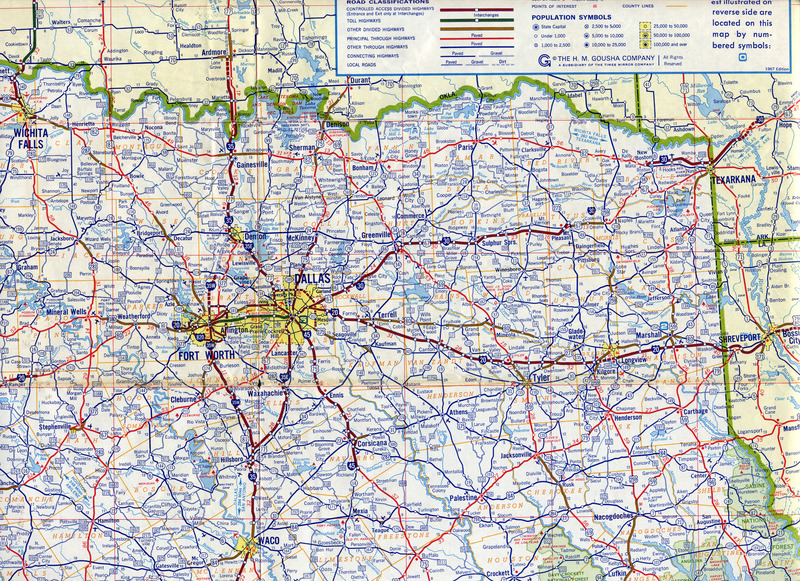 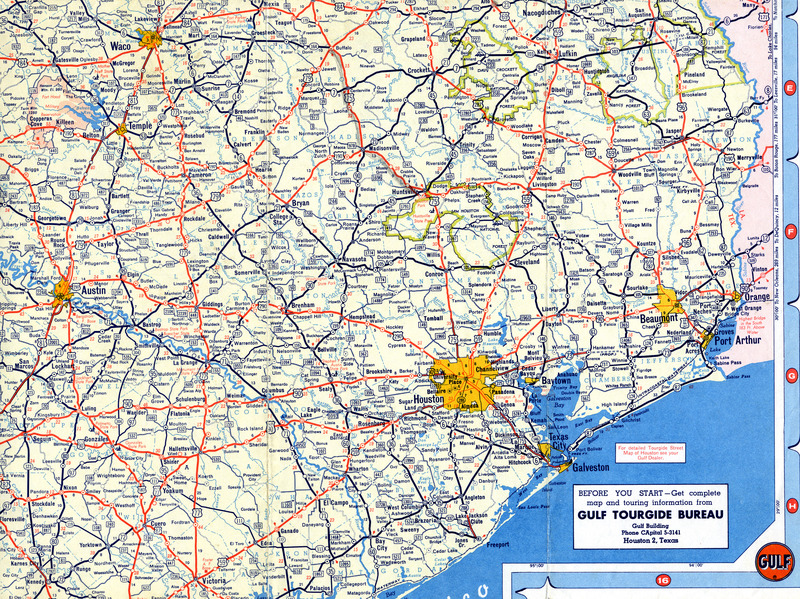 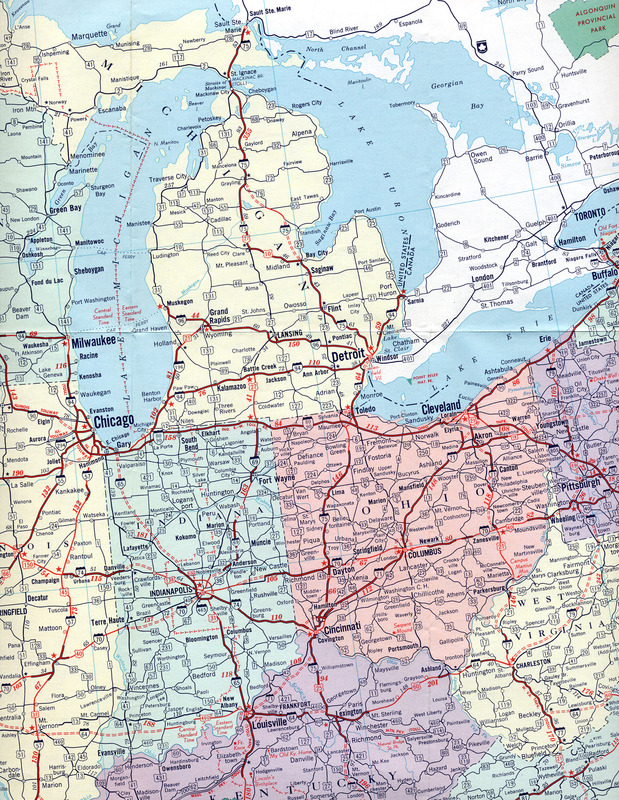 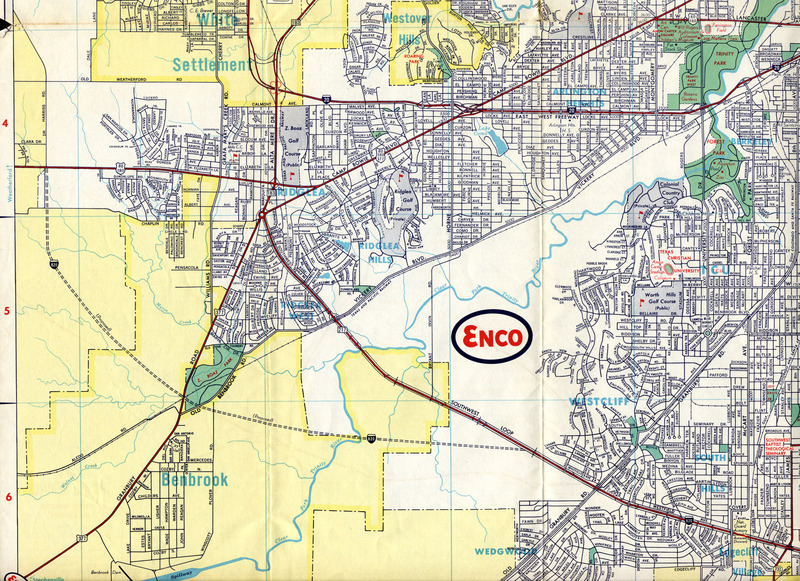 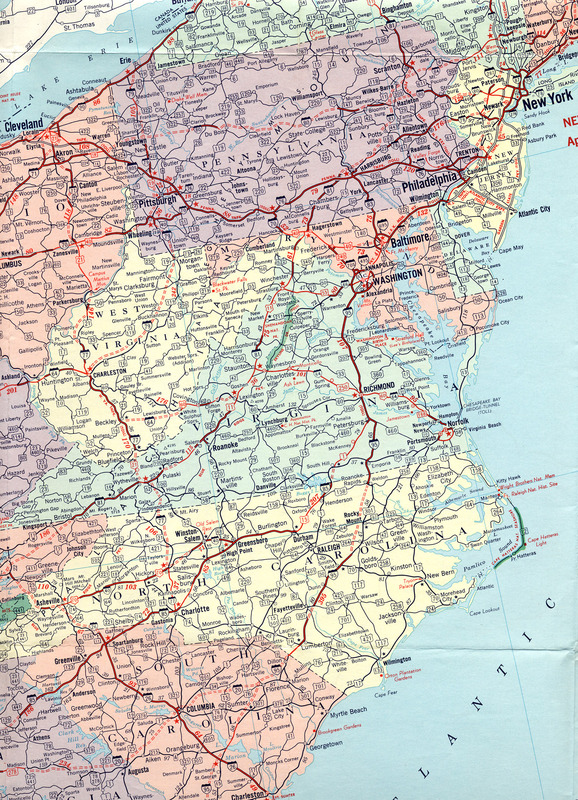 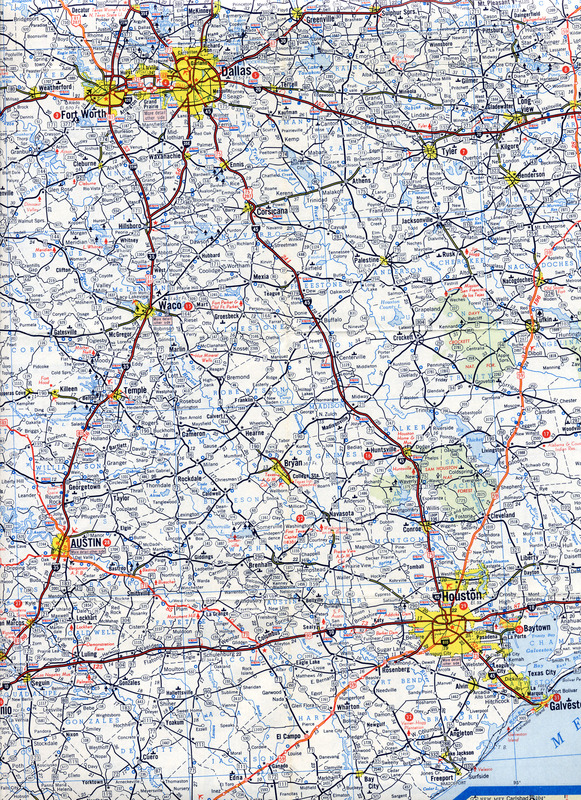 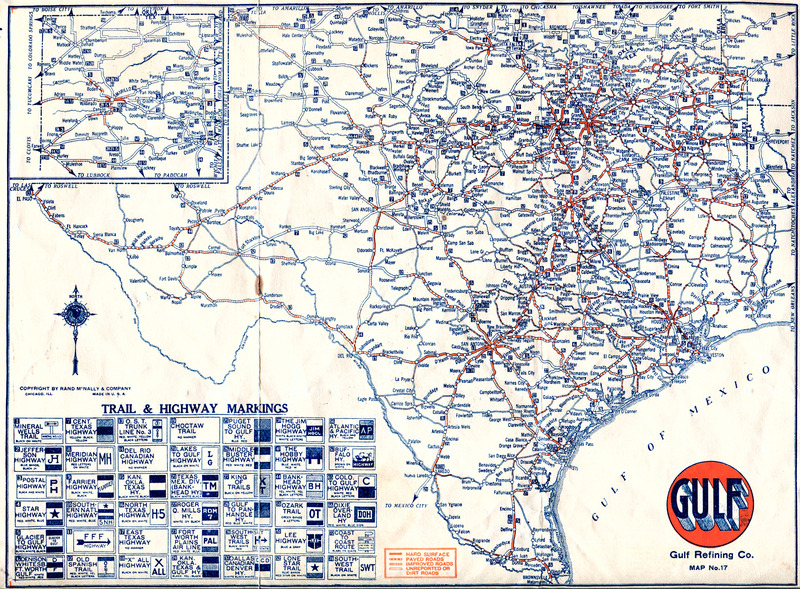 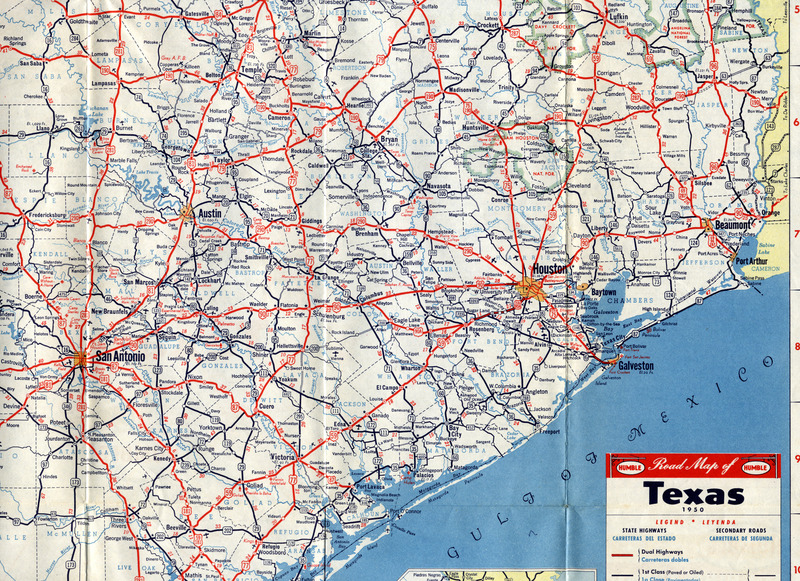 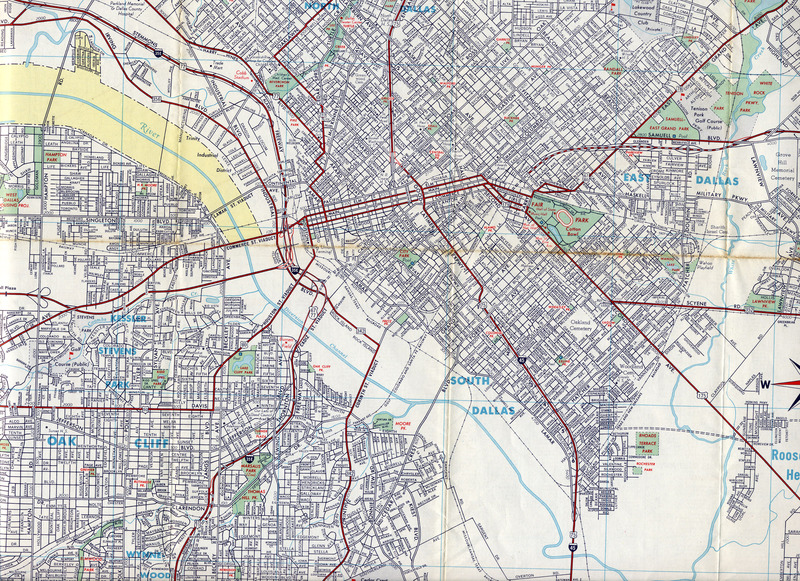 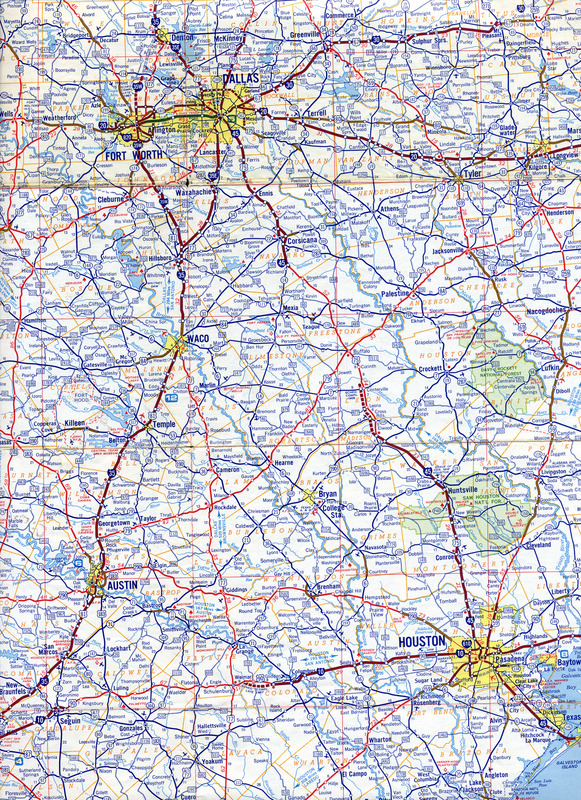 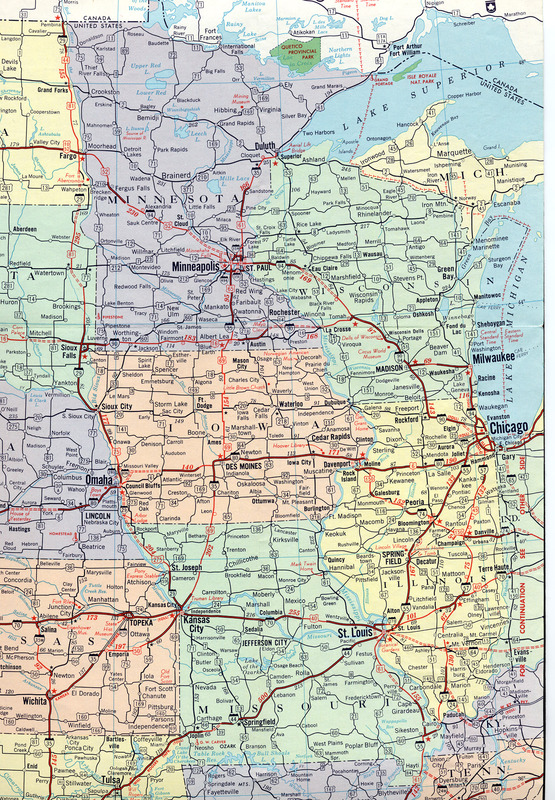 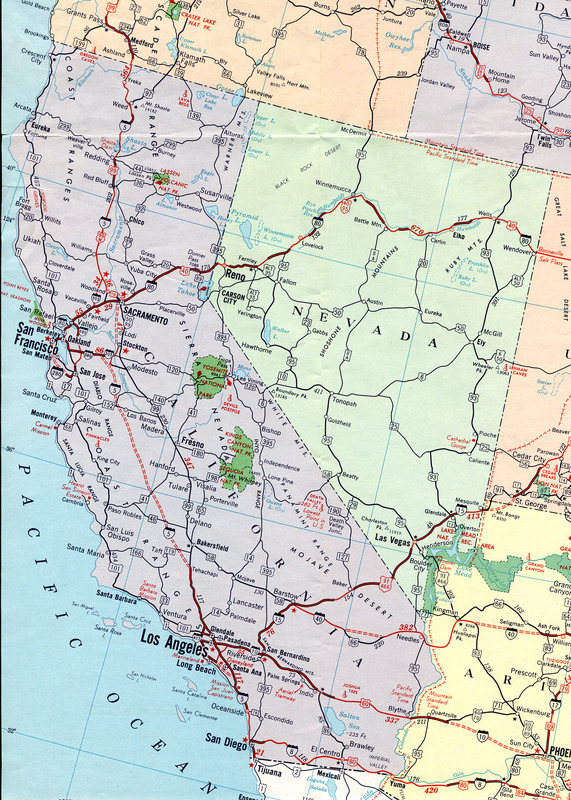 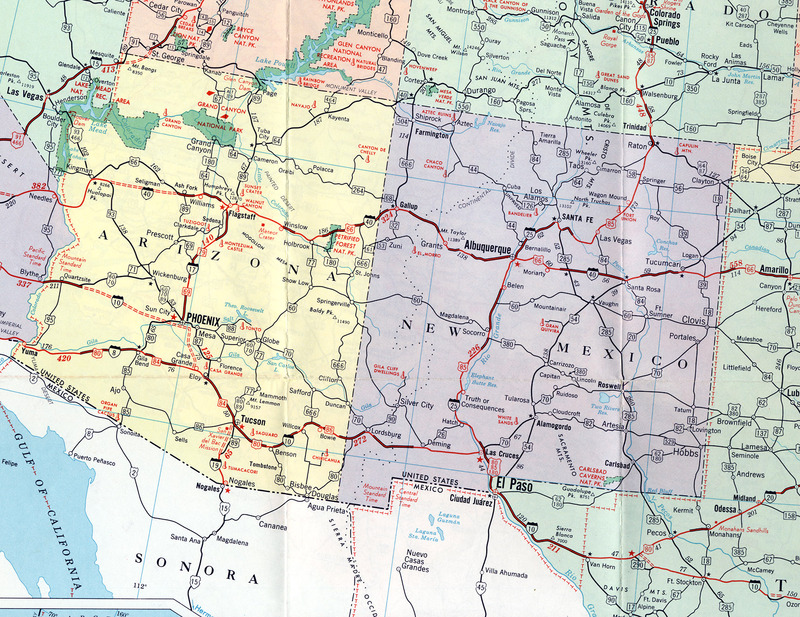 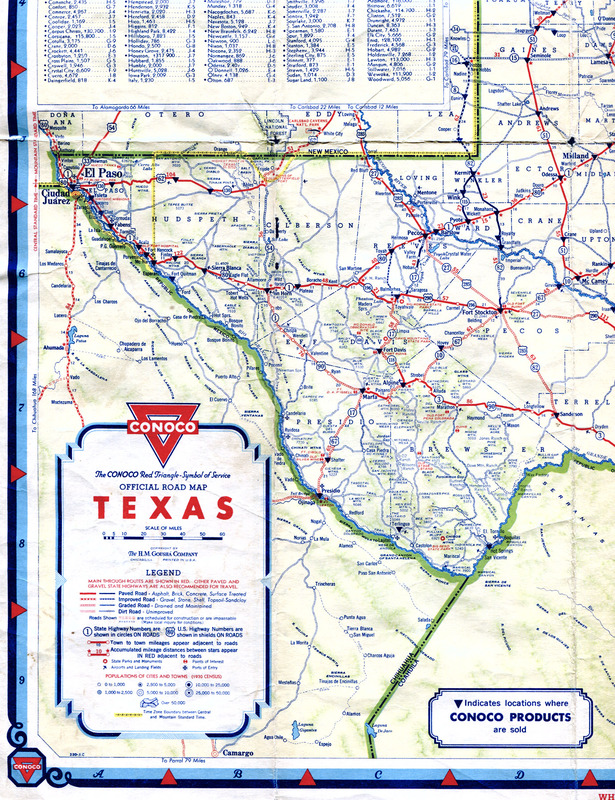 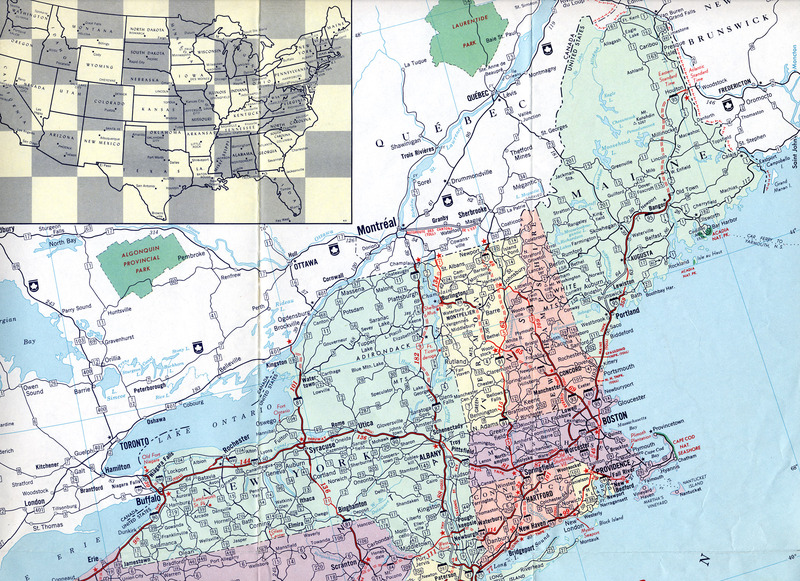 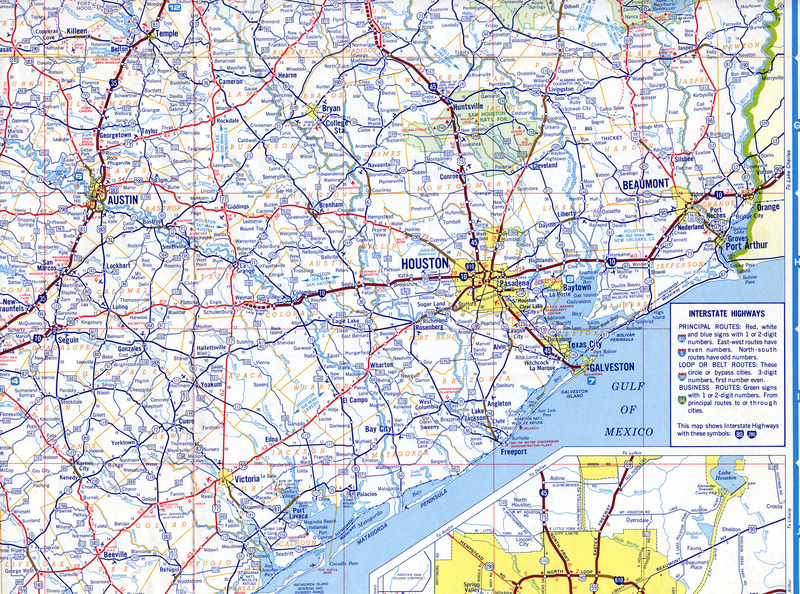 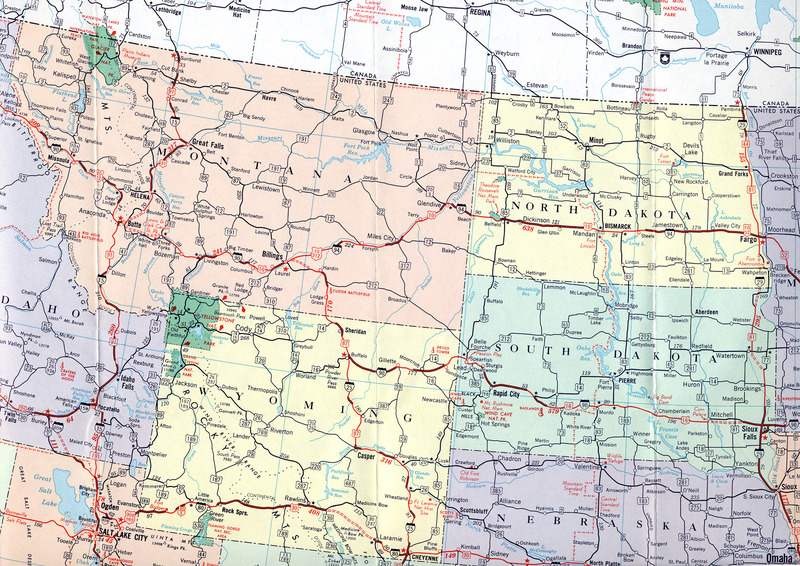 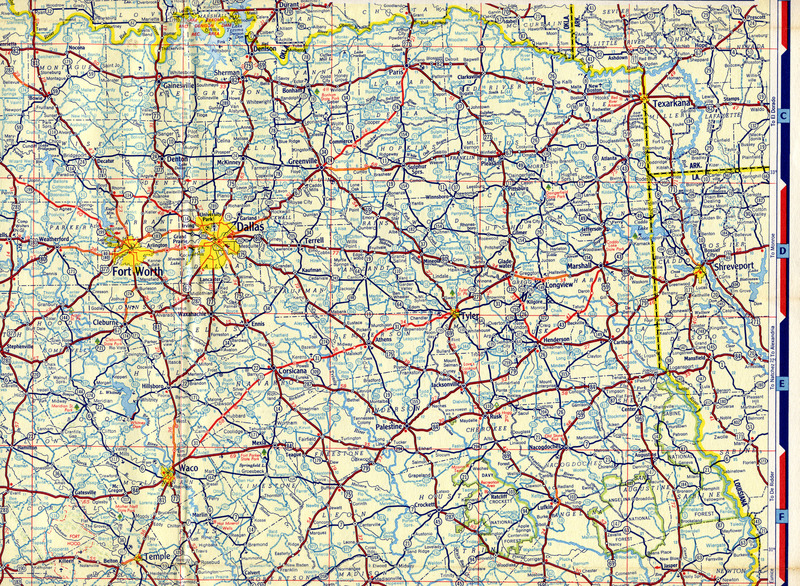 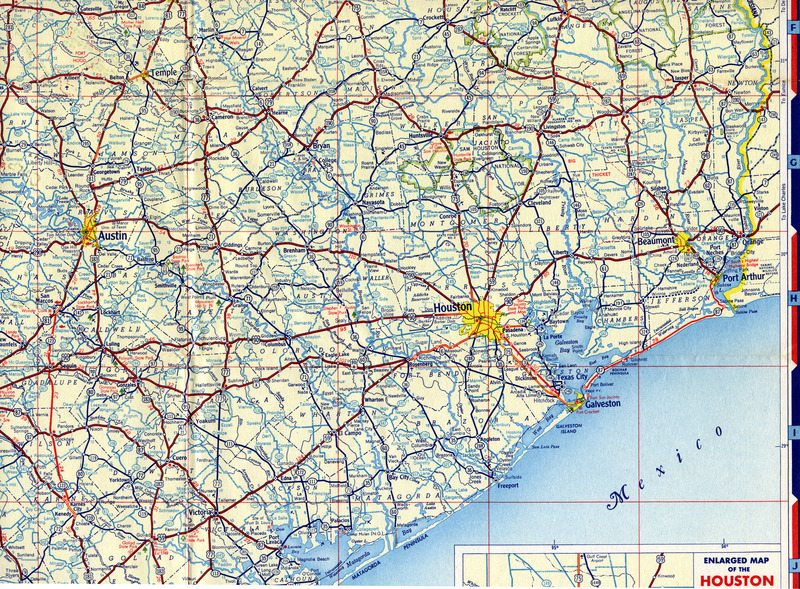 By the late 1960s, many oil company map covers were becoming very plain. 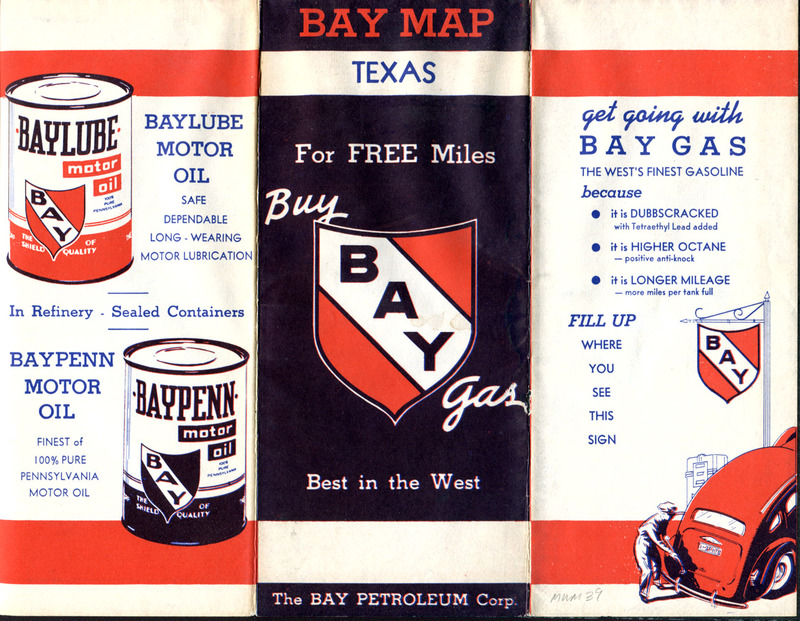 Of course, by the early 1970s most oil companies stopped providing free highway maps. 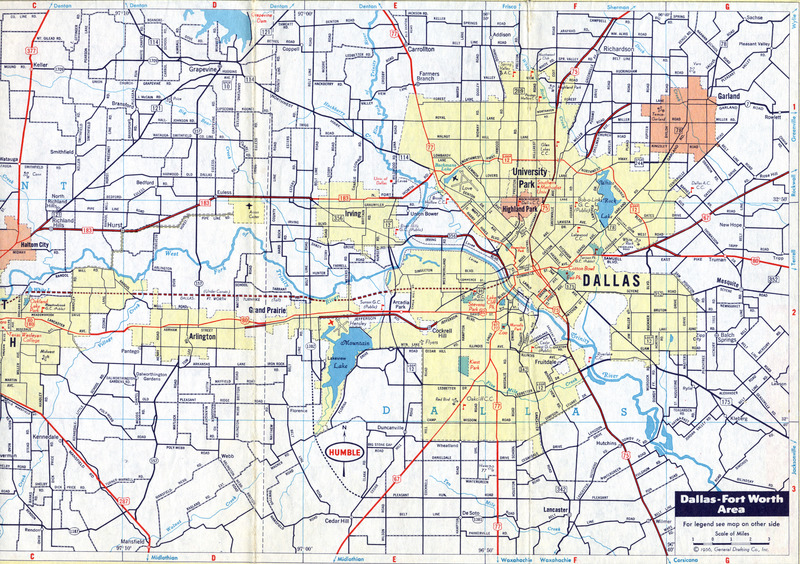 North Dallas Large I-635 (LBJ Freeway) west of Central expressway opened in 1967, and the Dallas North tollway opened in 1968. 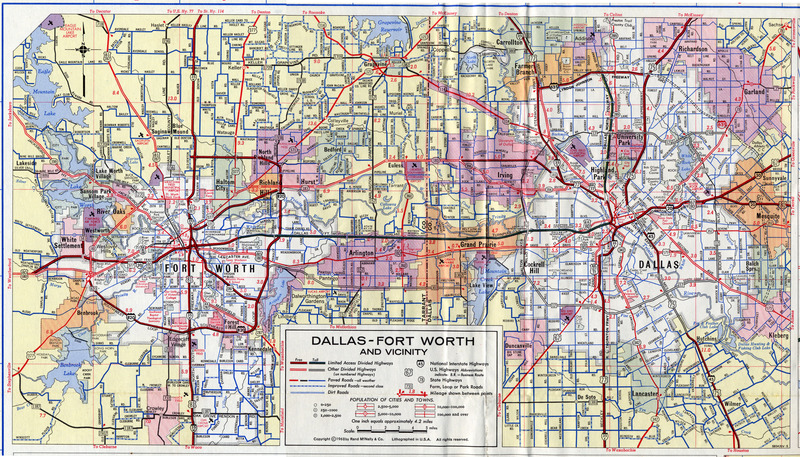 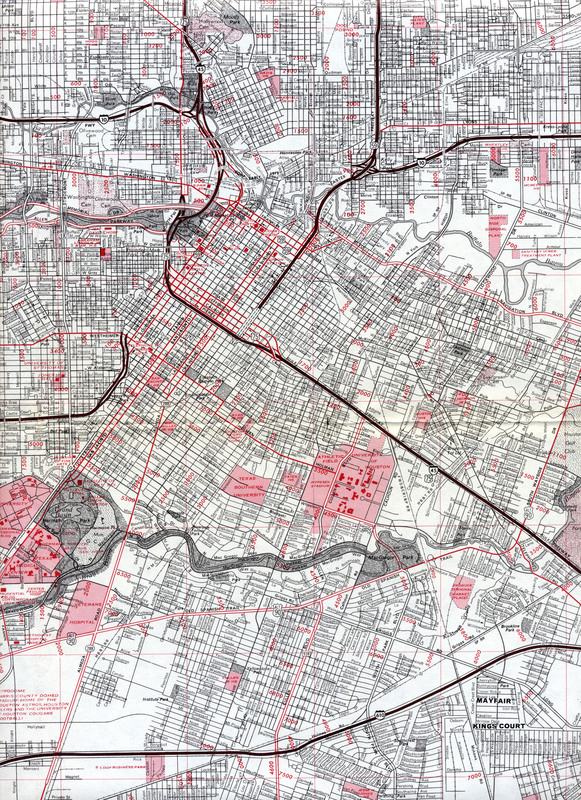 Dallas-Fort Worth Med Large This map accurately shows the status of freeways in 1968. 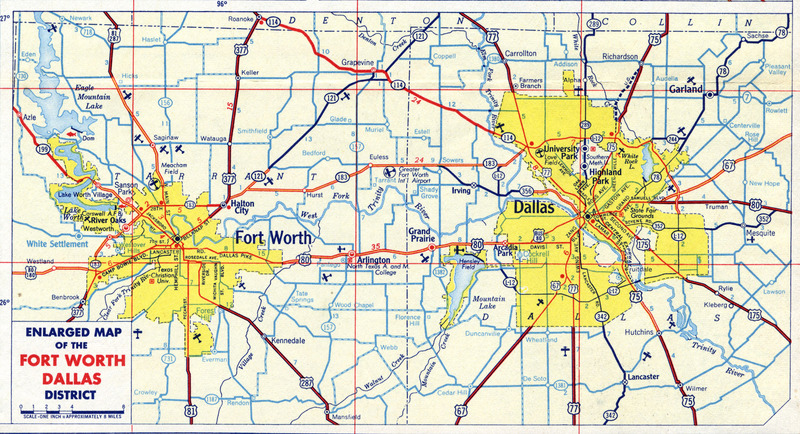 Dallas-Fort Worth Med Large This map shows the Greater Southwest Airport just south of present-day DFW. 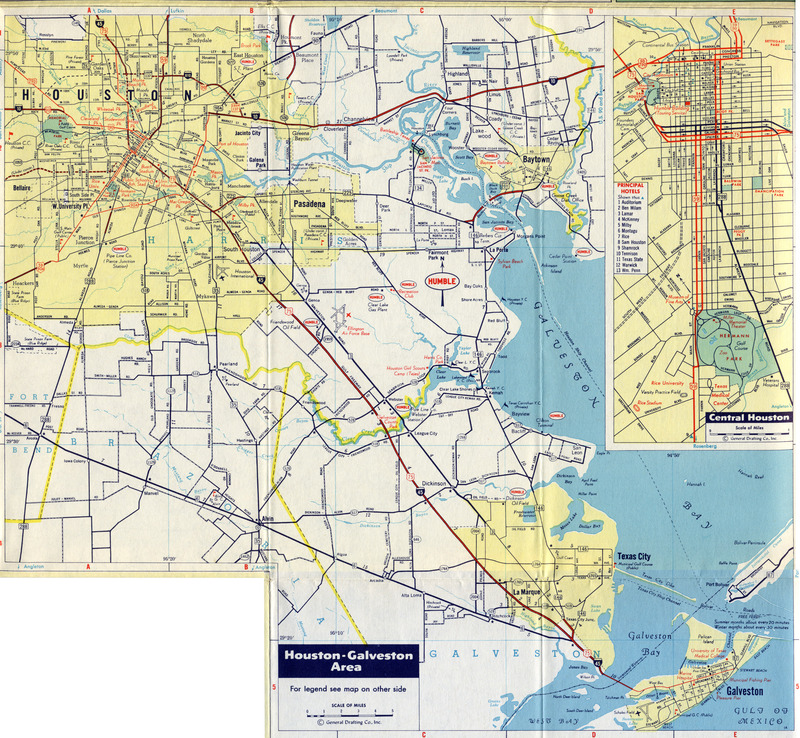 Houston Central Med Large This map shows the planned route of the entire Beltway 8 Loop. 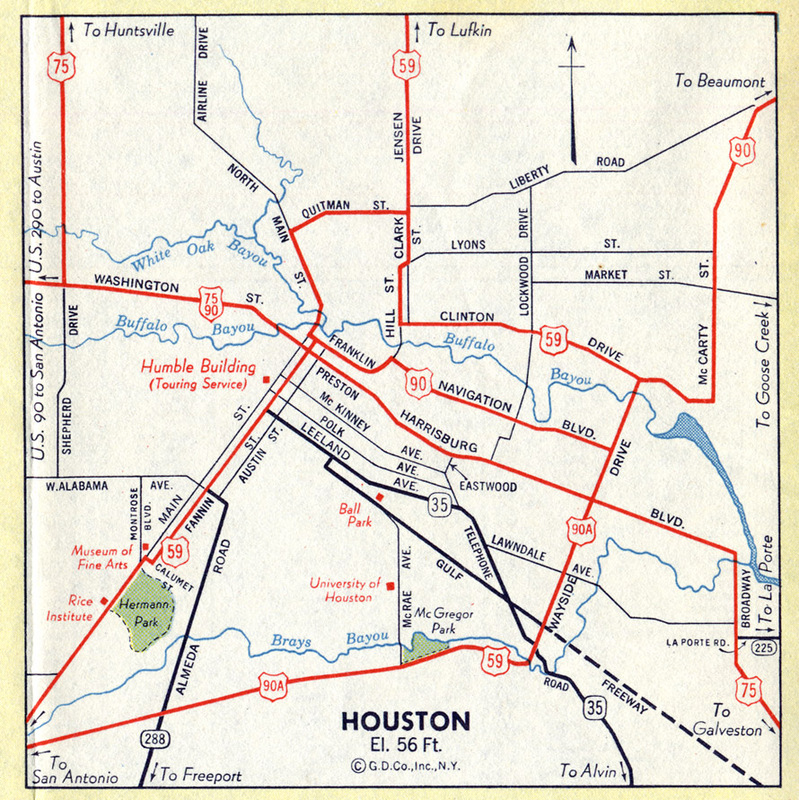 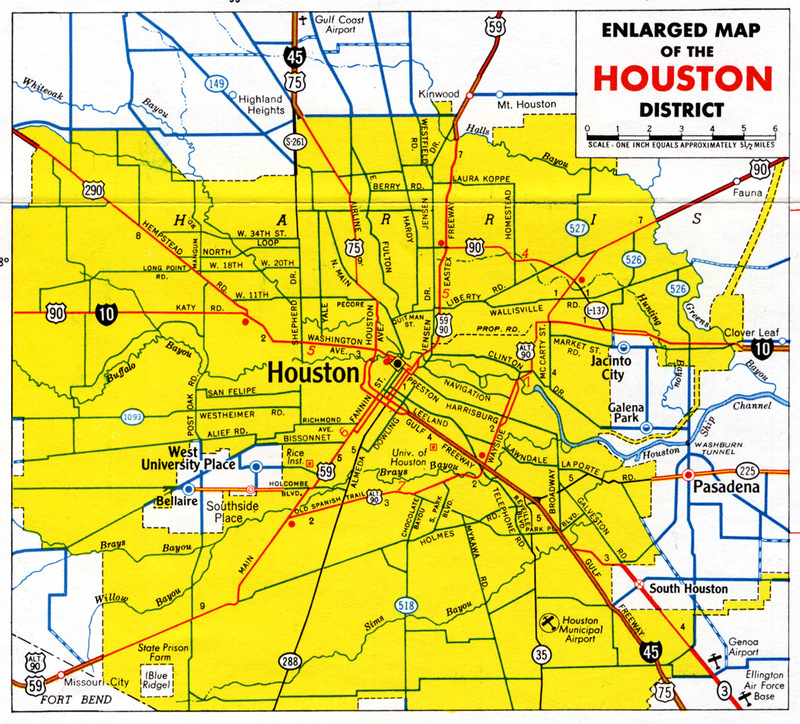 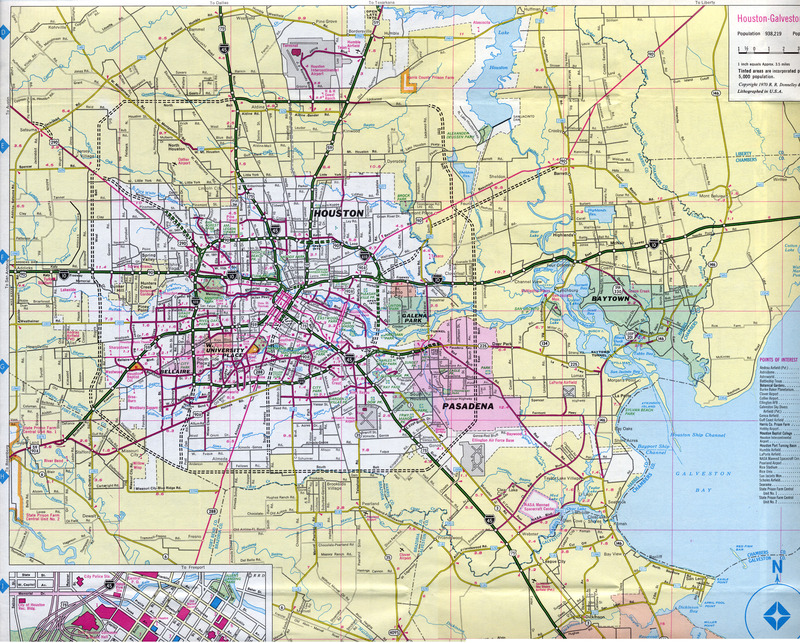 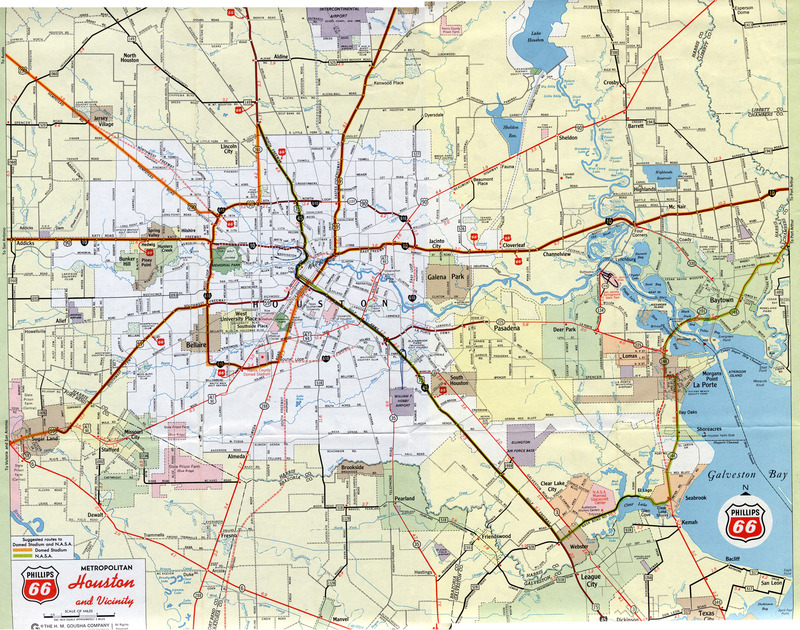 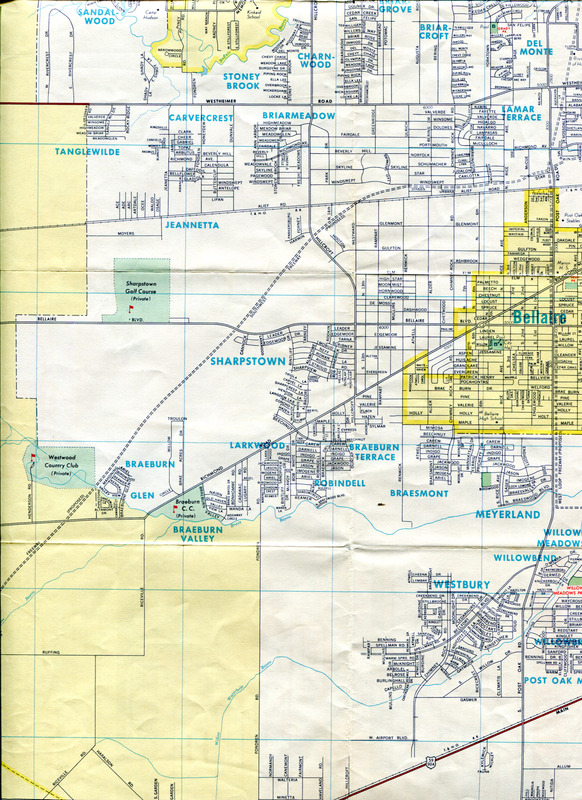 It also shows the planned southward extension of the West Loop, which was later cancelled and subsequently reinstated as the Fort Bend Parkway toll road. 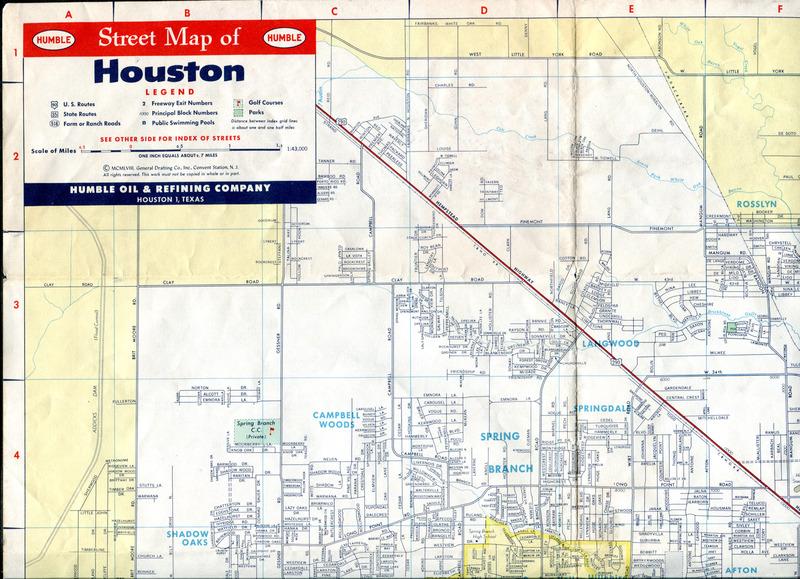 In northeast Houston, the planned route of the US 90 Crosby Freeway is shown. 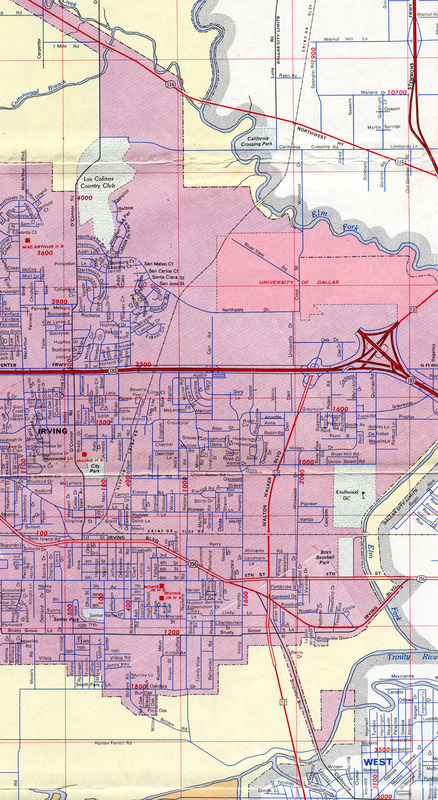 That freeway inside BW 8 began construction in 2006 and remains under construction in 2008. 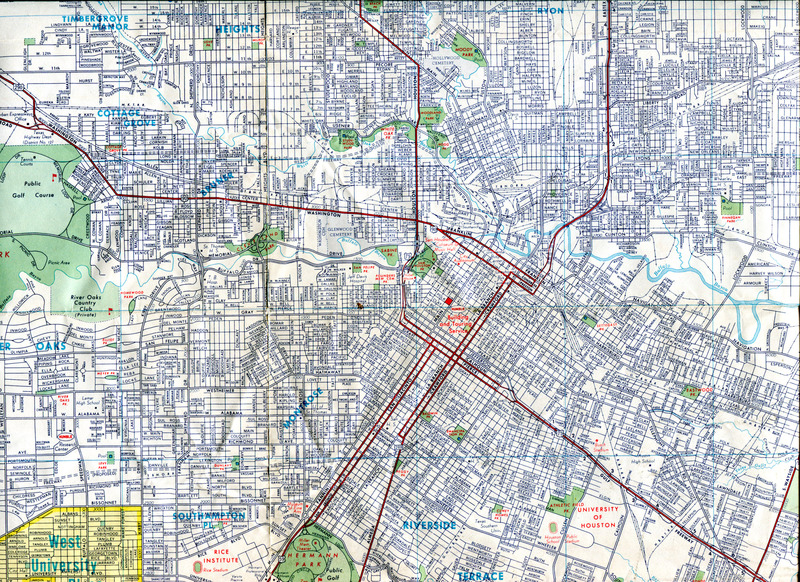 Central Houston Large This shows I-10 on the north side of downtown under construction. 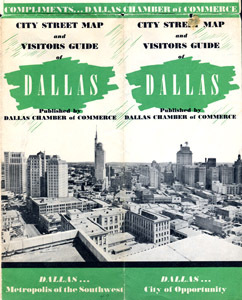 It opened on May 17, 1972. 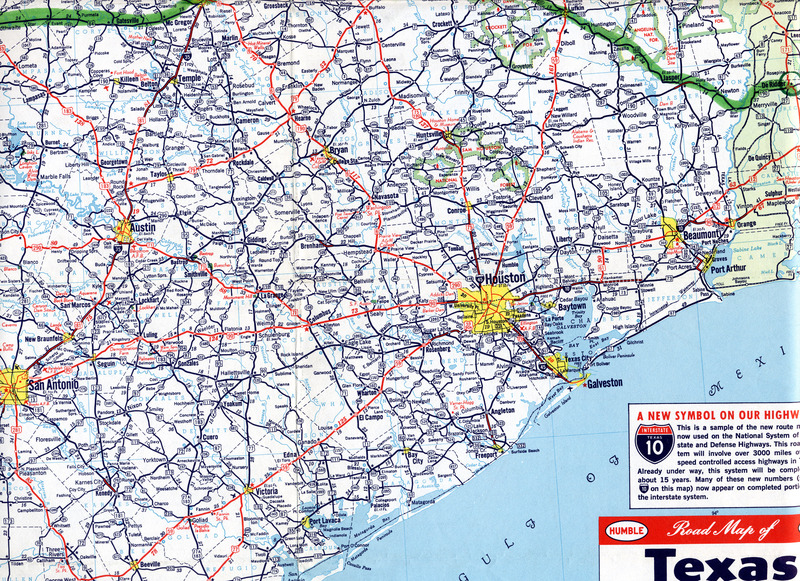 This map does not show any work in progress on the missing link of US 59, which was just getting started in 1972. 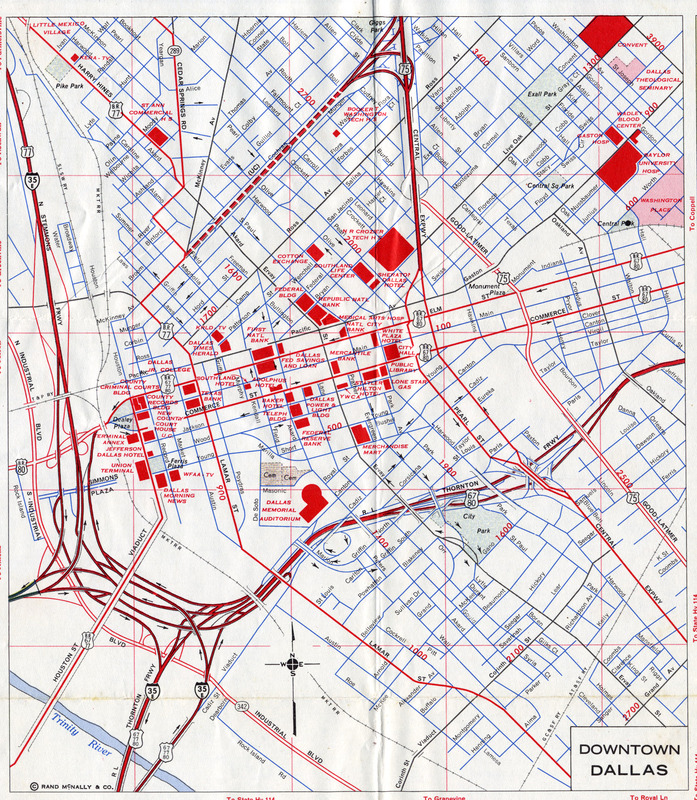 The great freeway-building binge of the 1960s was over, but there were still plenty of missing links and unbuilt freeways that would need to wait for funding in an era of greatly diminished resources for highway construction. 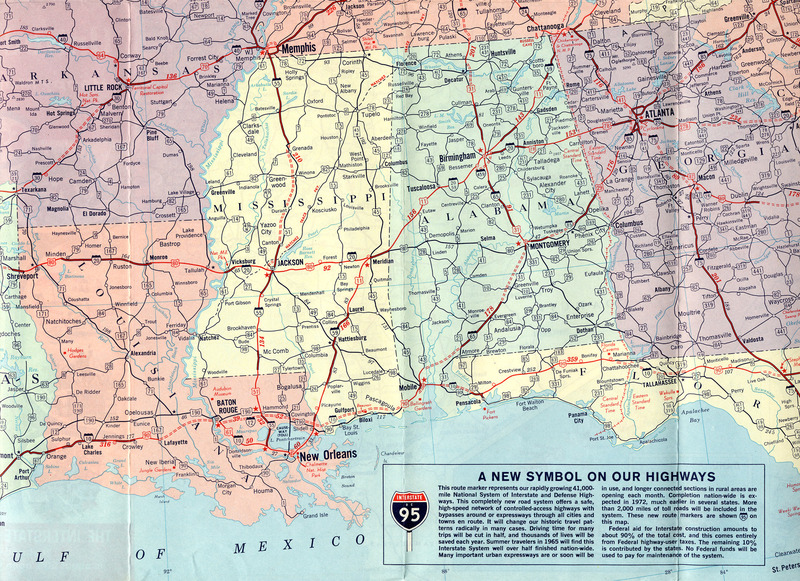 As highway construction slowed, my observation is that map companies updated their maps less frequently and therefore maps were more likely to have errors or be out-of-date. 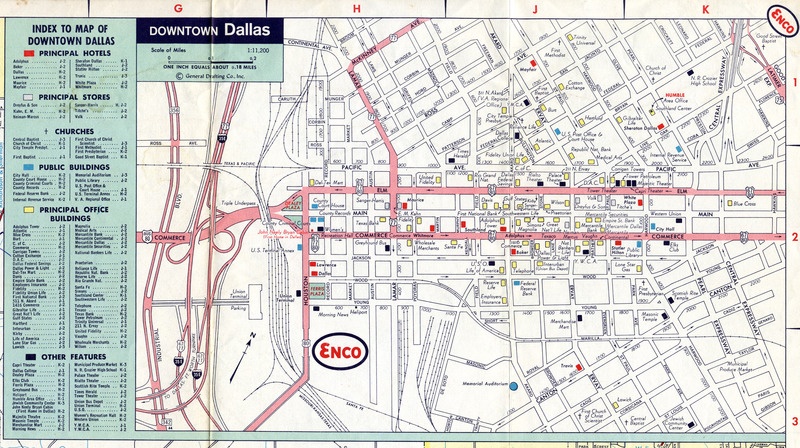 However, this 1973 Exxon map is quite accurate. 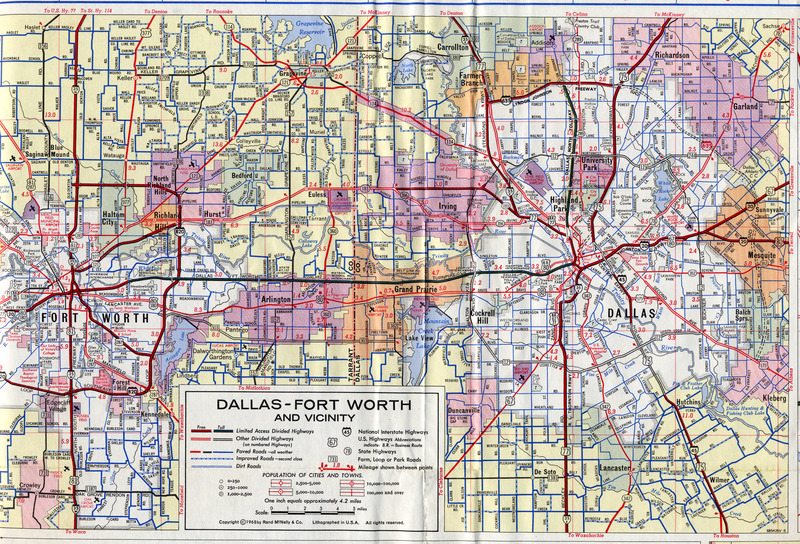 Dallas-Fort Worth Med Large The freeway systems of Dallas and Fort Worth are substantially complete, but the mid-cities are is still largely devoid of freeways and would be the focus of efforts in the 1970s, 1980s, and 1990s. 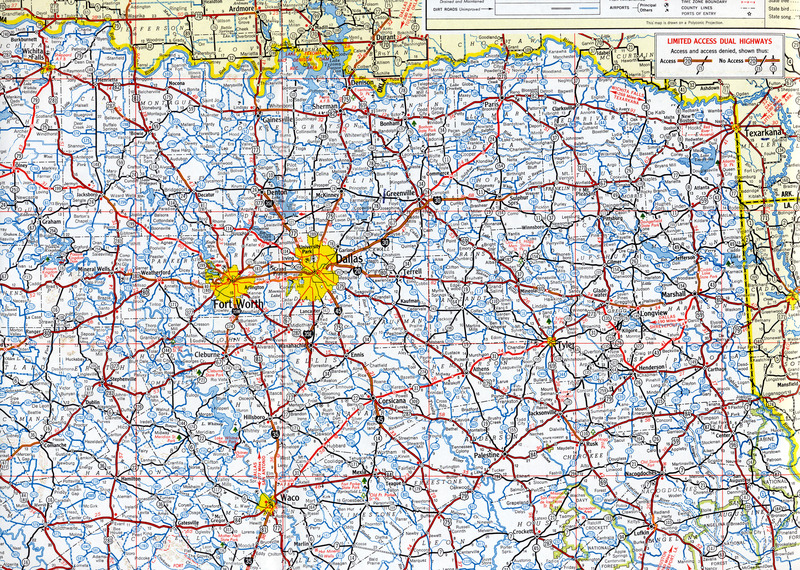 Central Texas Med This view shows the main population center of Texas and shows all interstates completed except for a section of I-20 west of Fort Worth. 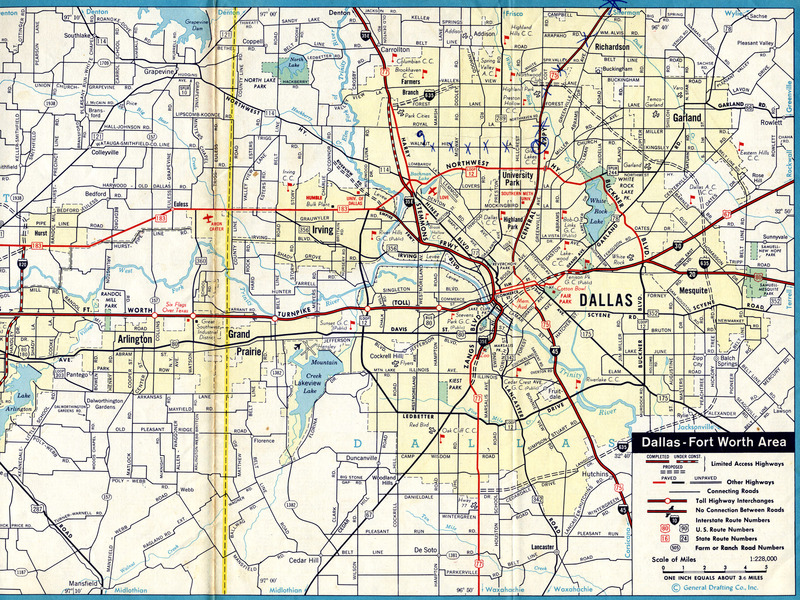 I-45 between Dallas and Houston was completed in 1971. 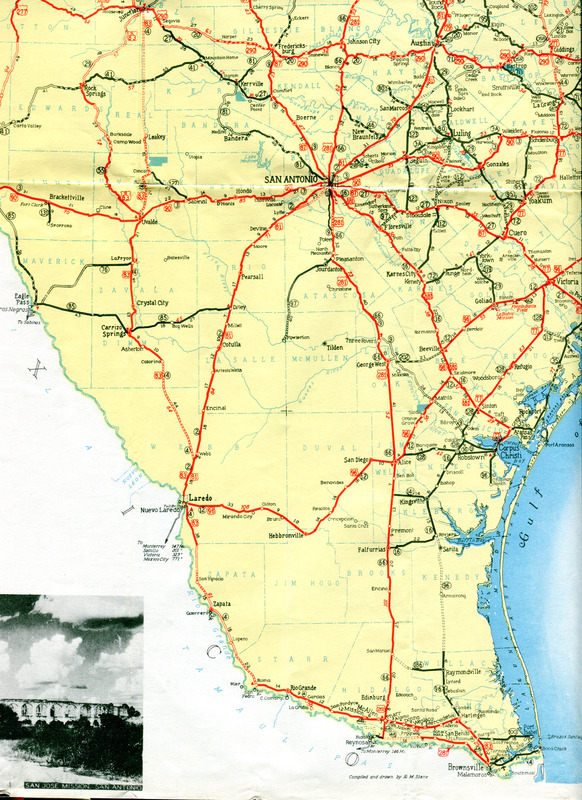 The last section of I-10 between Houston and San Antonio, from Waelder to TX 304, was completed in March 1972. 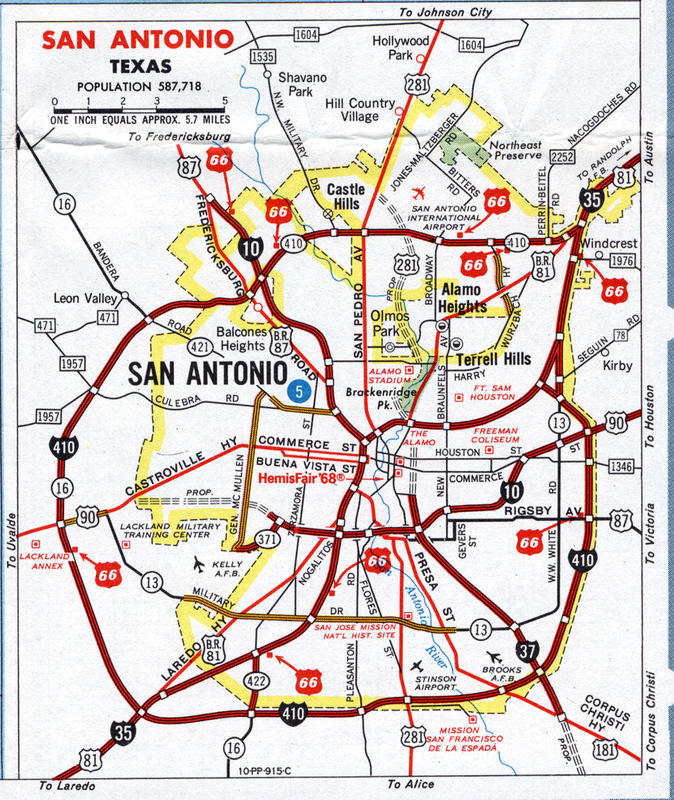 San Antonio Med All central freeways were complete except for US 281 heading north out of downtown. 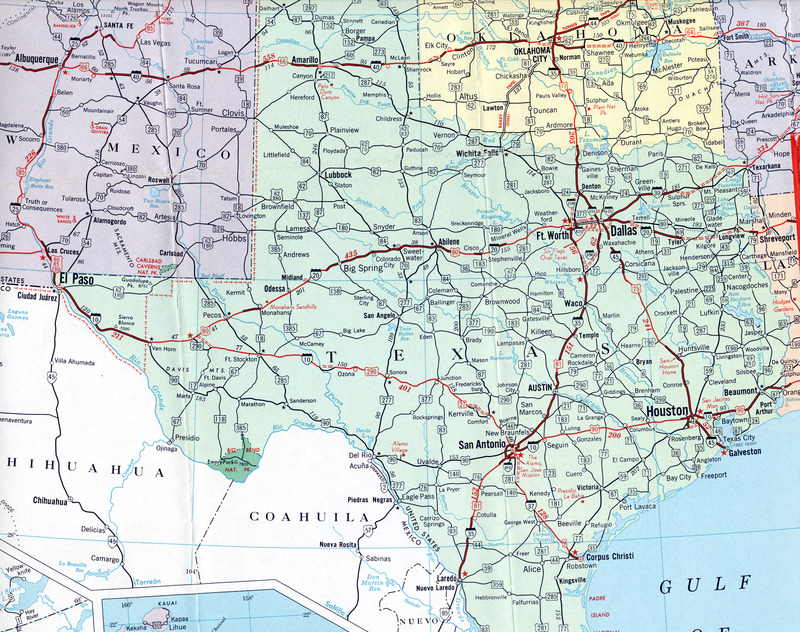 I-10 West Texas Med A substantial amount of work remained to be done on I-10 in west Texas. 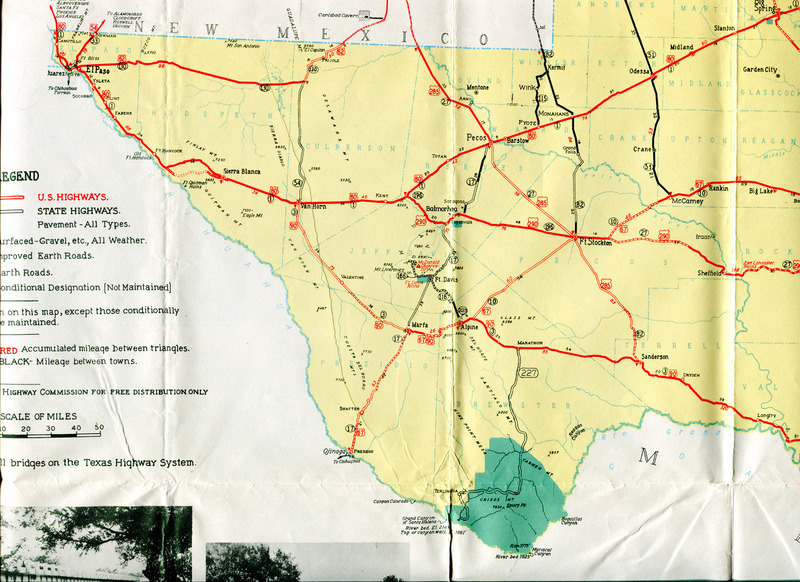 Work continued in the 1970s and into the 1980s, with completion of the final link at Fort Stockton in May 1983.